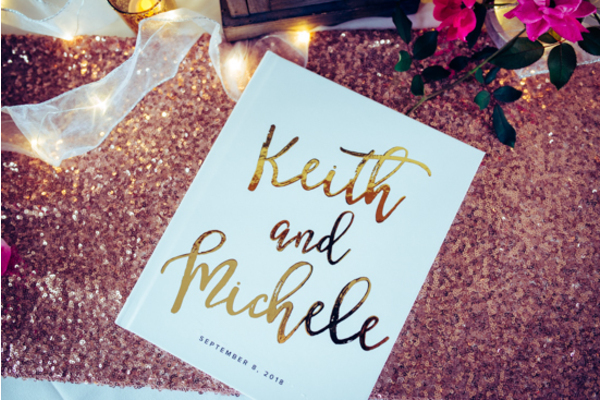 Congratulations to Michele and Keith on their dream wedding day! 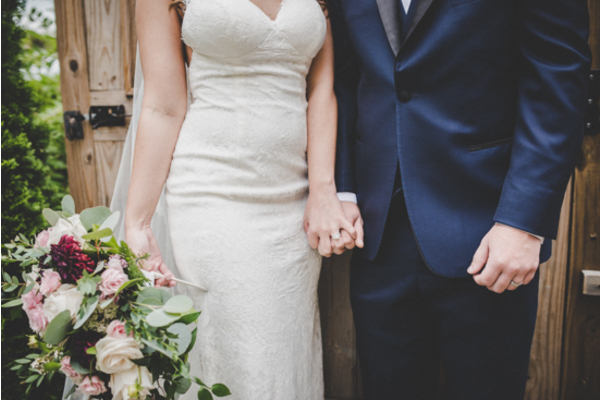 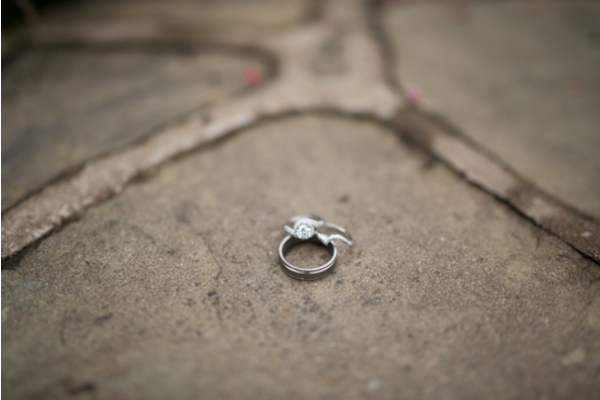 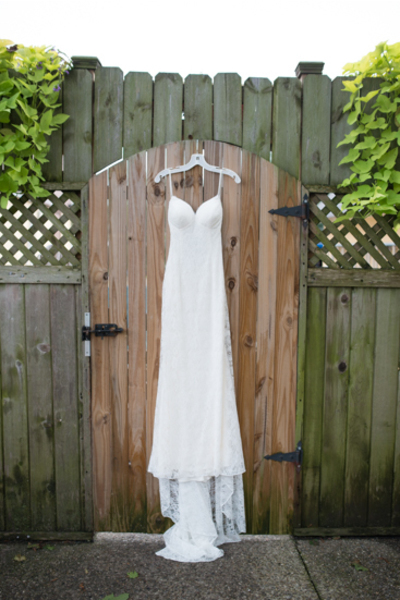 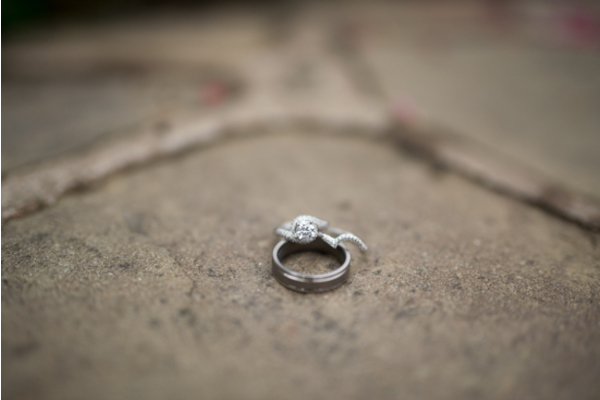 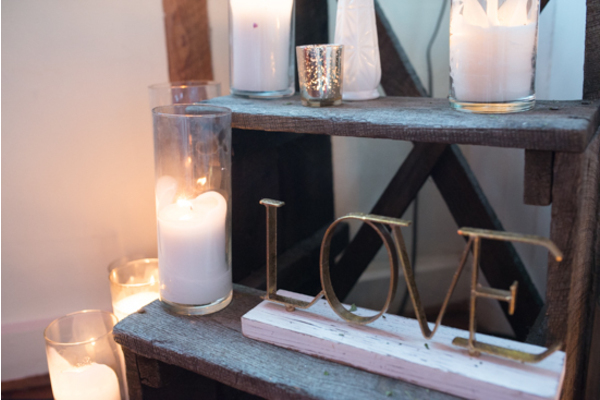 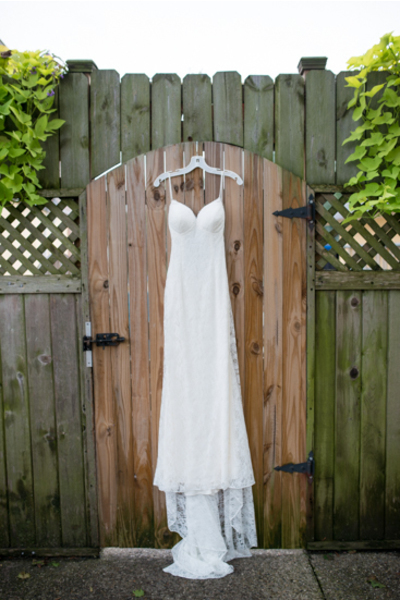 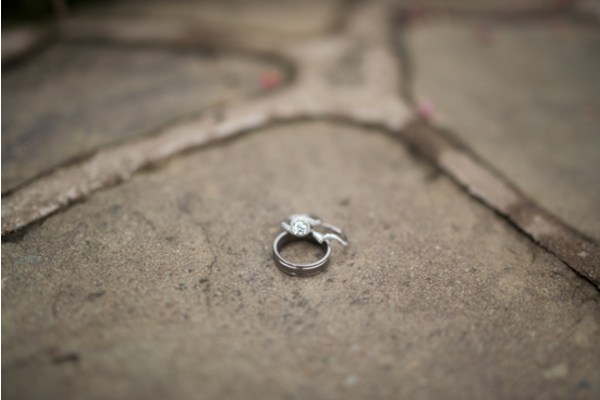 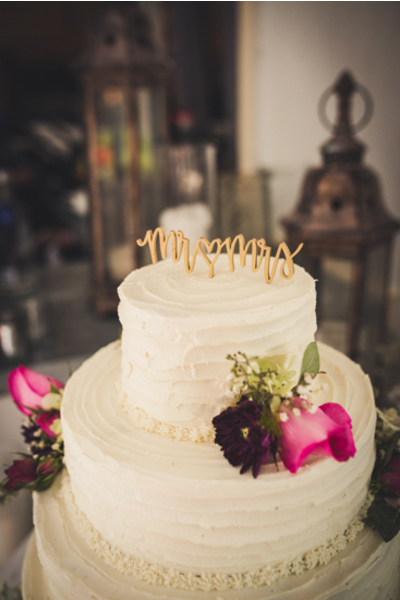 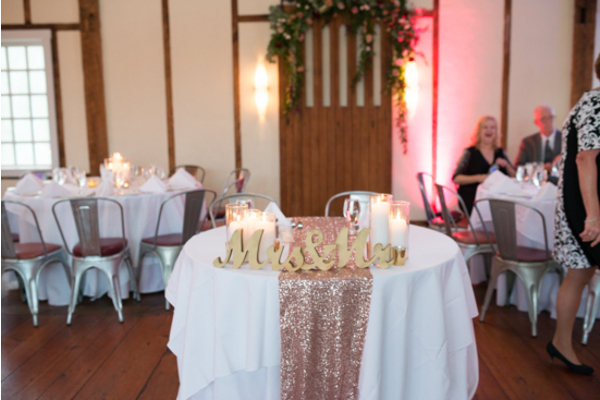 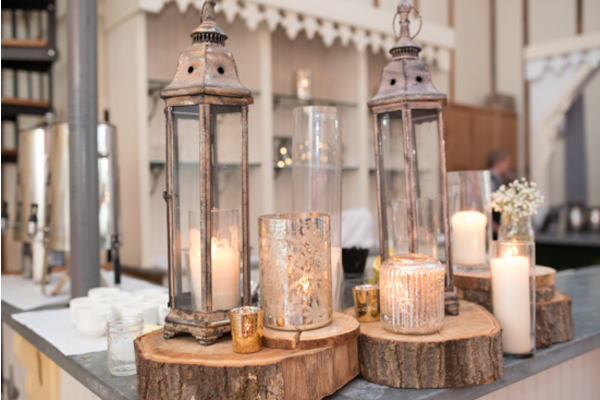 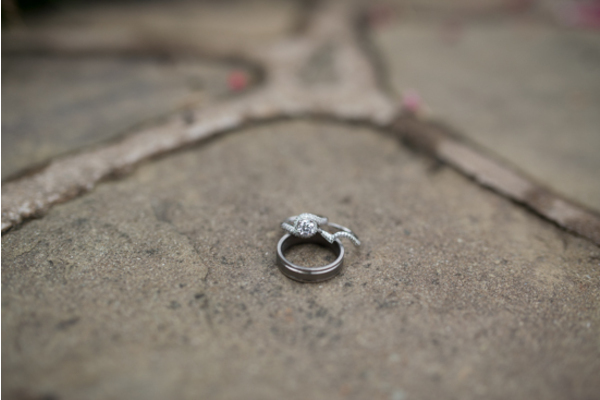 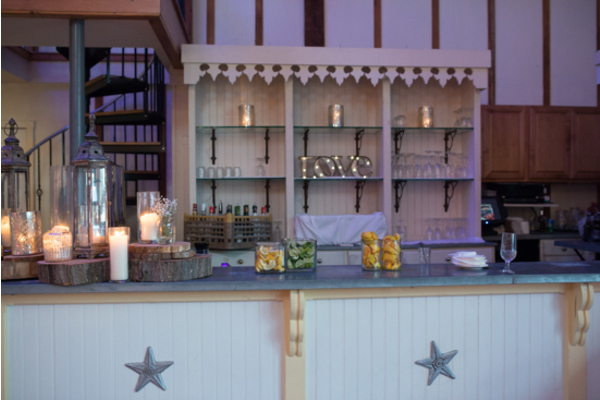 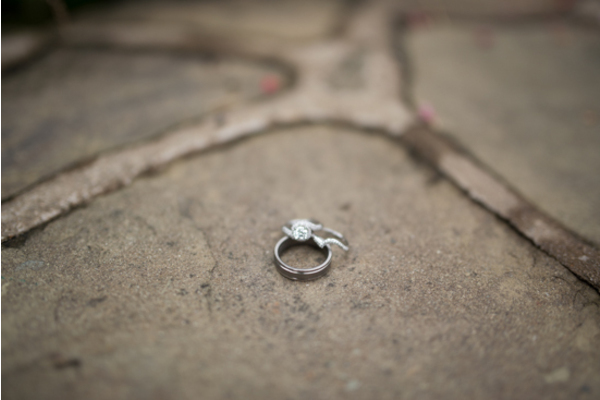 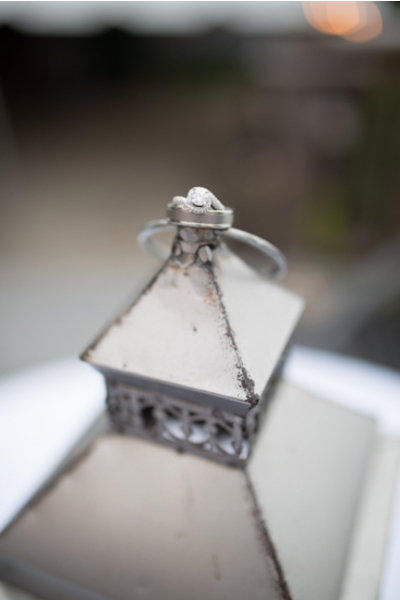 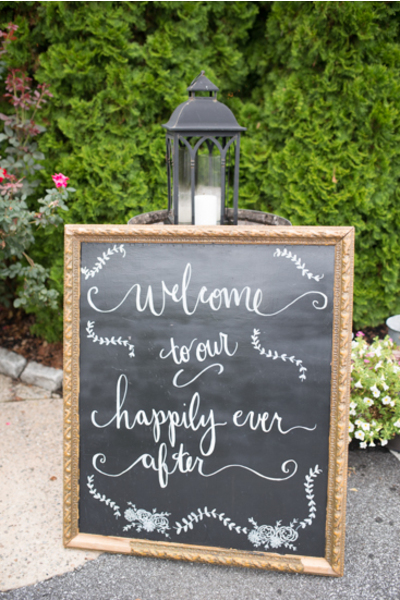 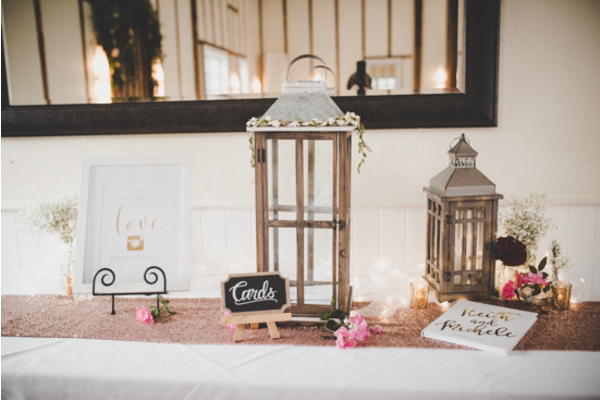 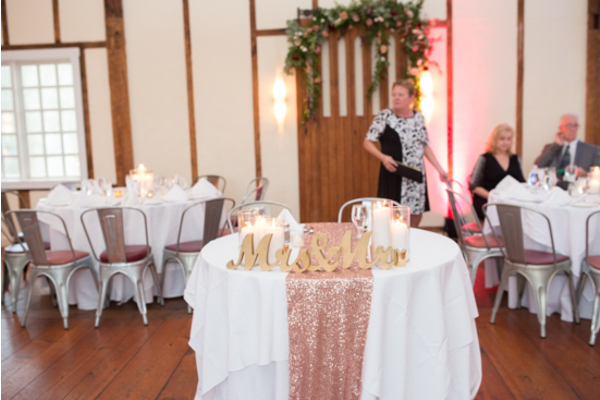 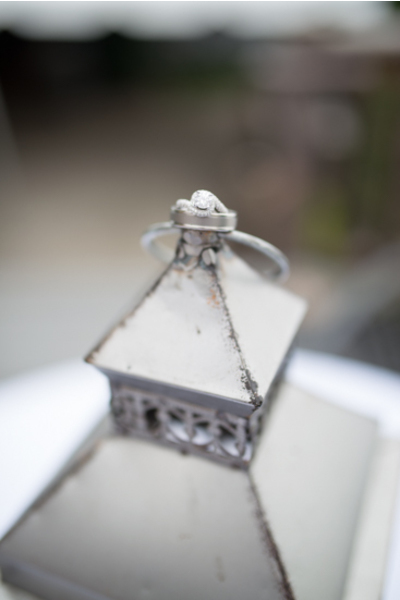 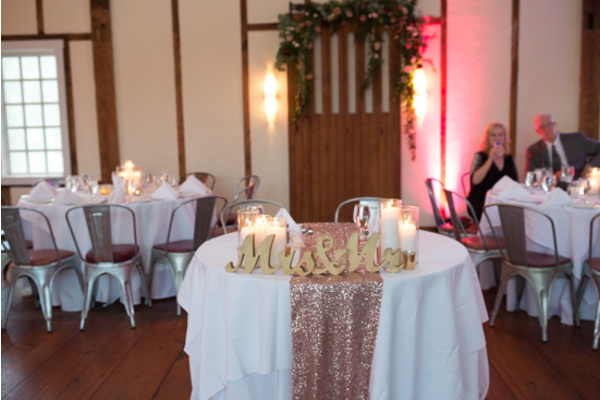 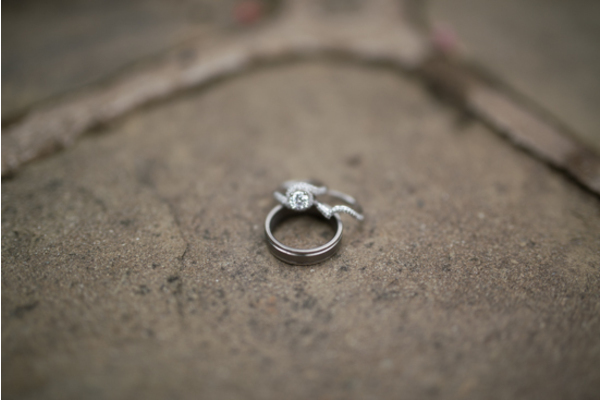 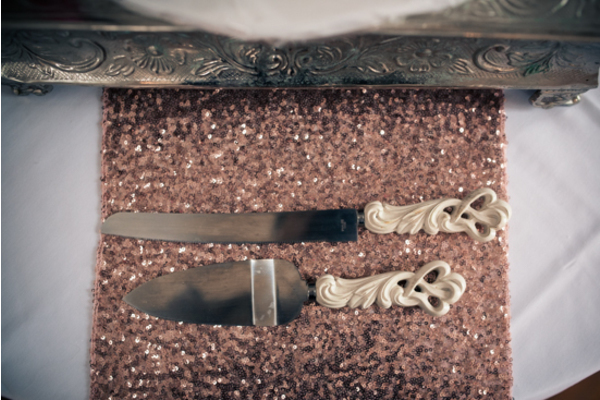 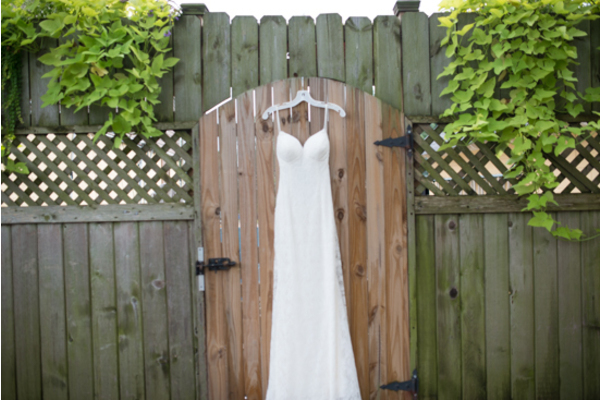 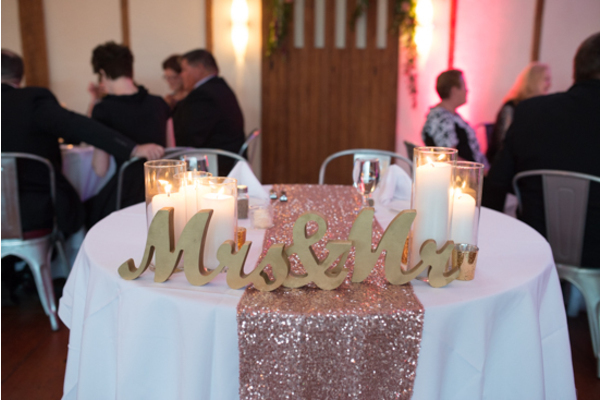 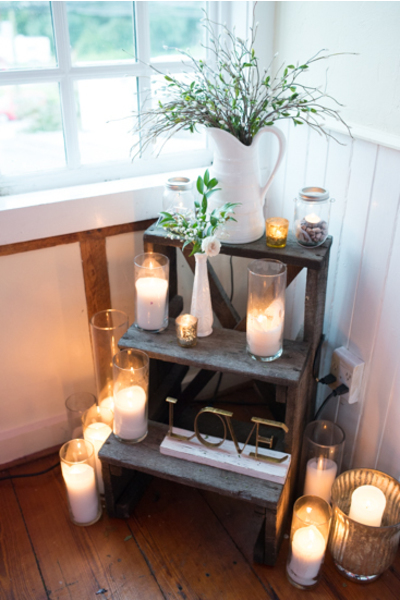 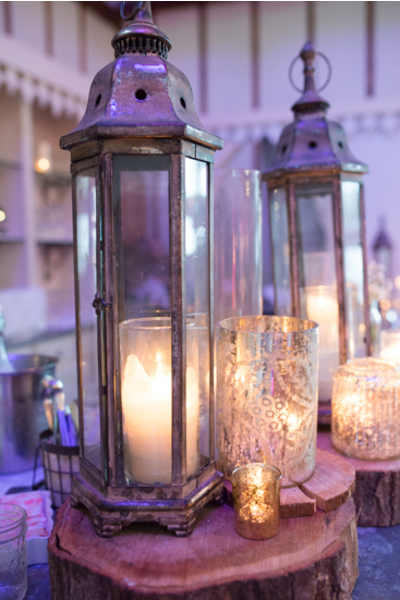 If you are looking to have a magical, rustic wedding, these two did it right! 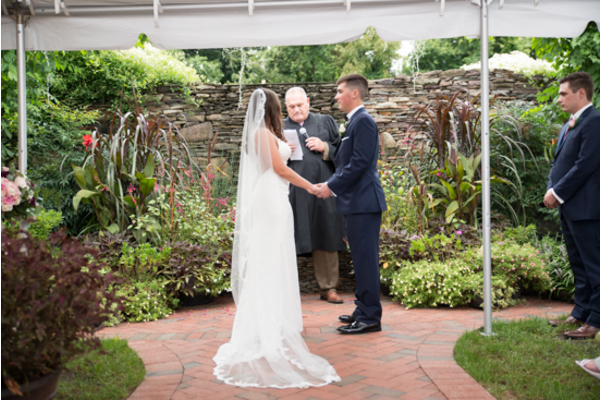 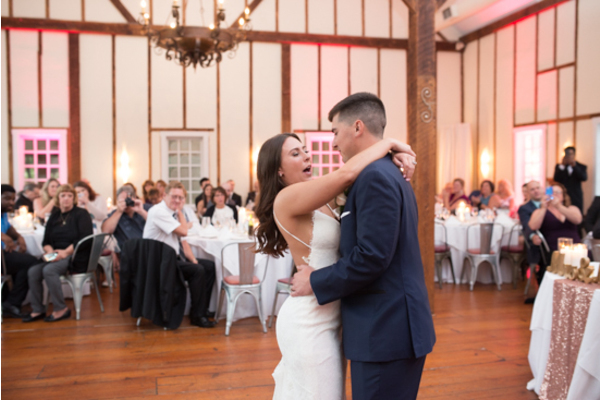 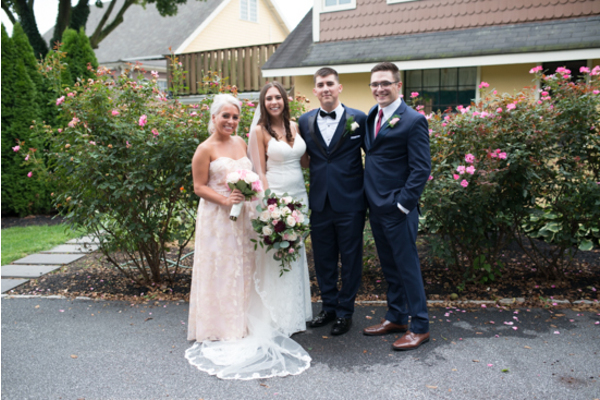 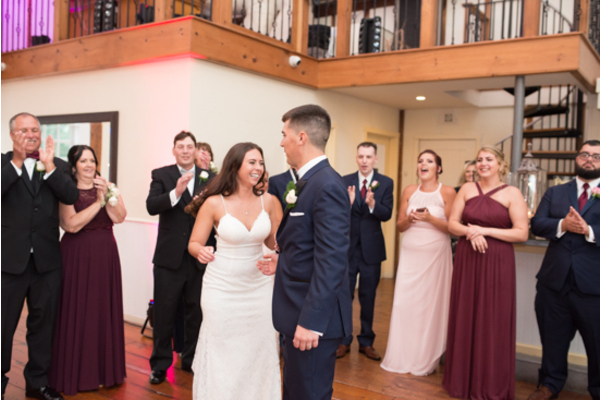 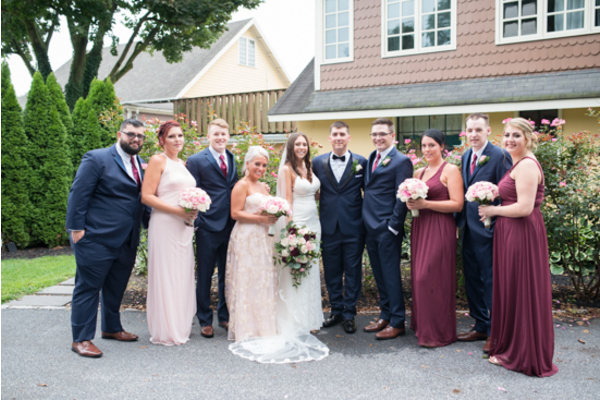 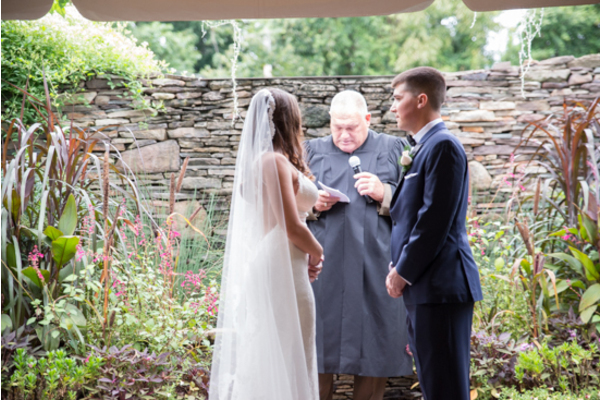 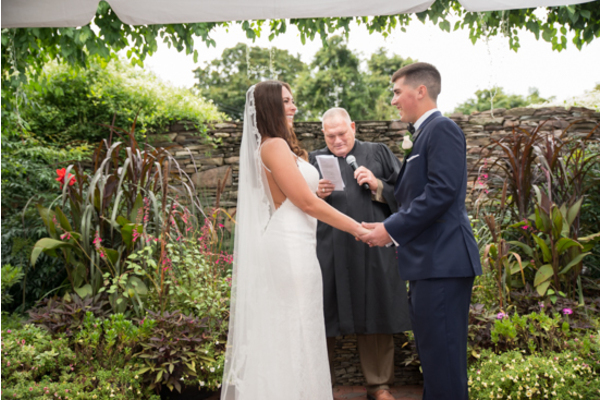 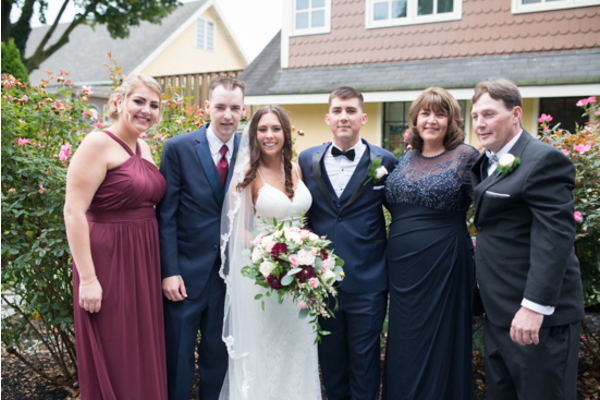 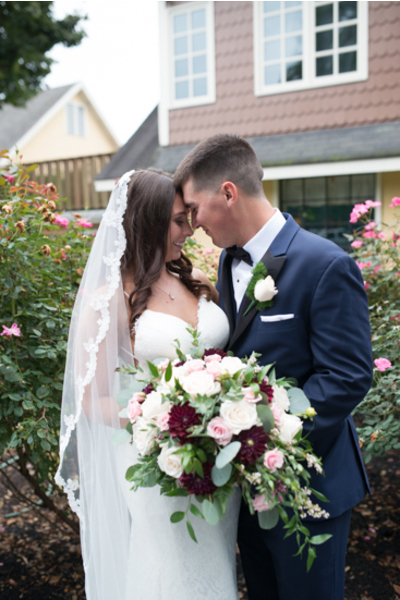 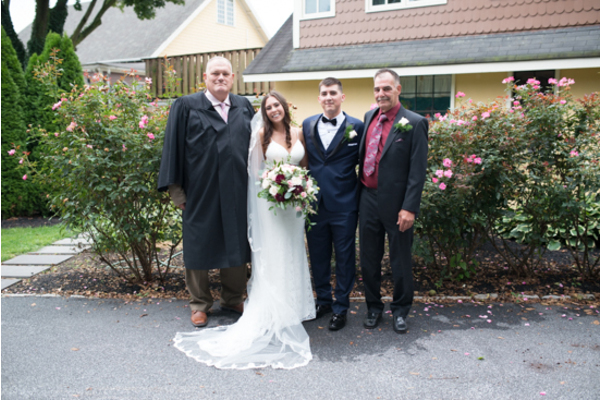 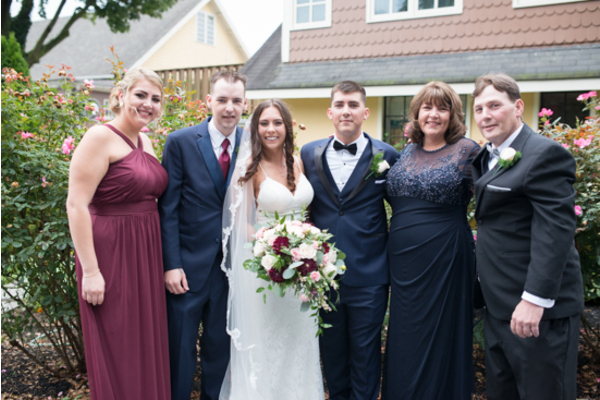 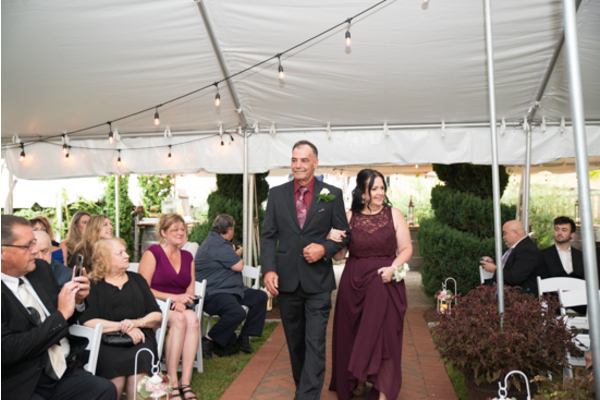 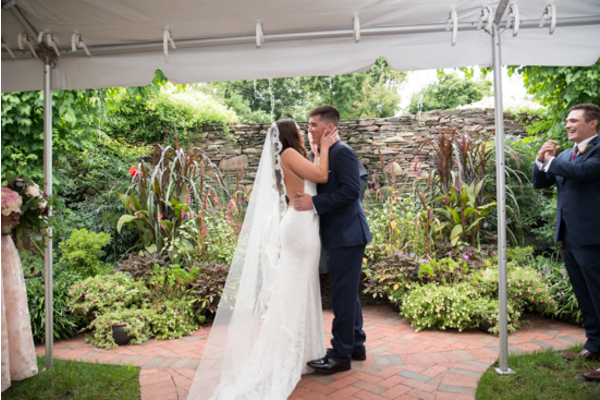 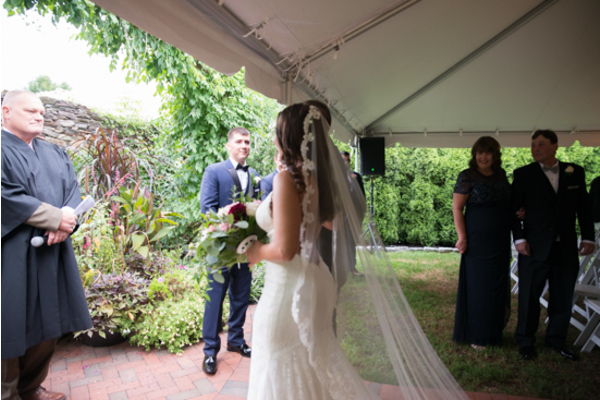 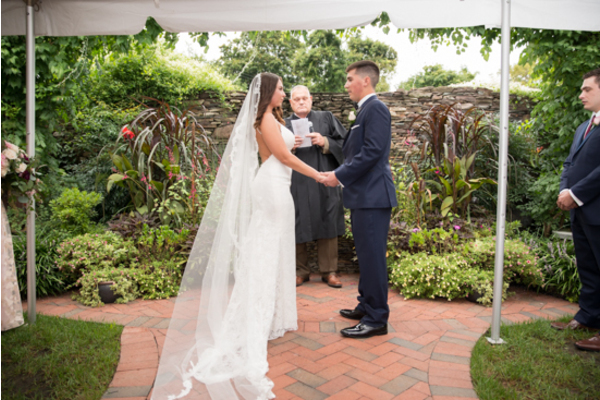 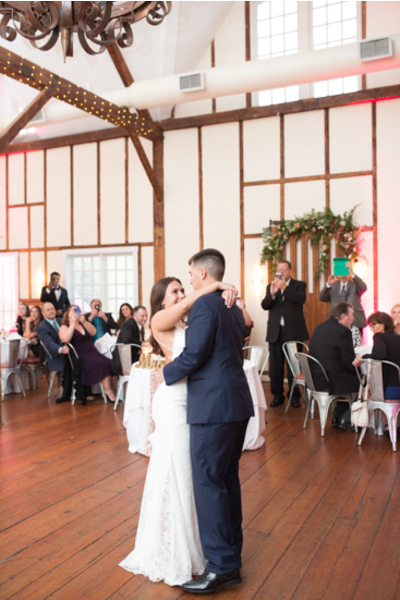 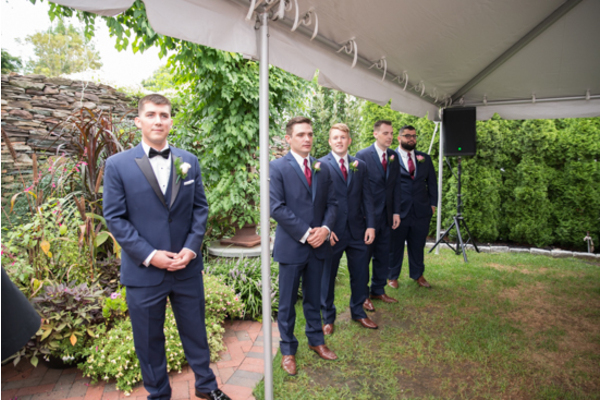 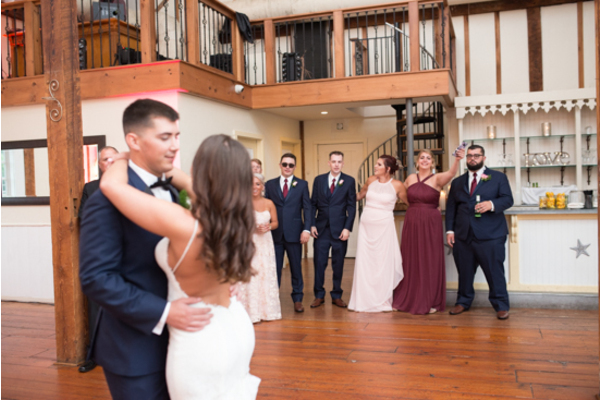 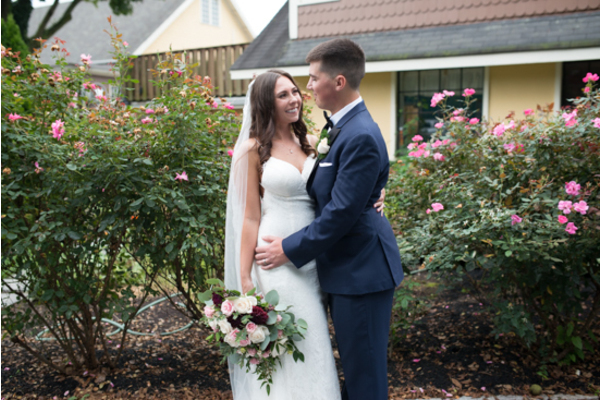 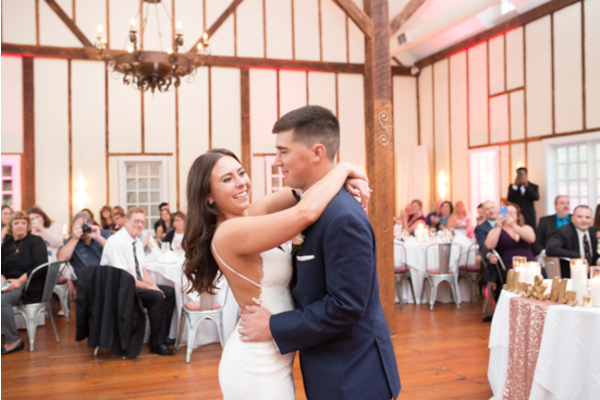 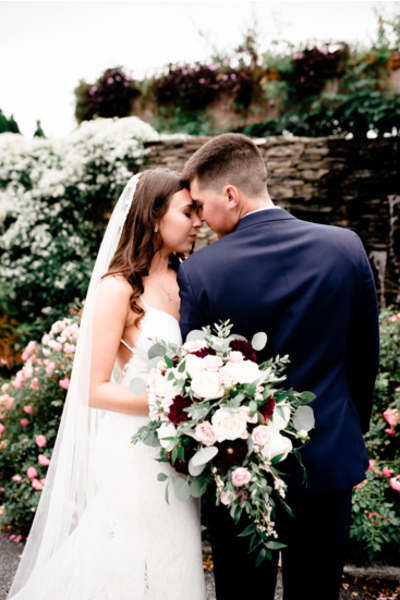 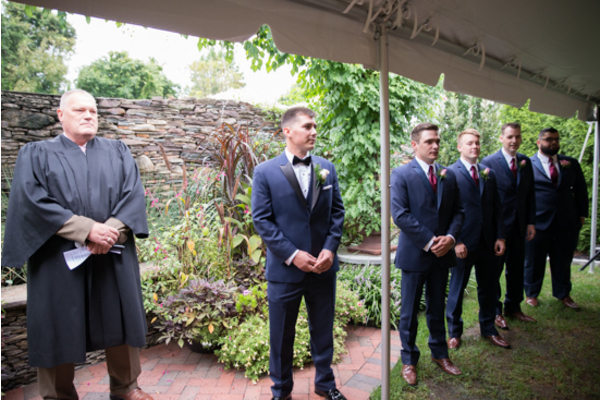 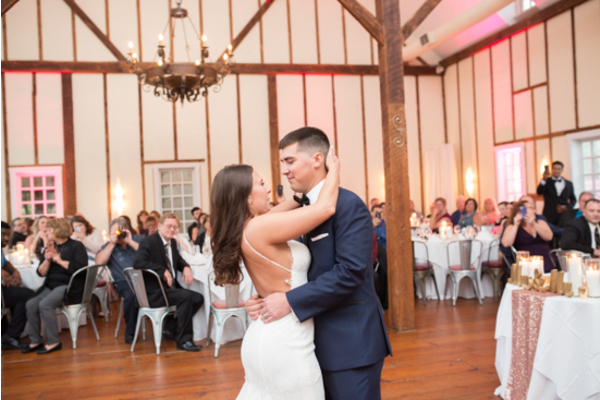 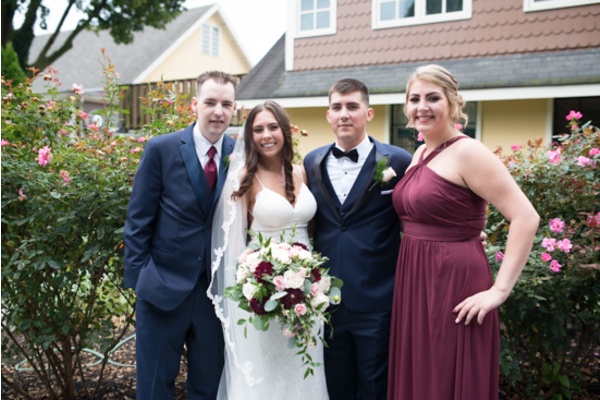 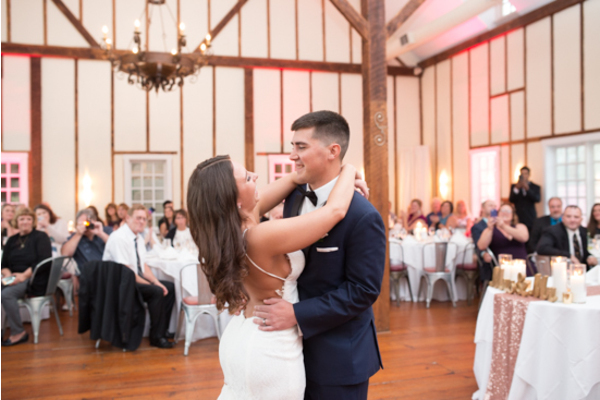 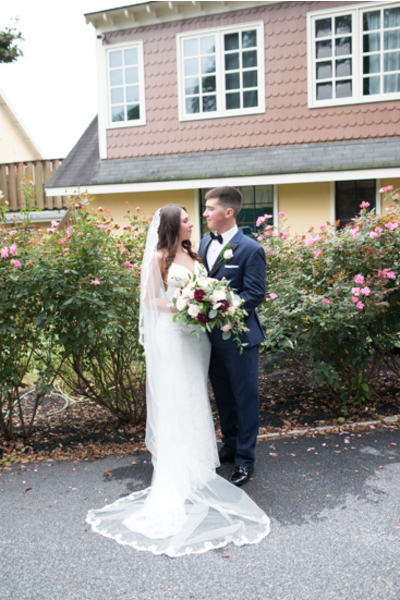 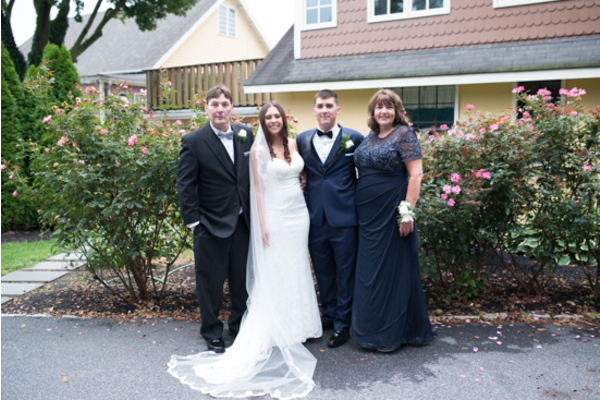 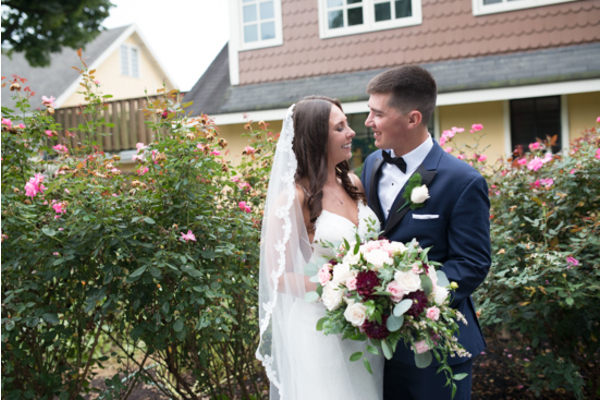 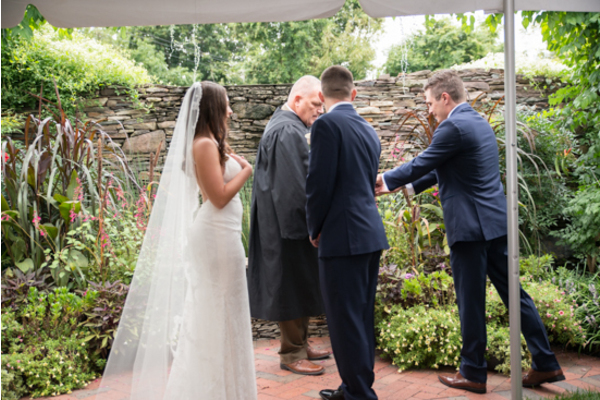 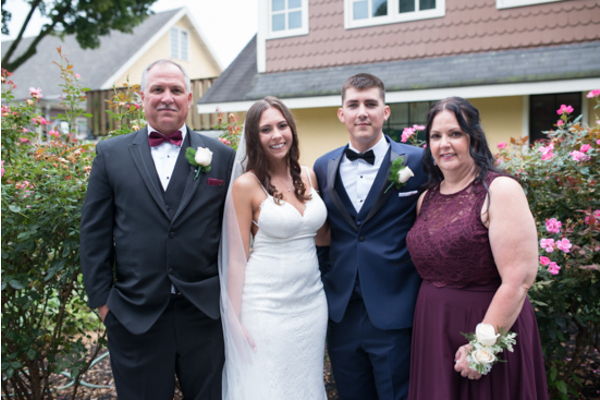 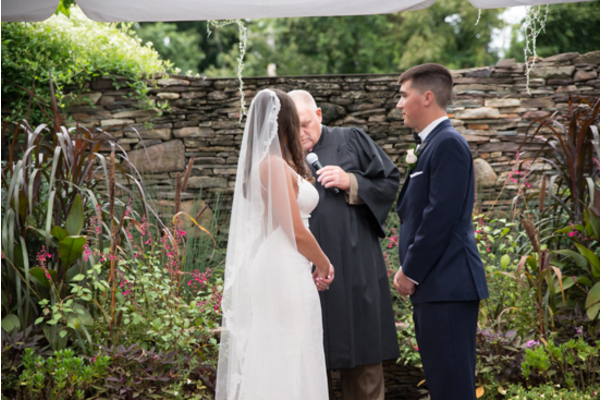 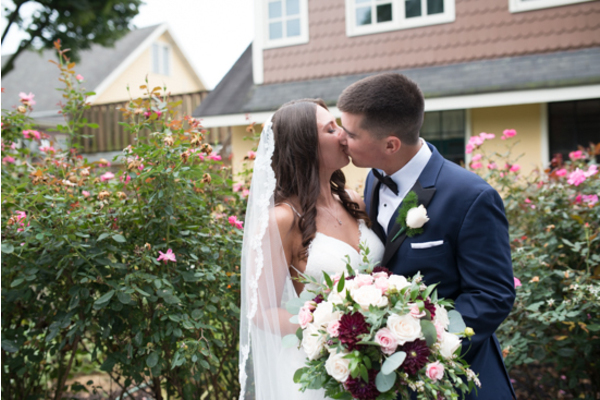 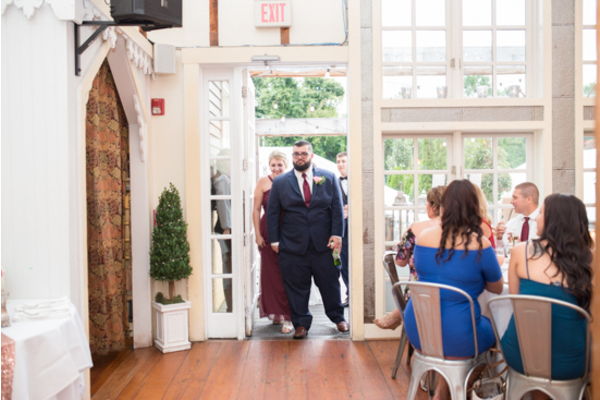 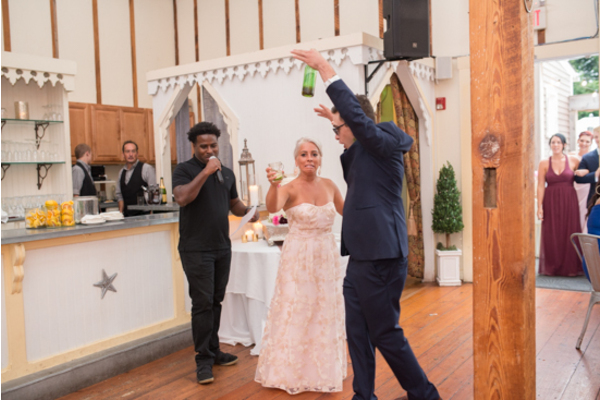 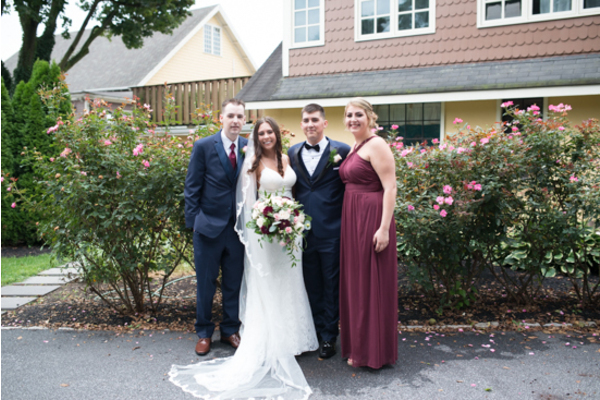 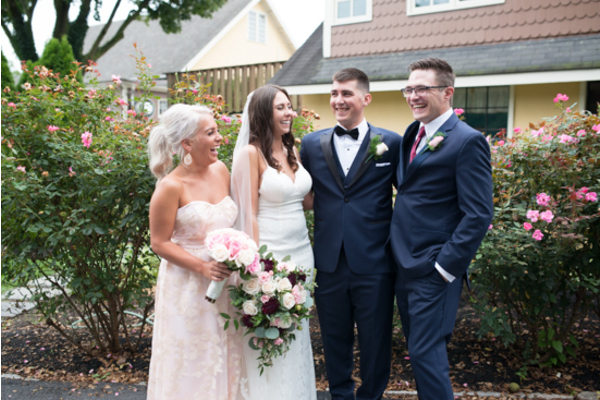 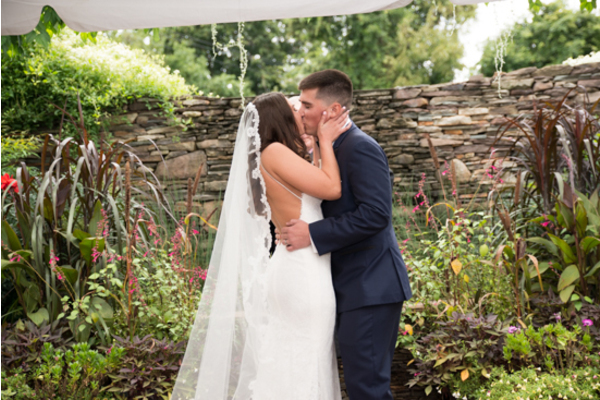 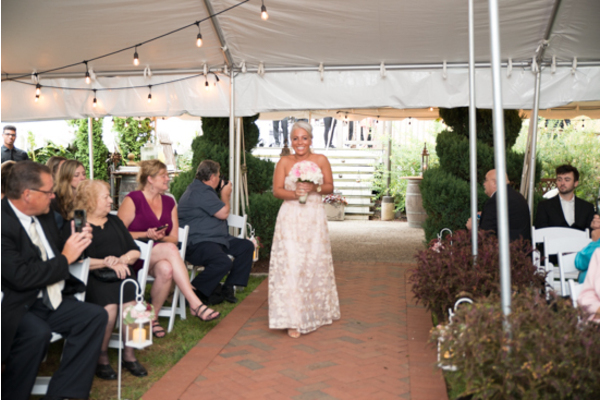 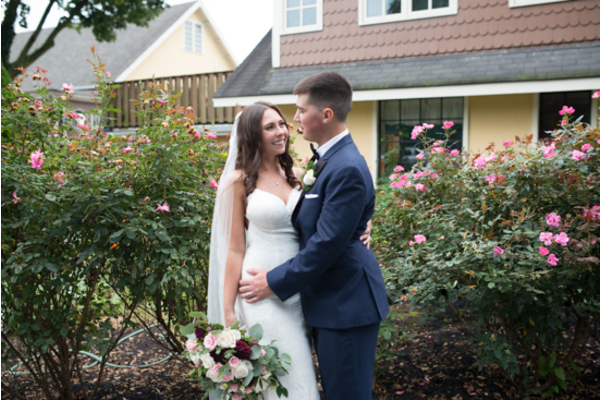 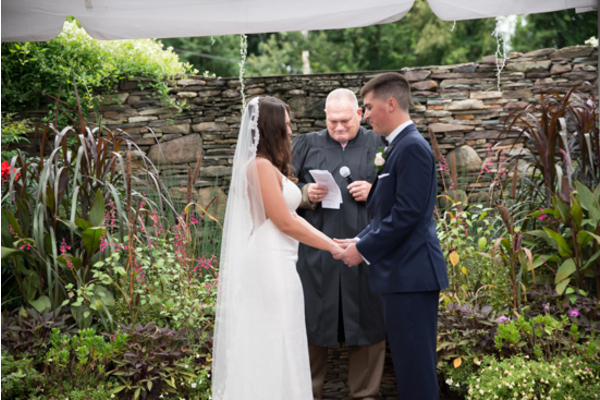 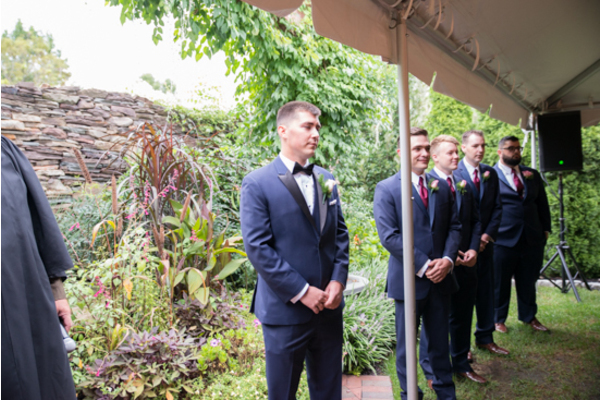 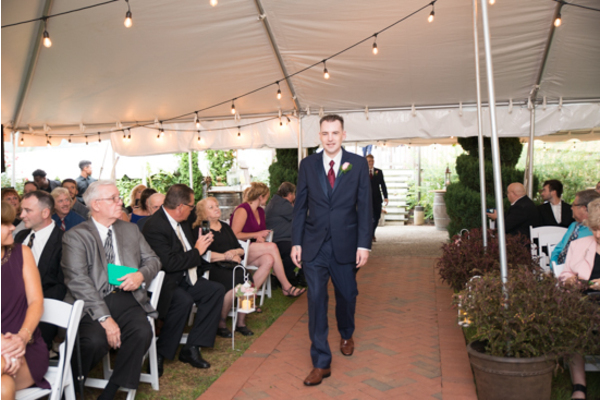 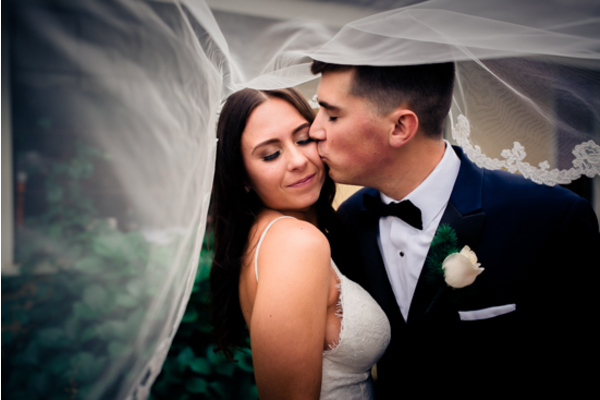 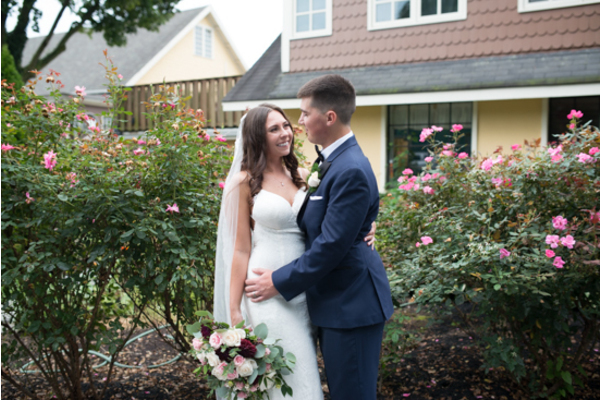 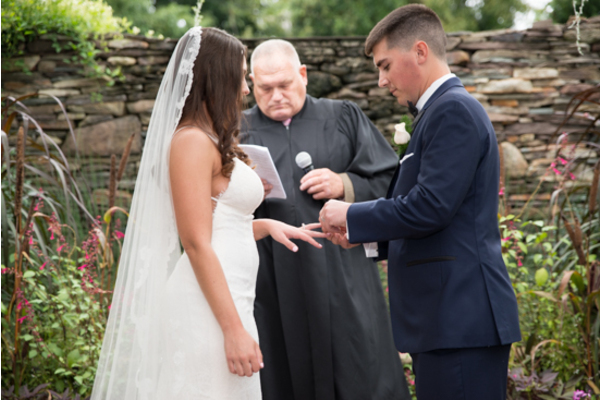 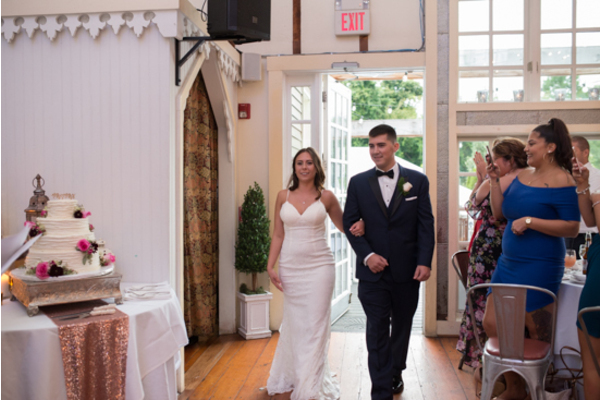 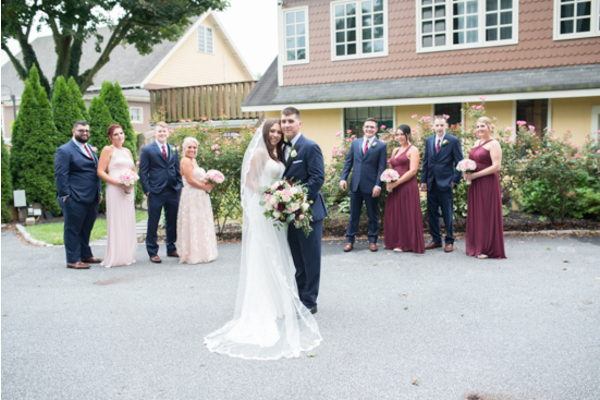 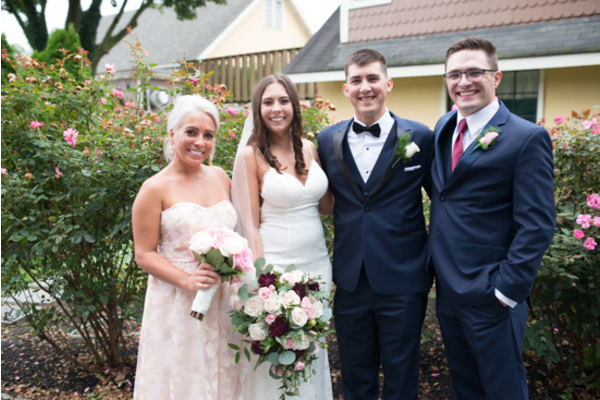 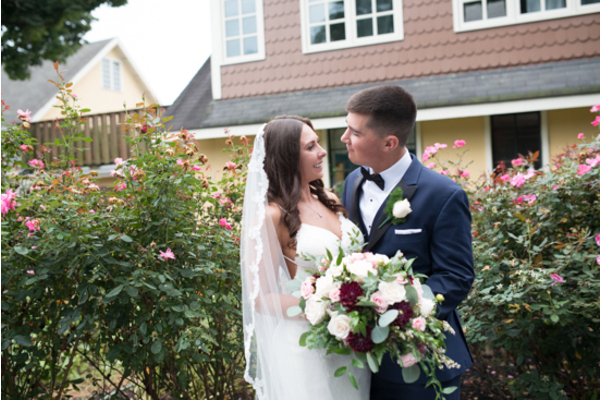 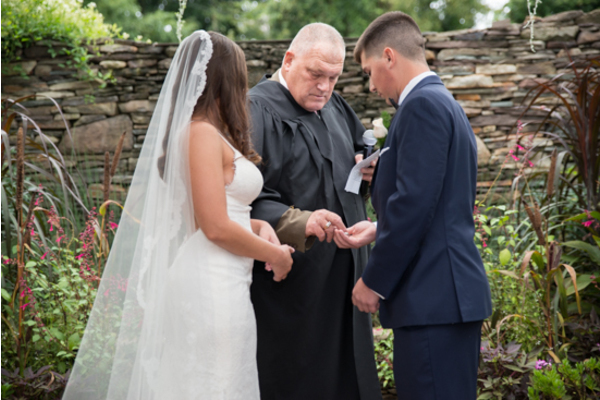 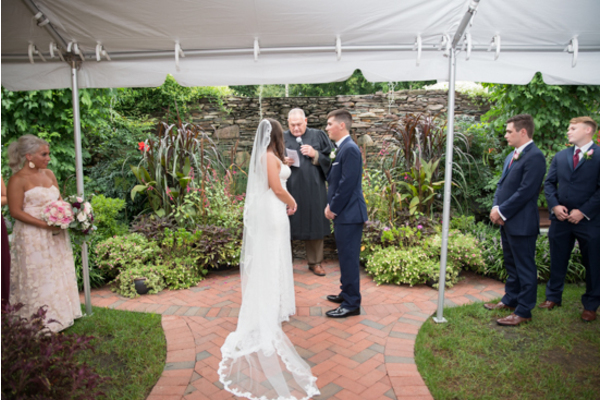 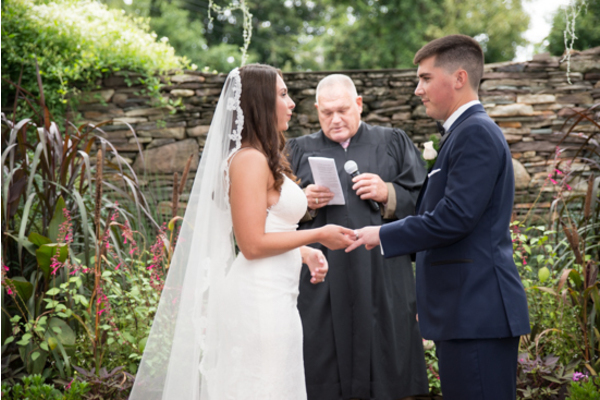 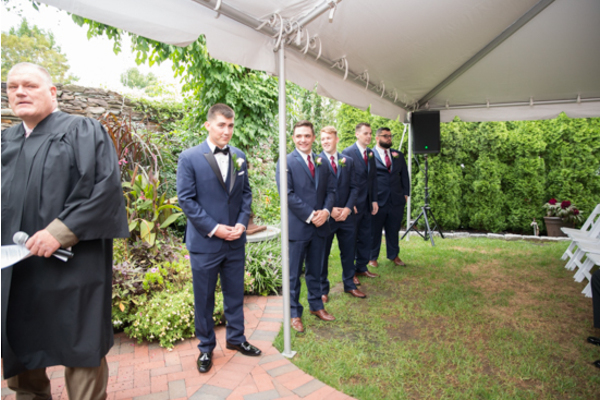 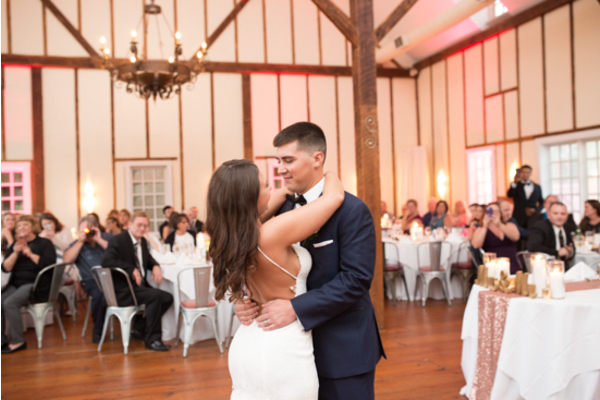 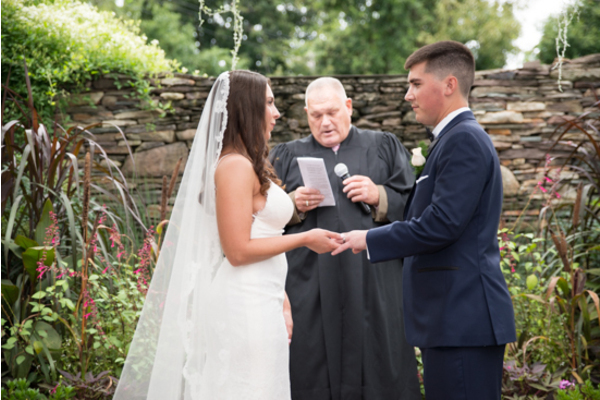 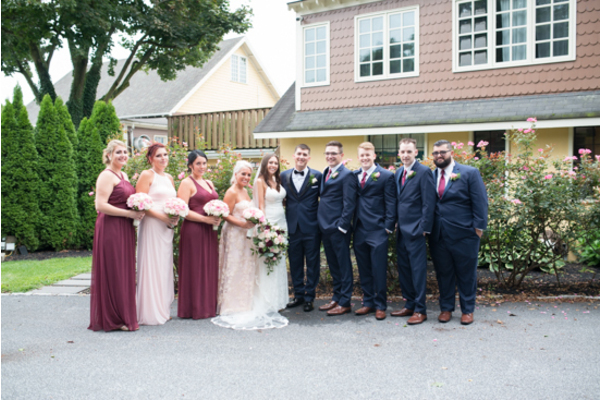 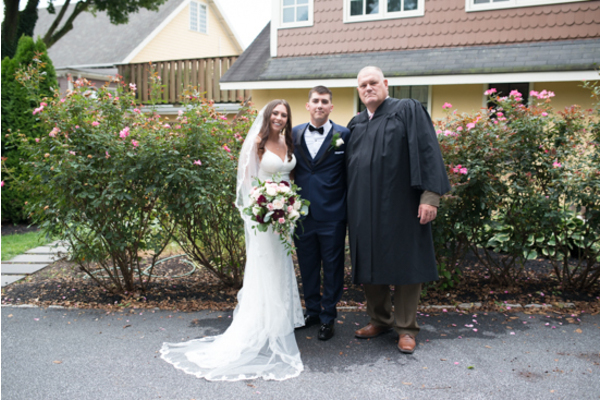 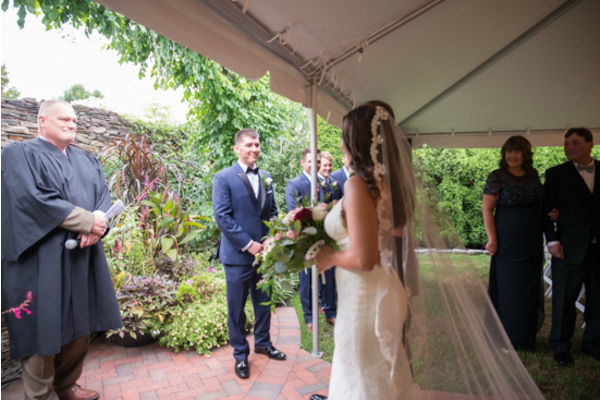 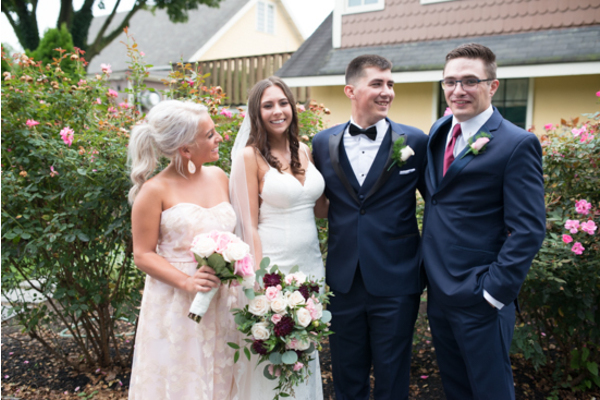 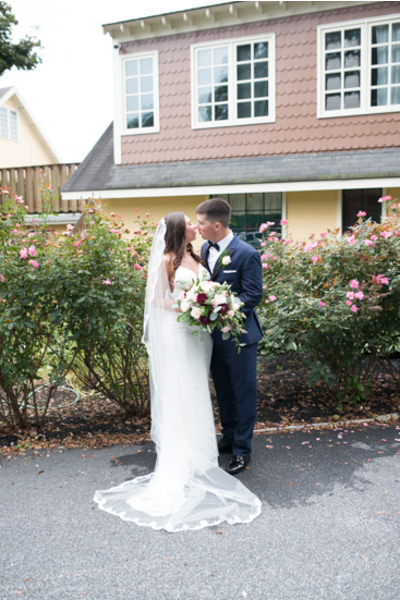 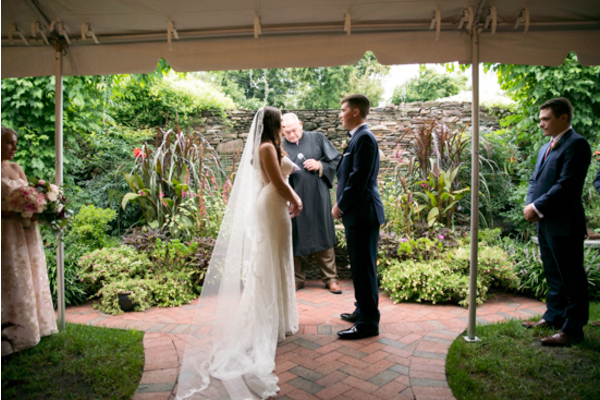 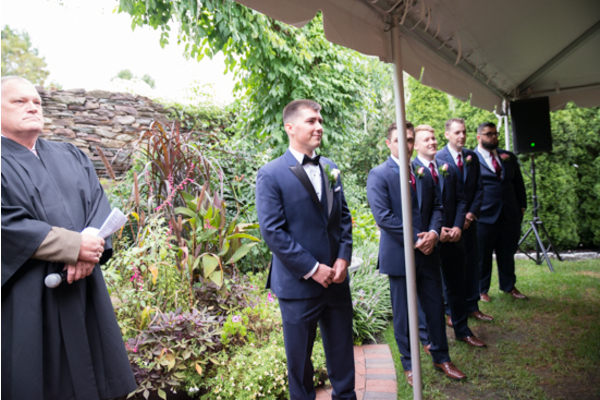 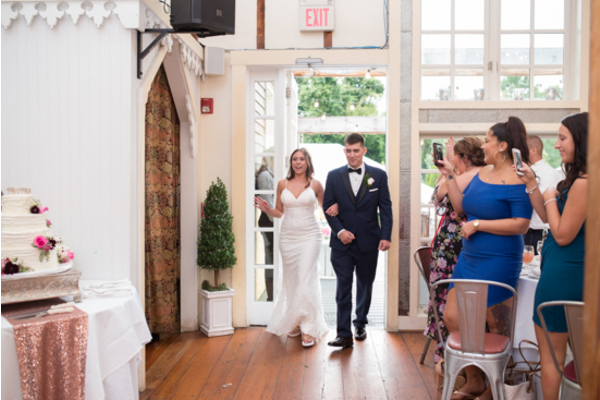 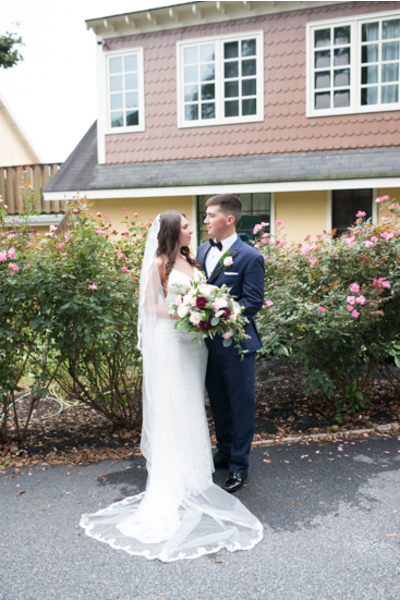 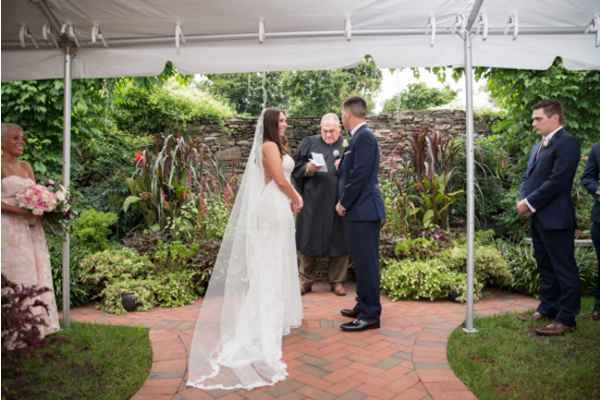 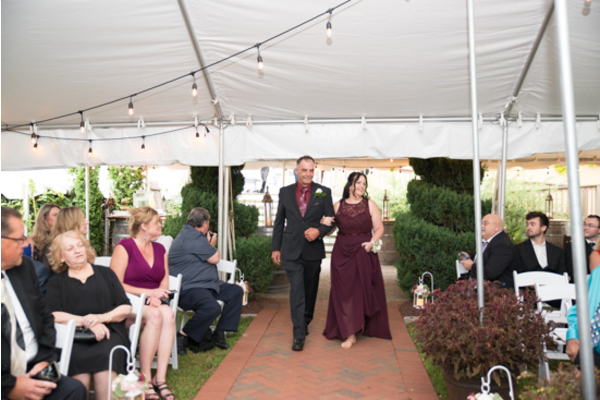 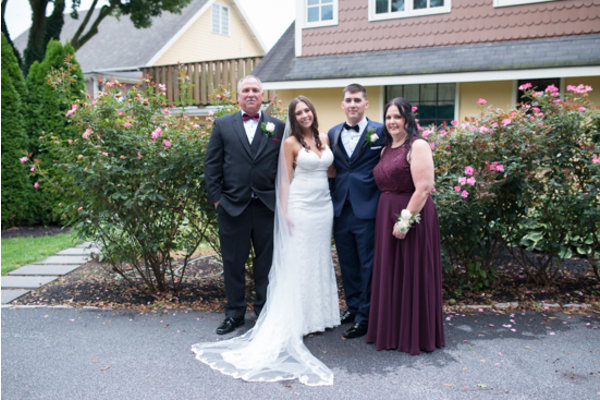 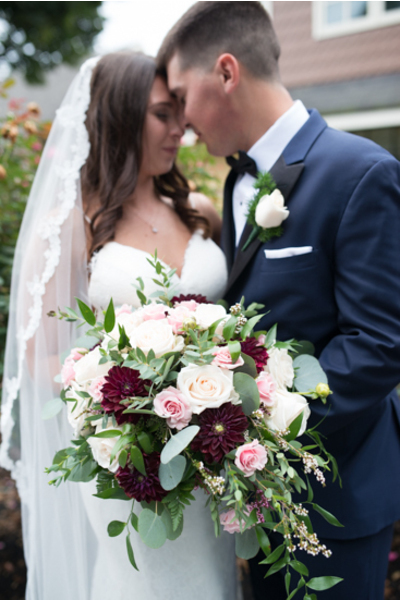 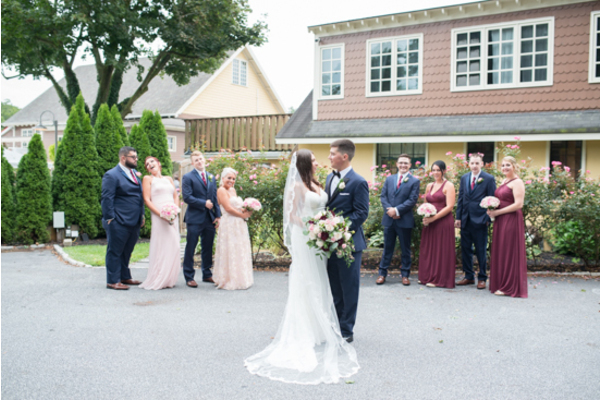 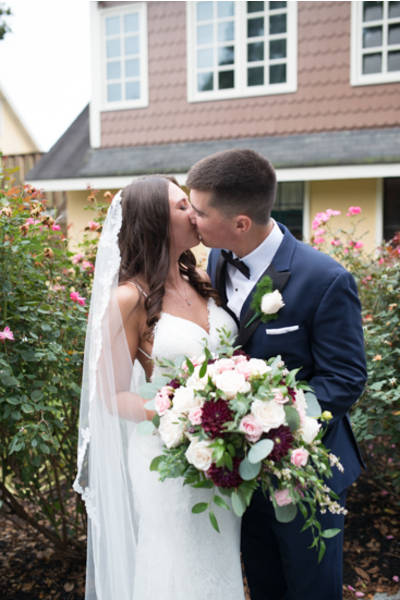 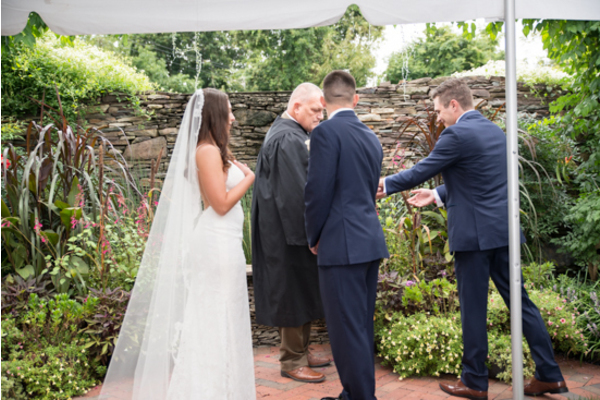 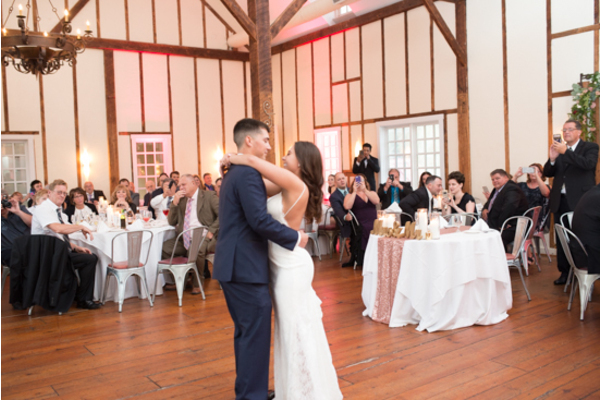 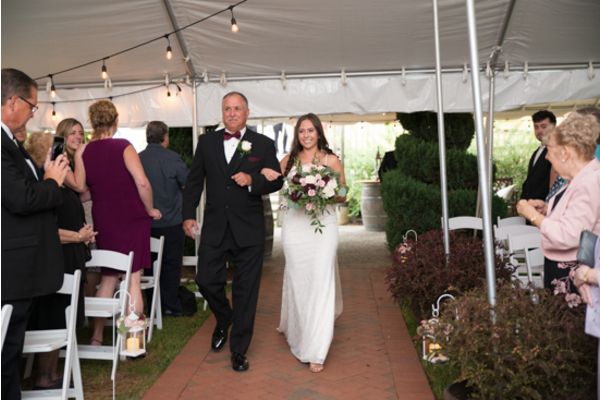 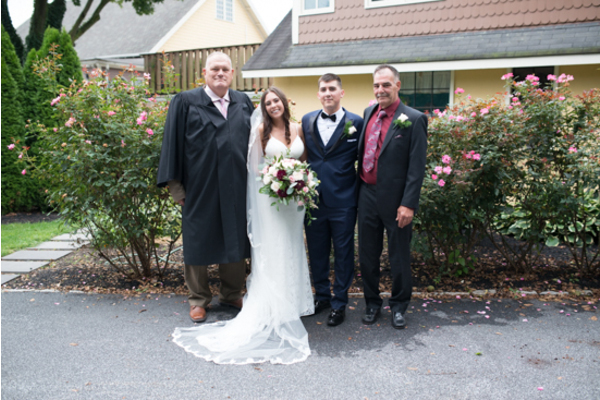 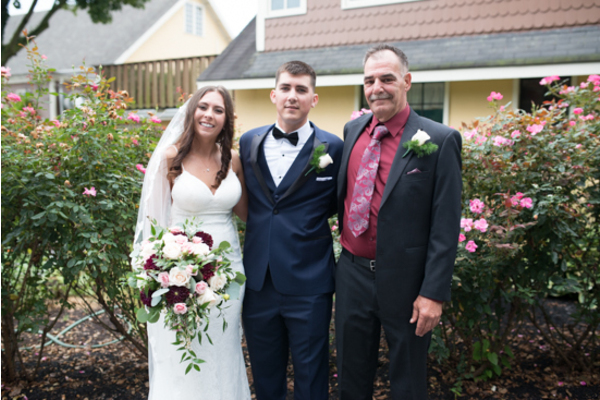 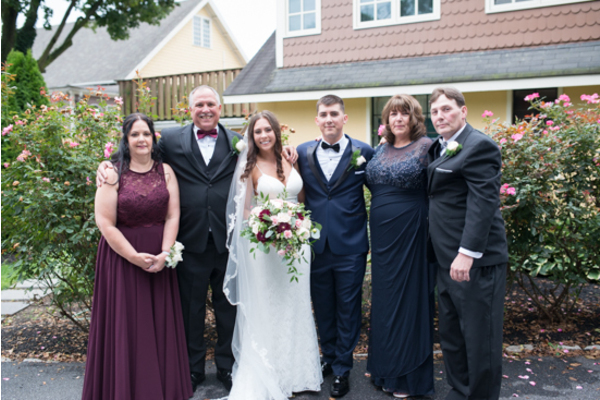 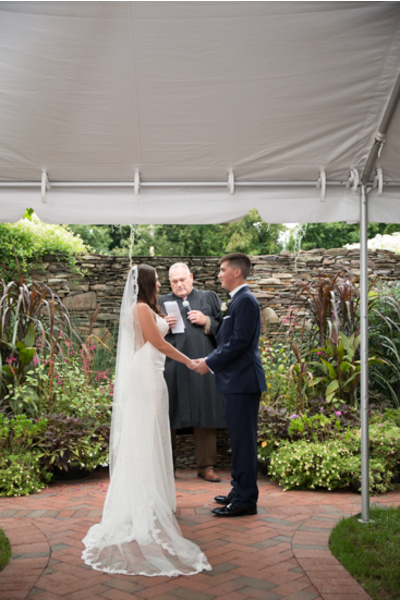 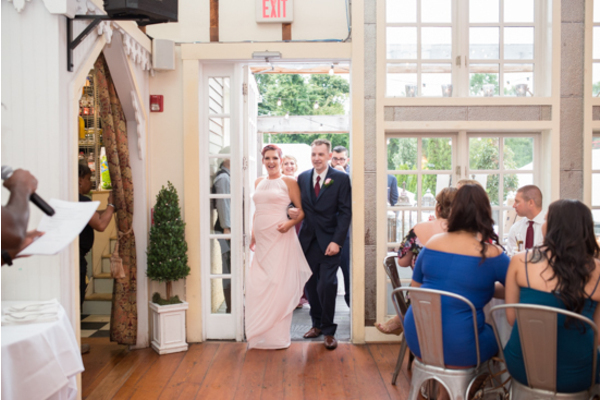 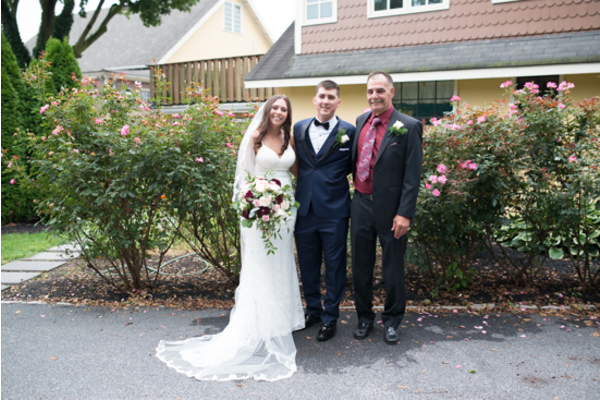 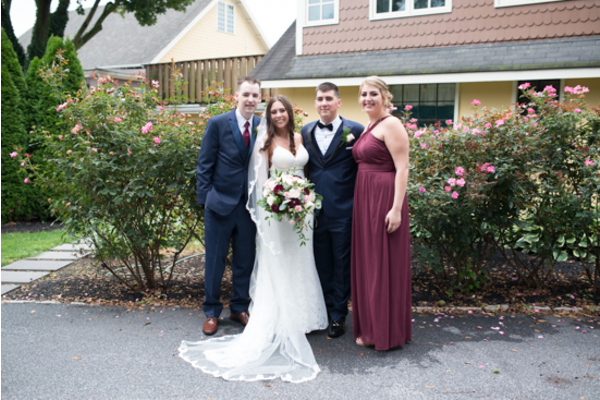 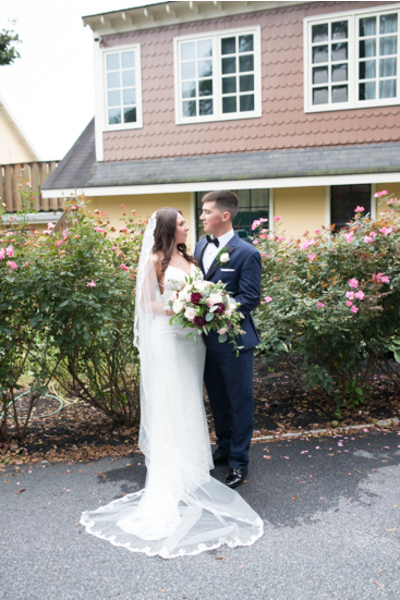 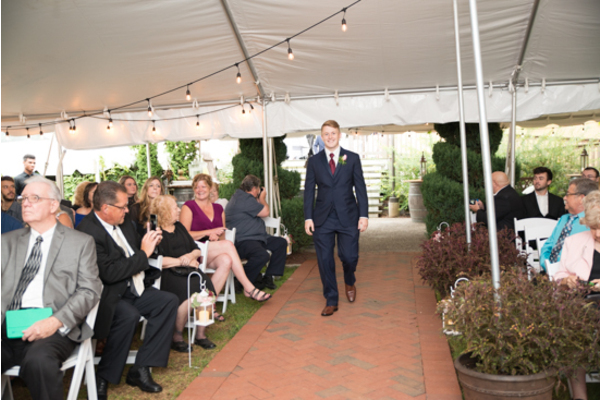 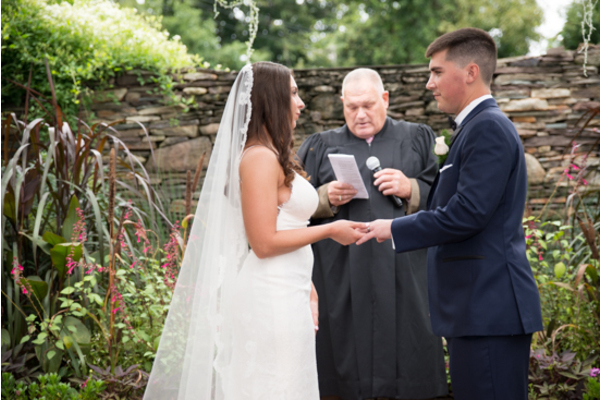 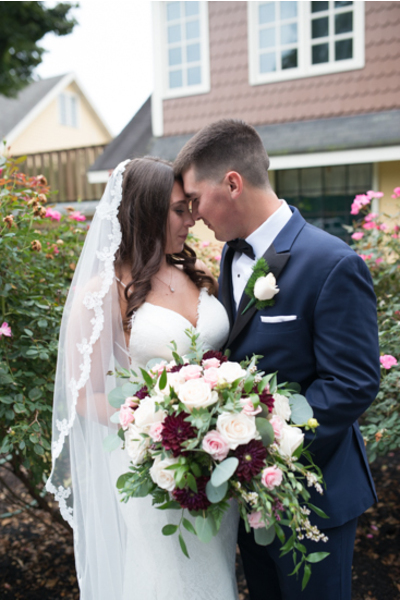 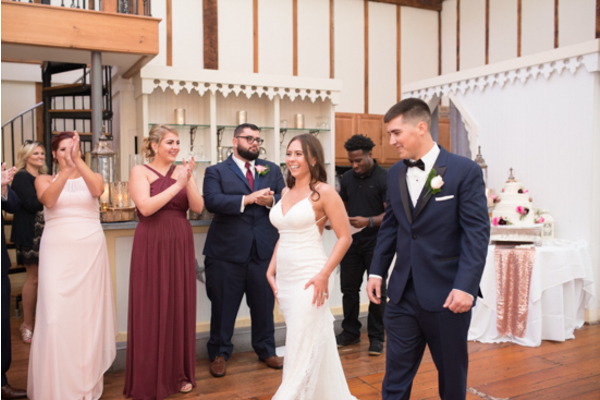 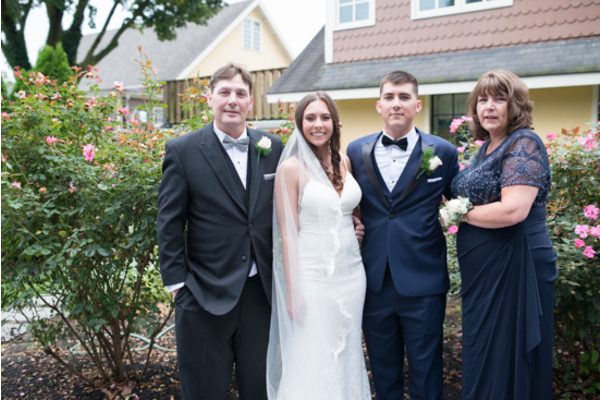 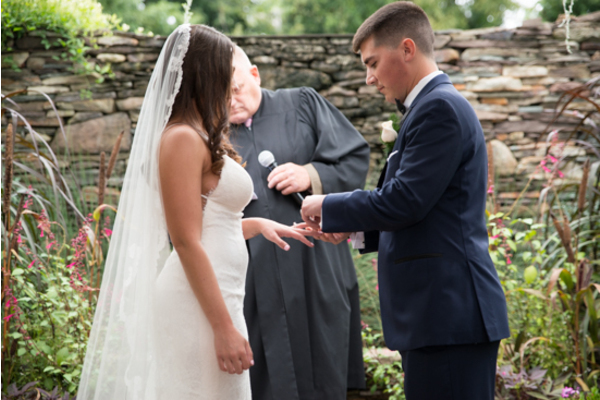 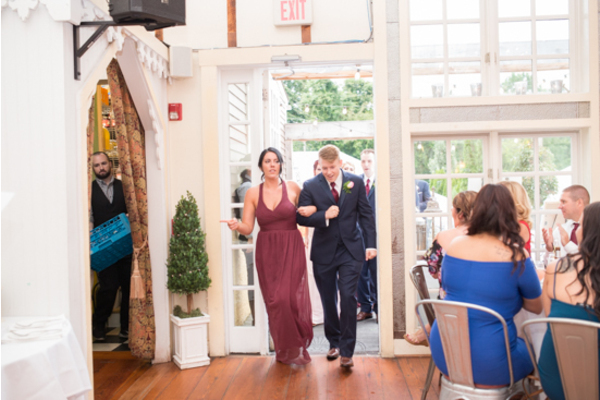 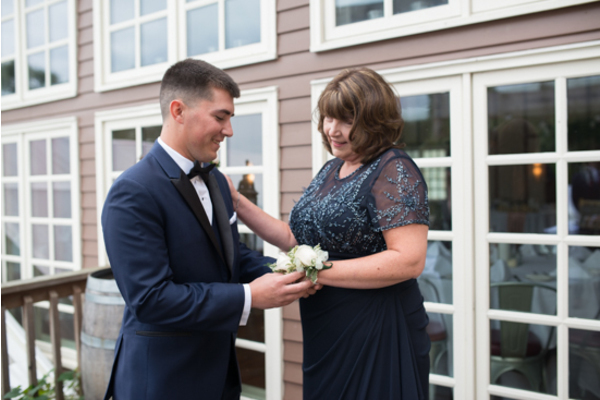 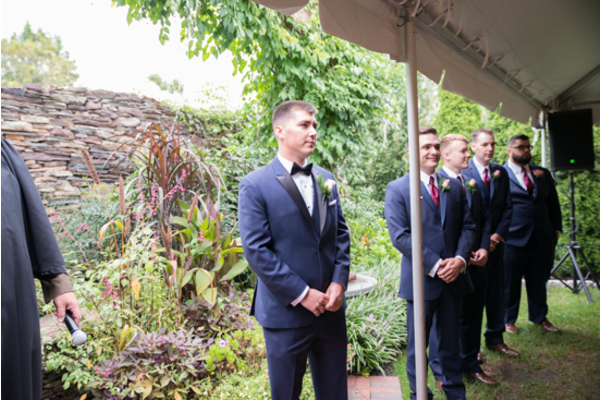 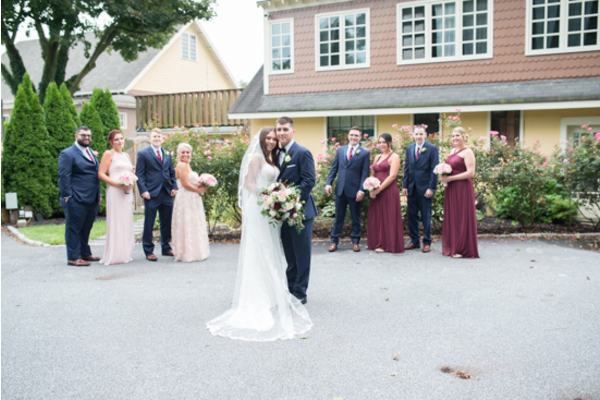 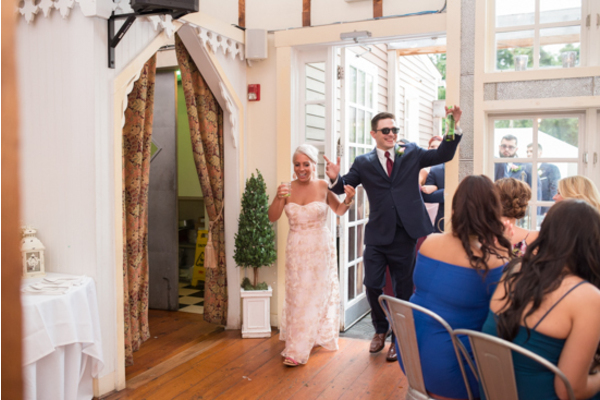 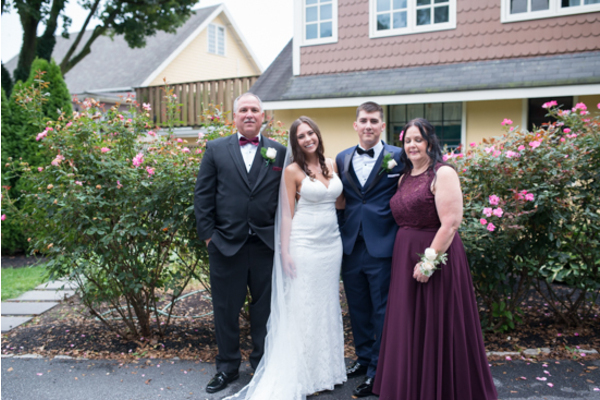 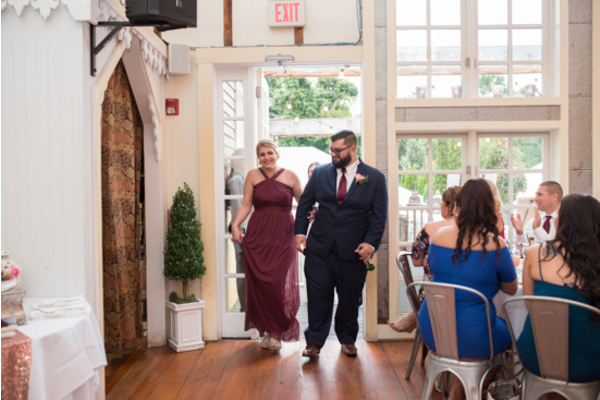 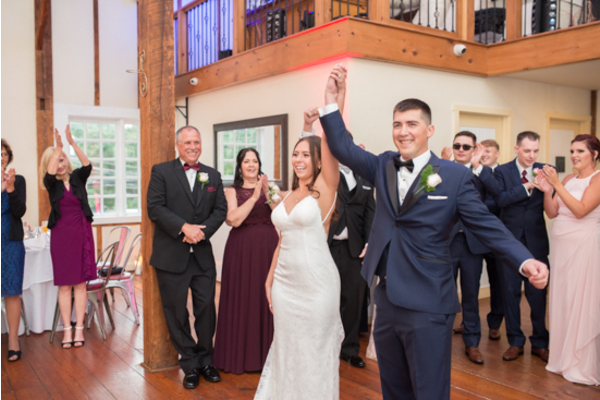 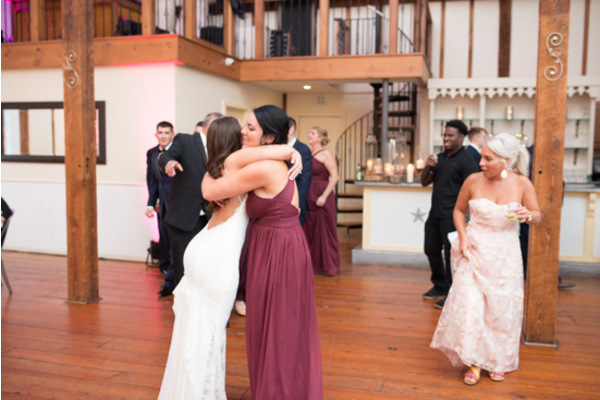 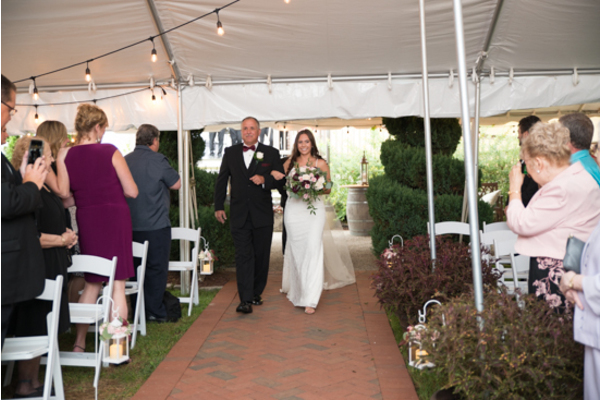 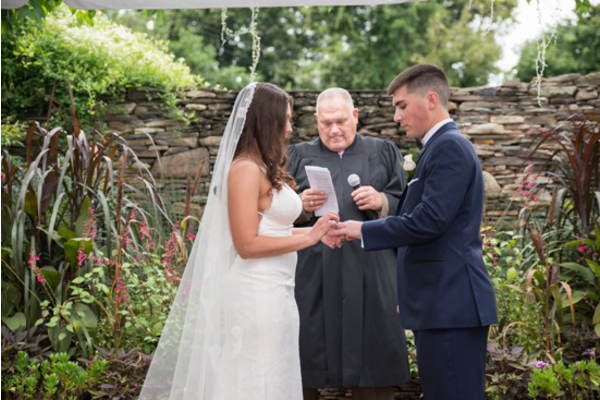 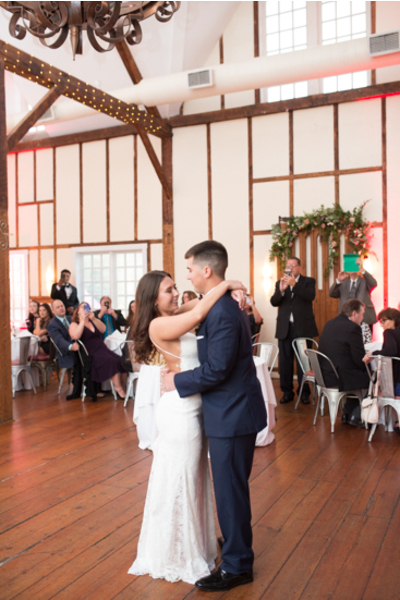 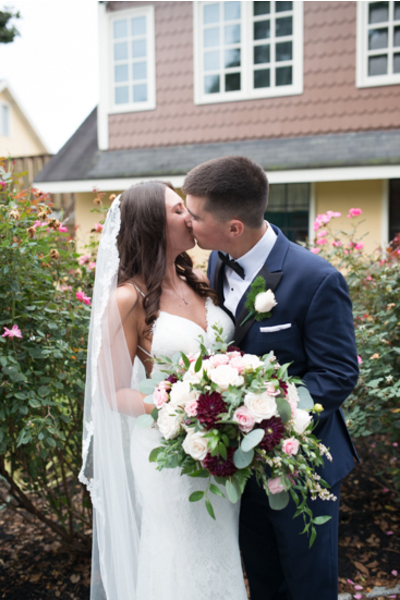 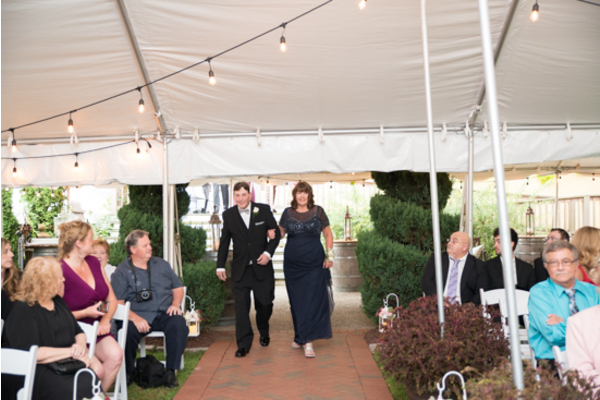 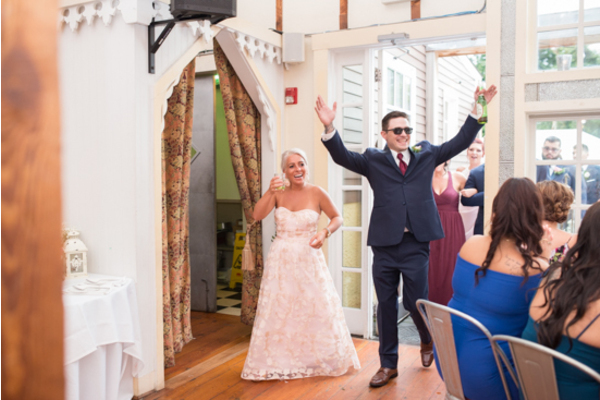 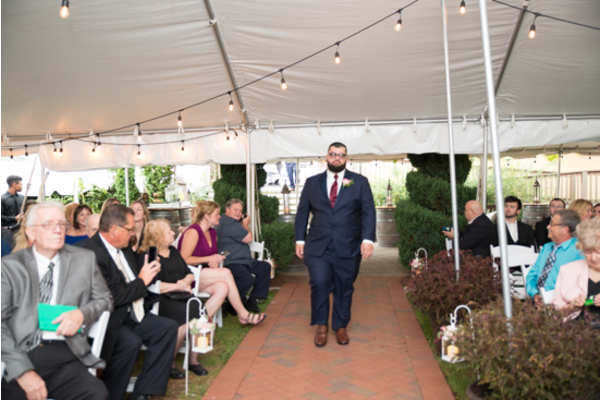 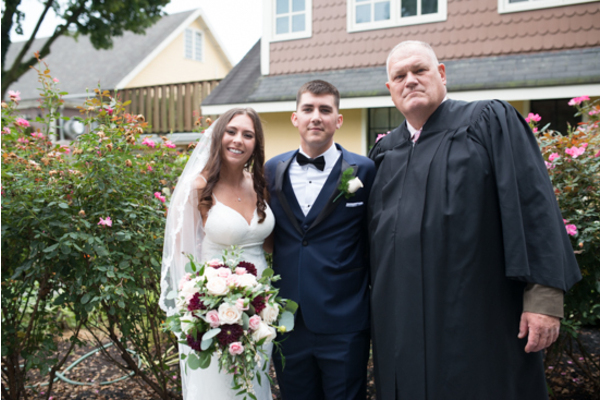 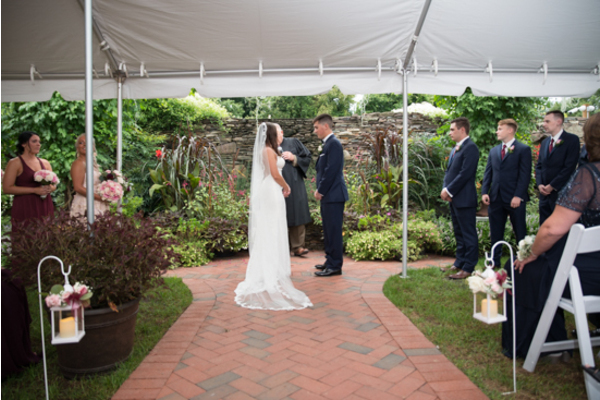 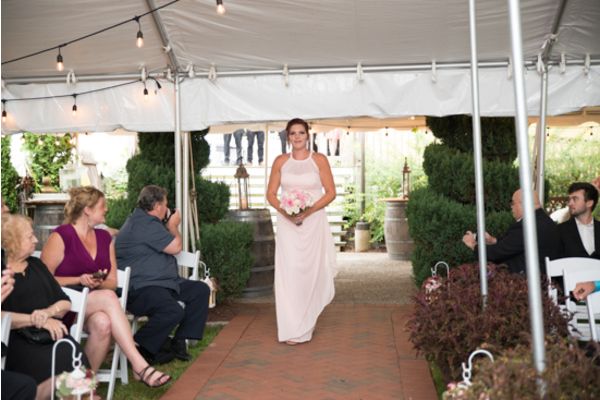 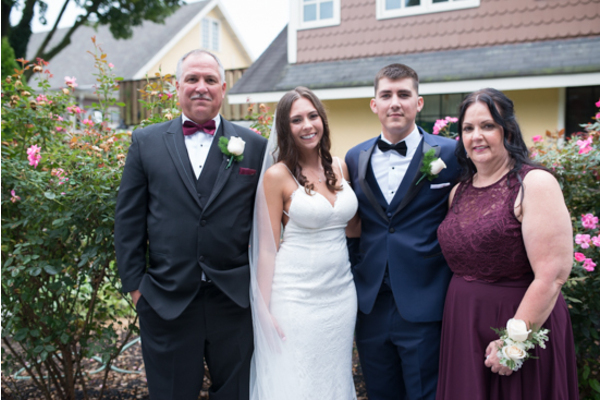 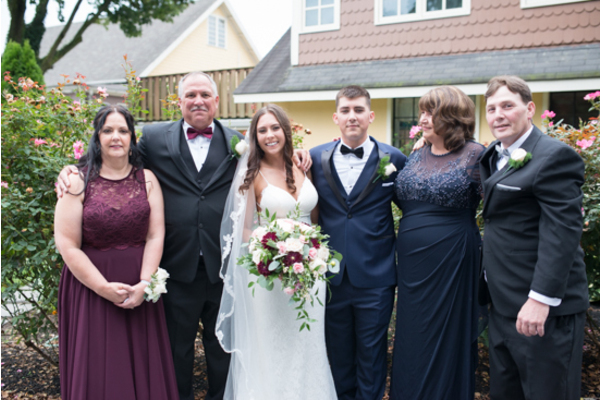 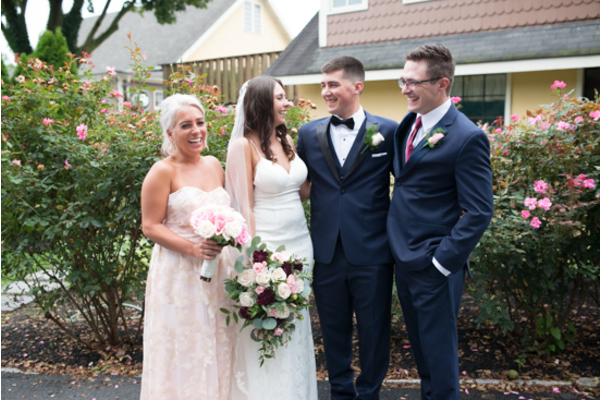 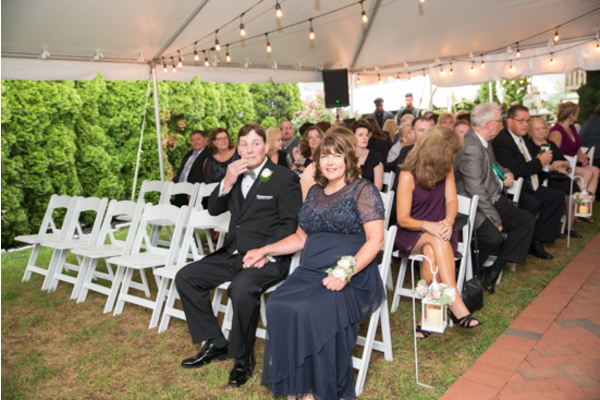 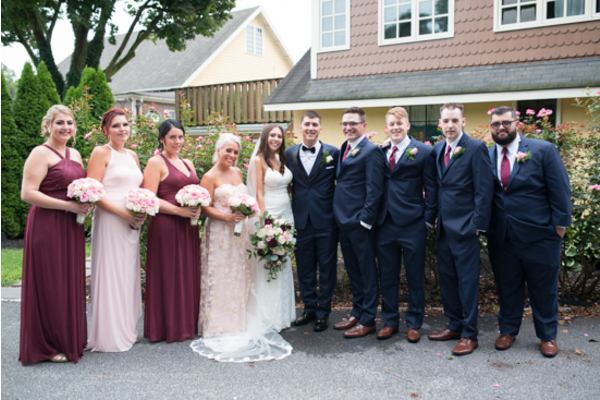 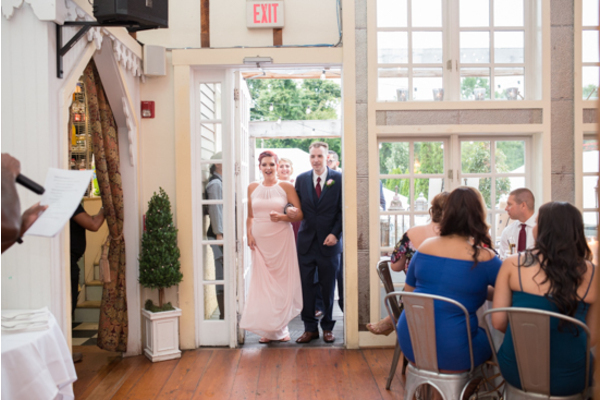 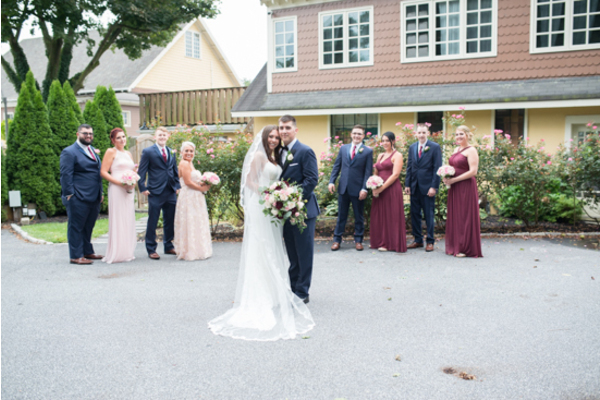 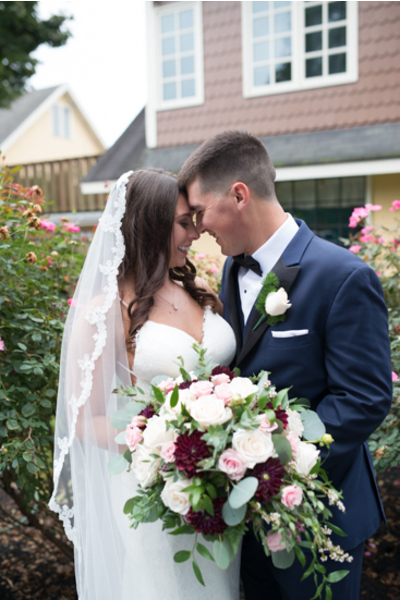 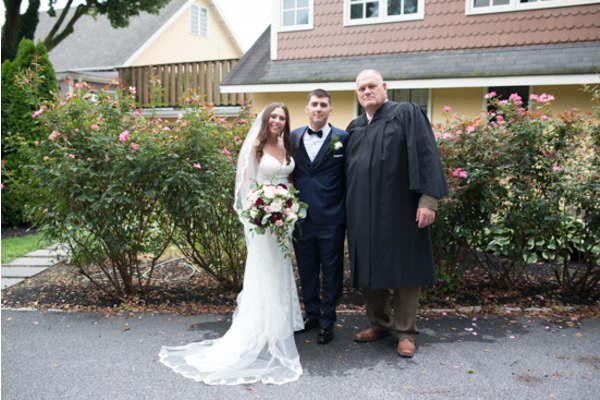 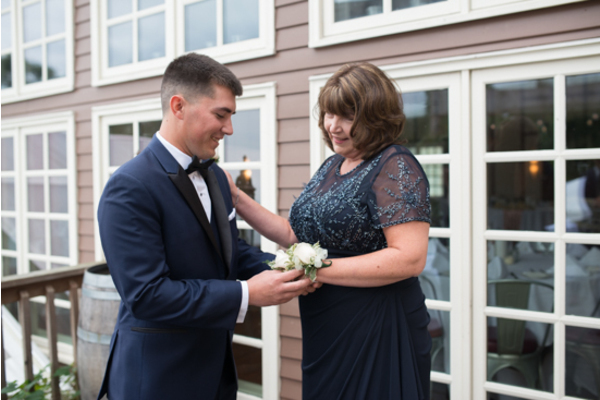 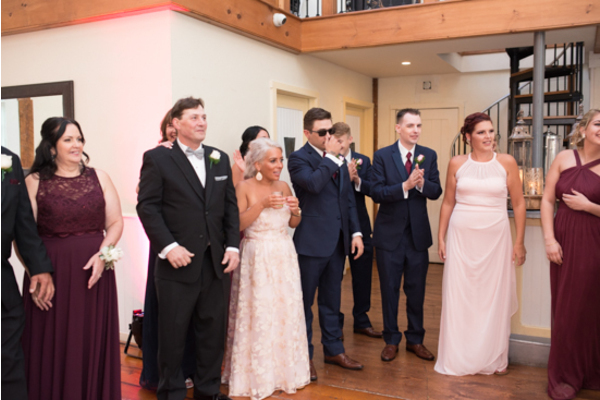 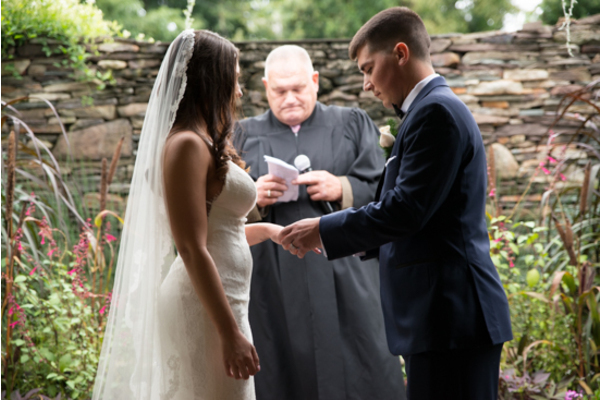 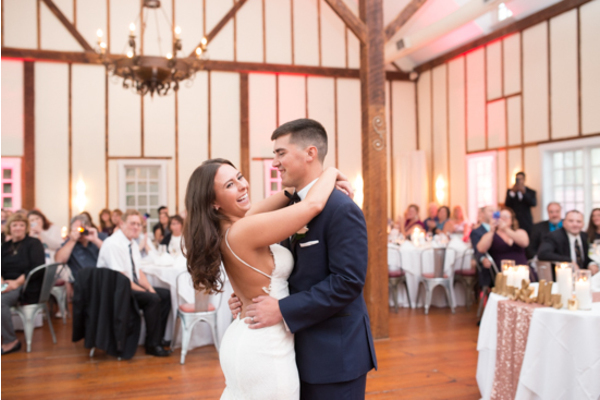 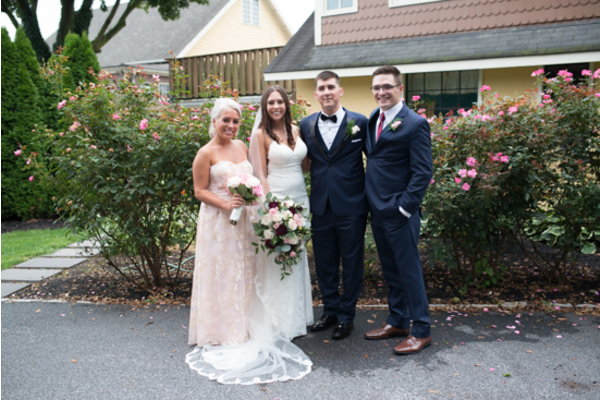 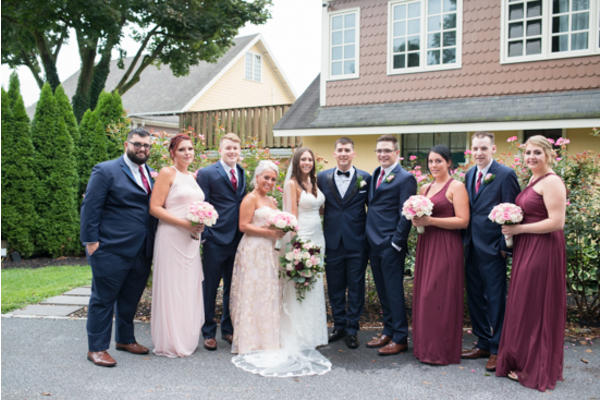 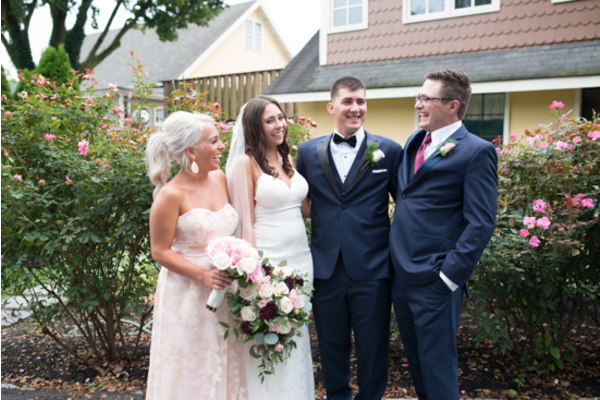 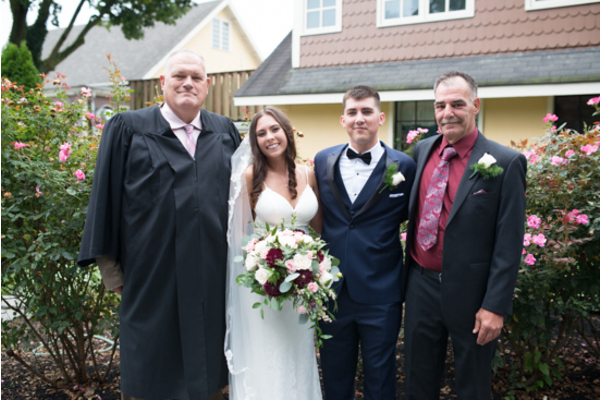 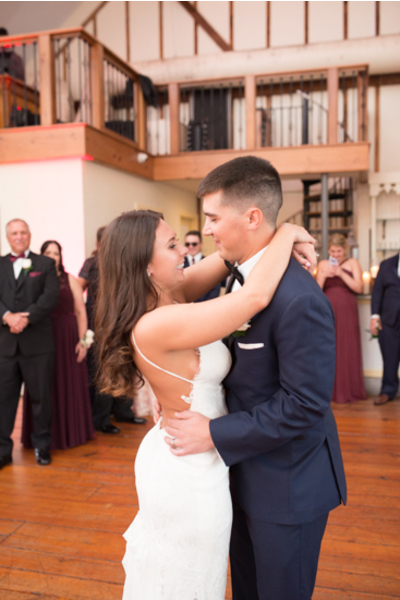 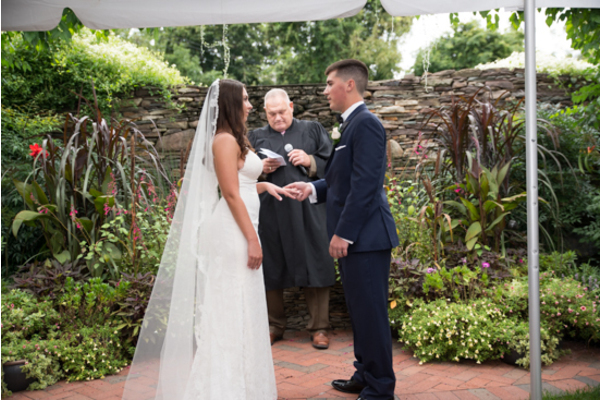 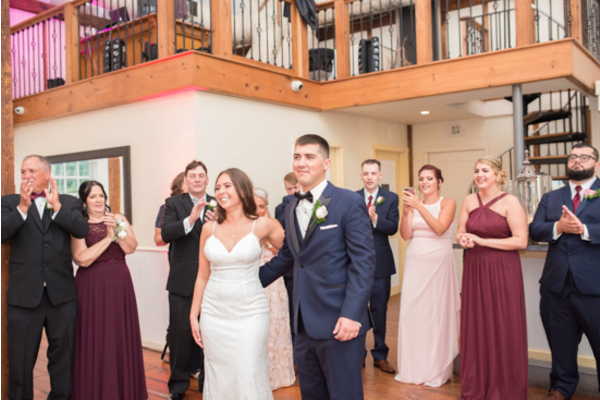 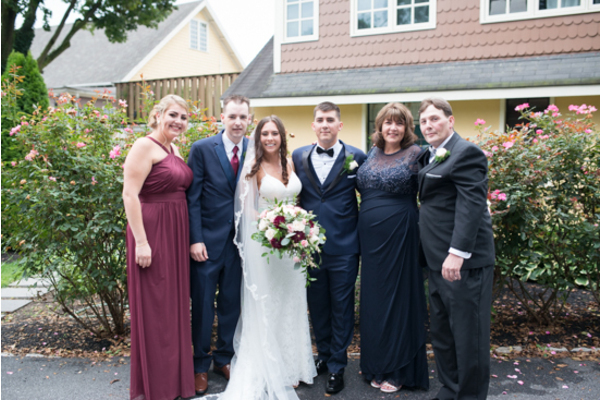 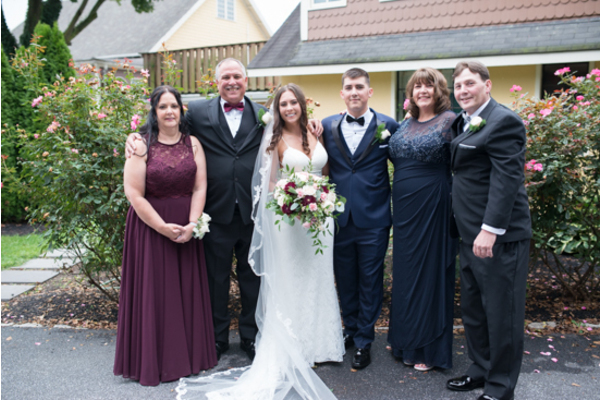 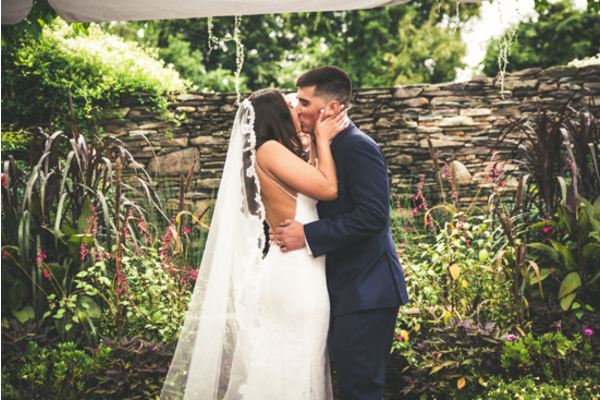 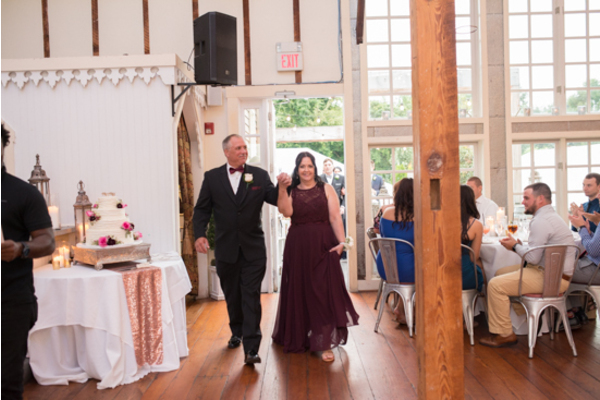 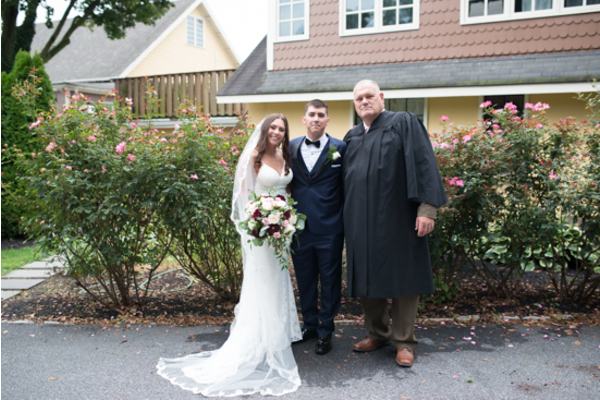 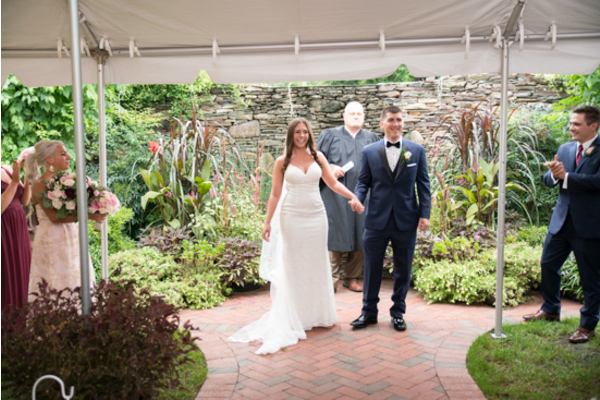 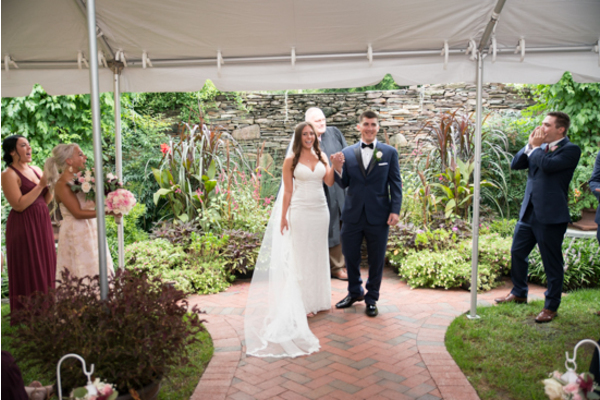 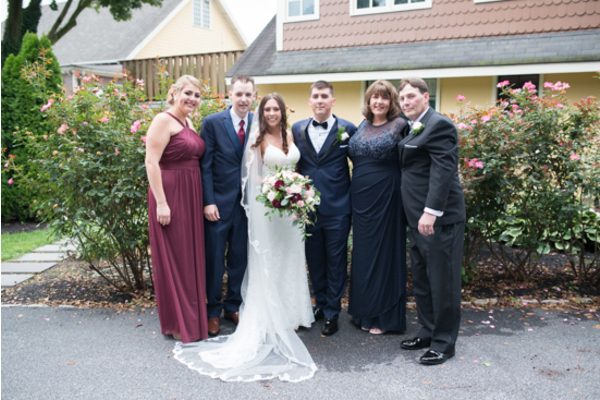 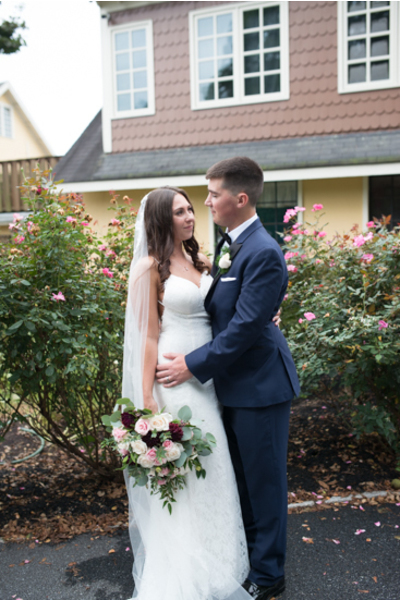 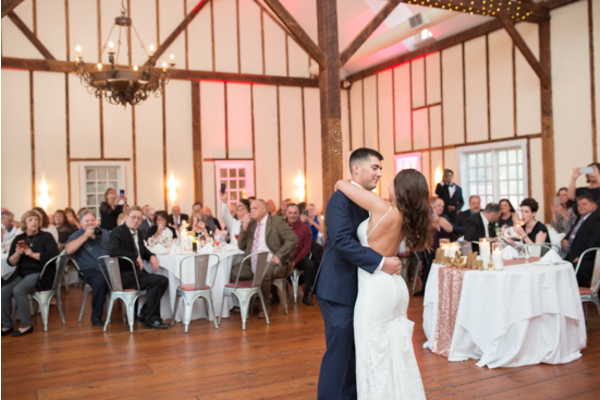 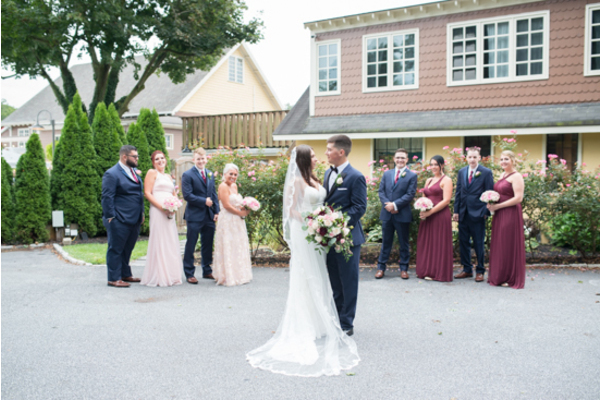 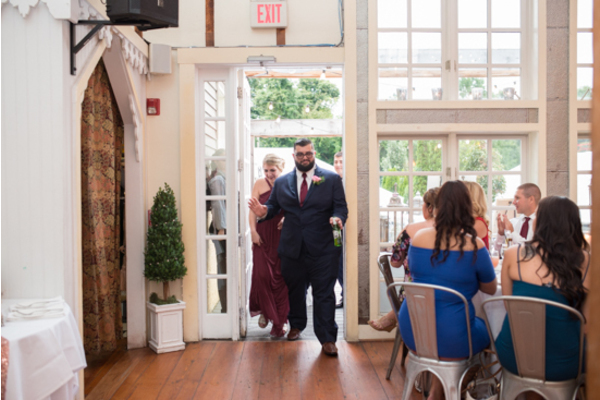 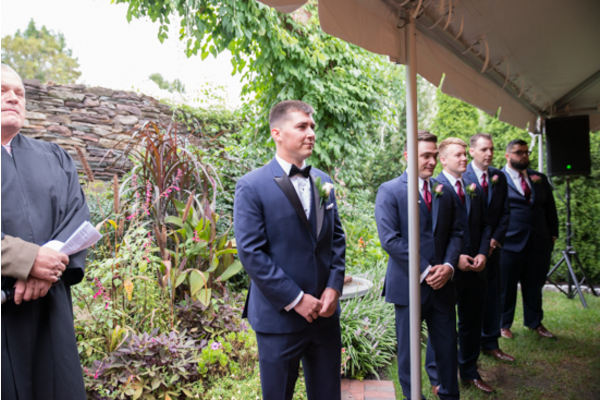 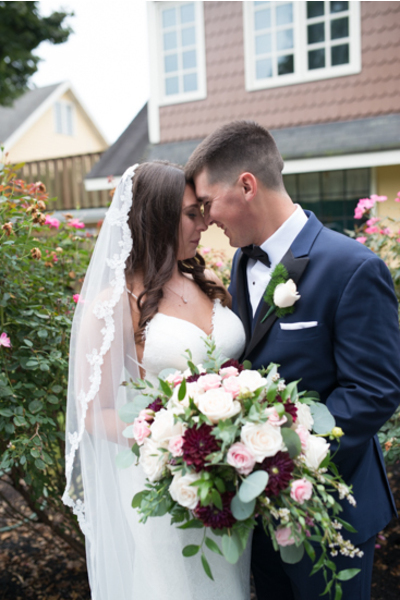 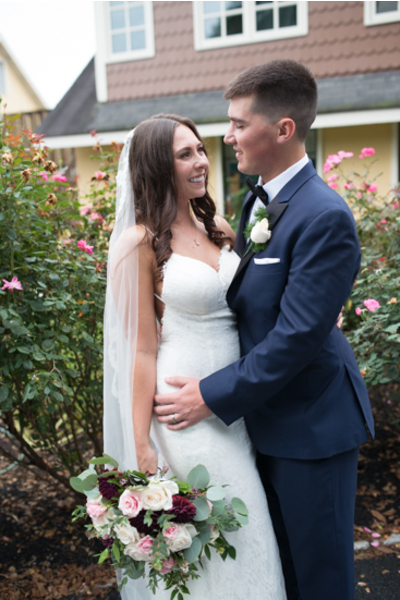 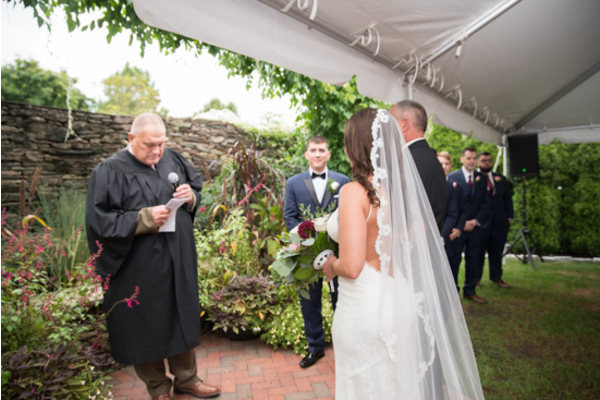 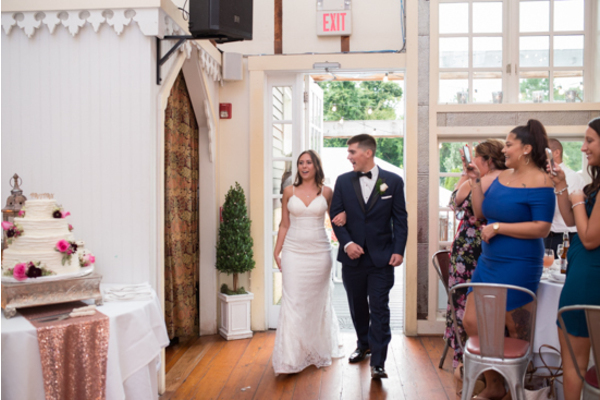 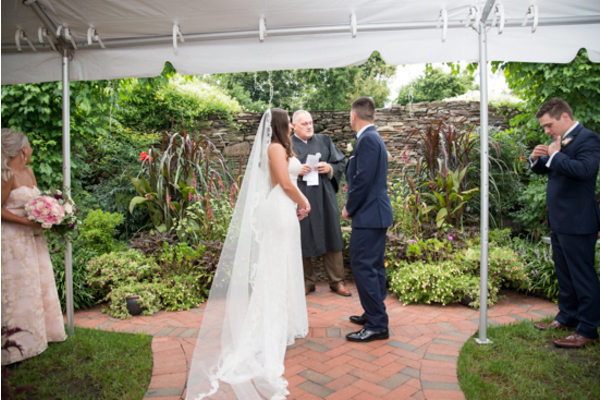 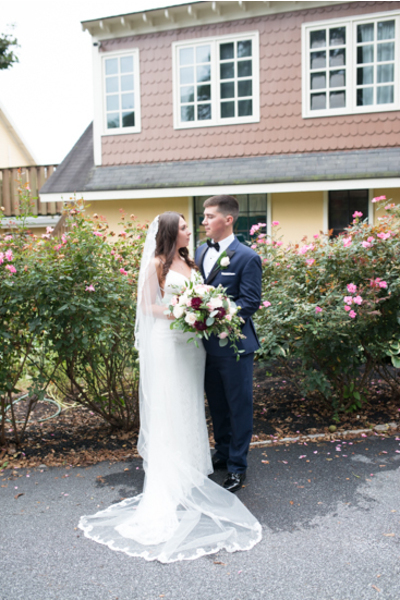 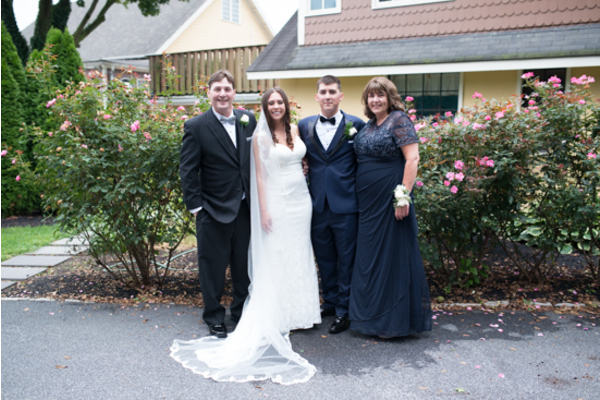 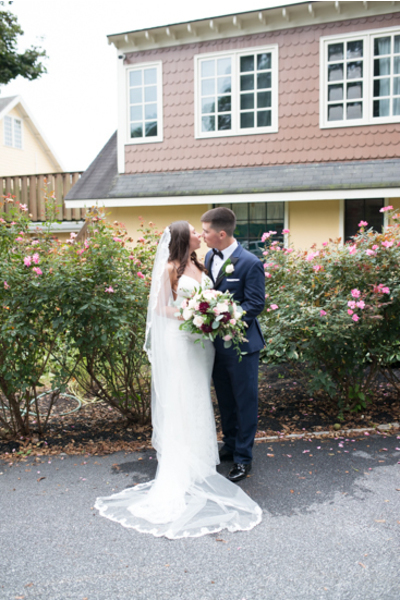 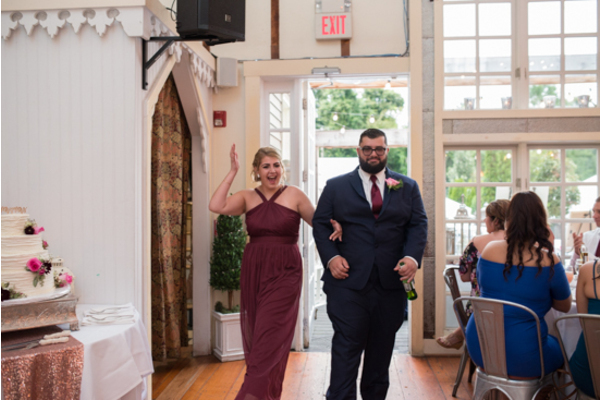 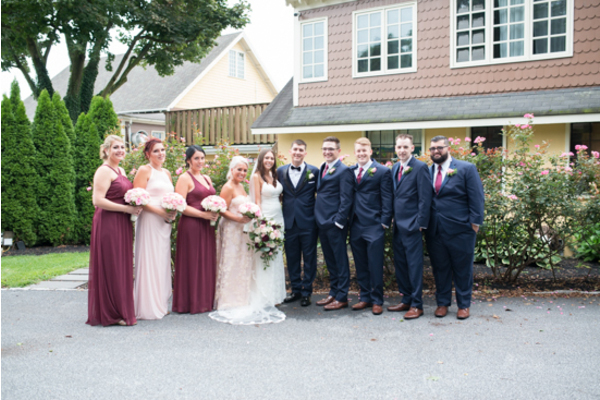 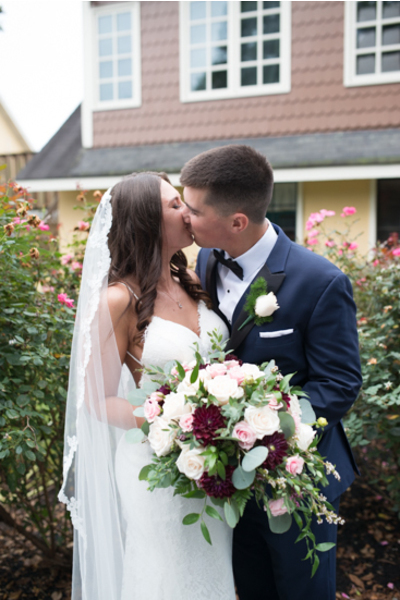 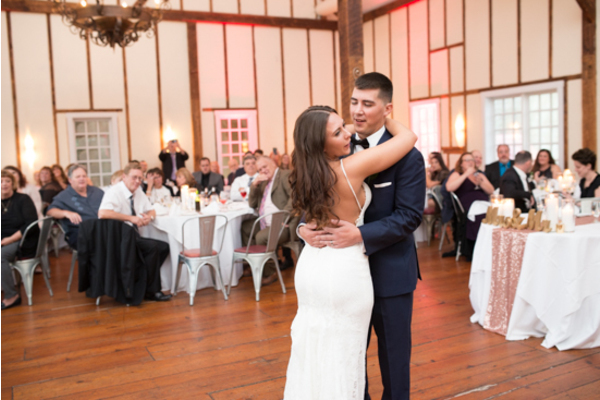 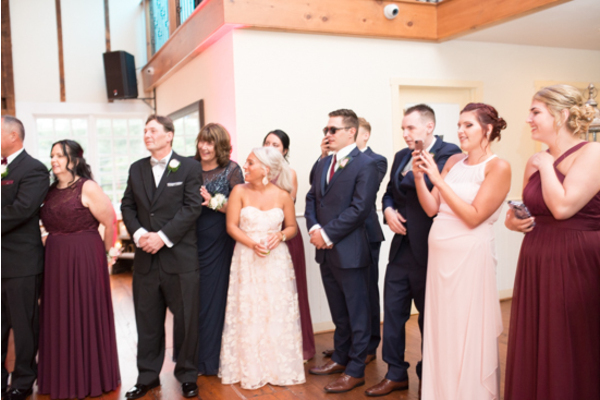 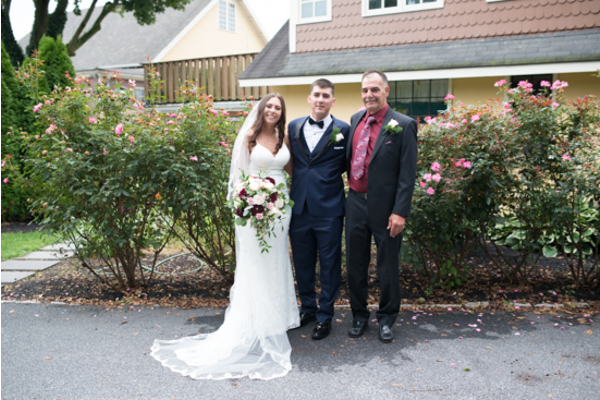 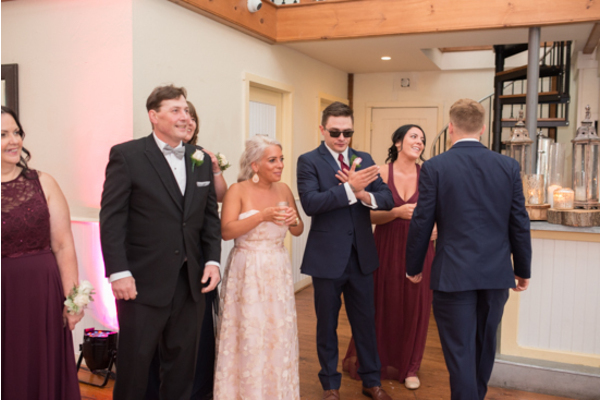 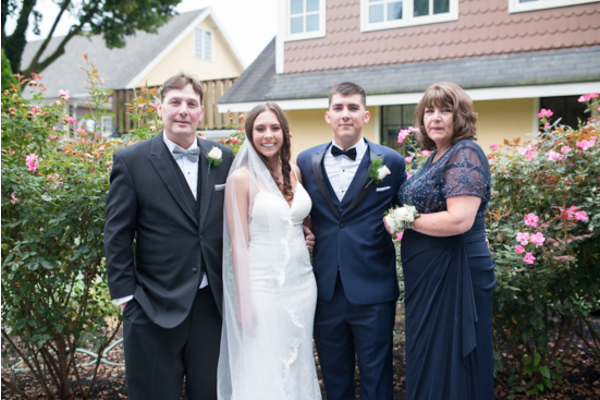 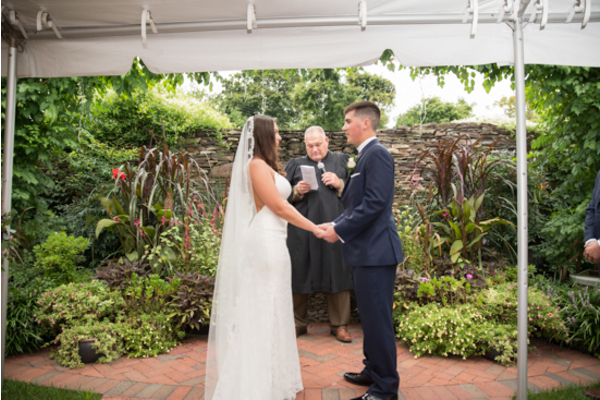 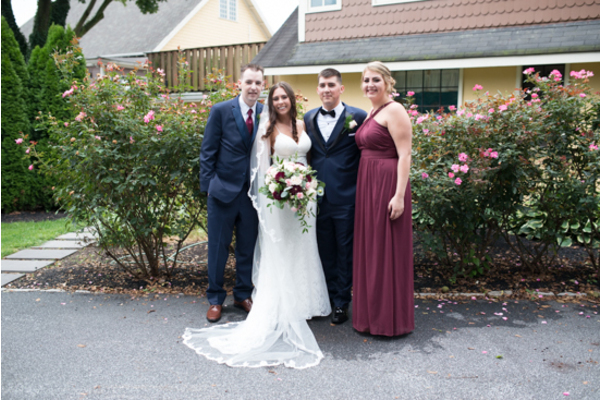 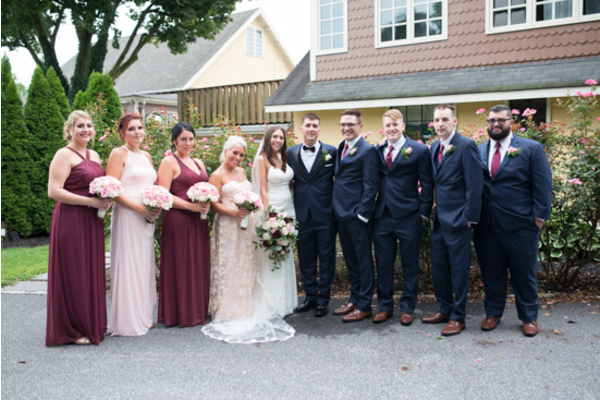 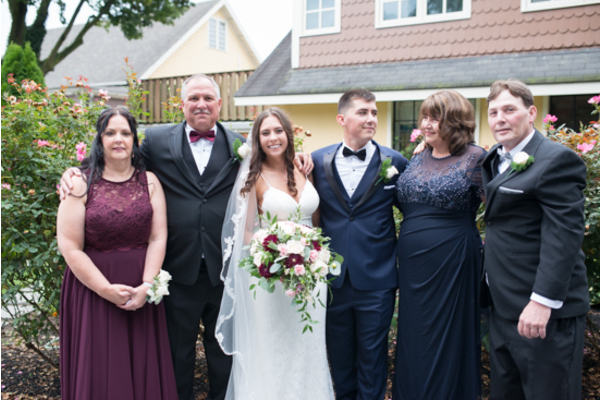 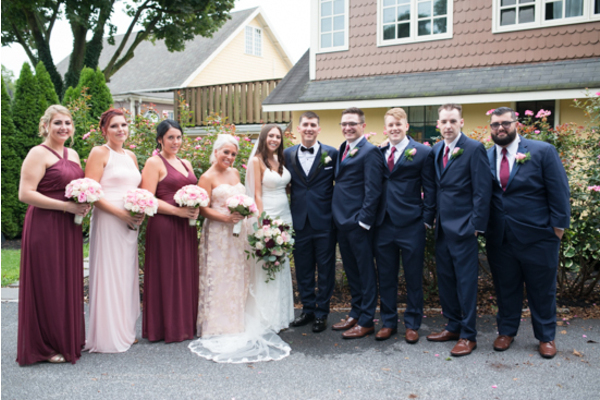 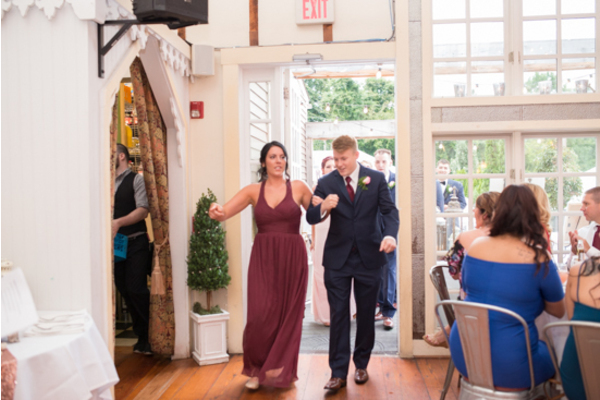 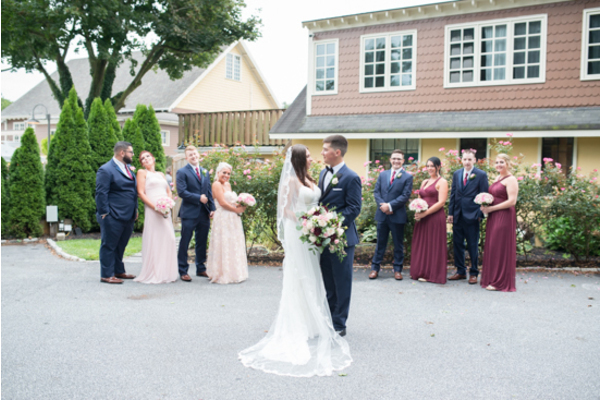 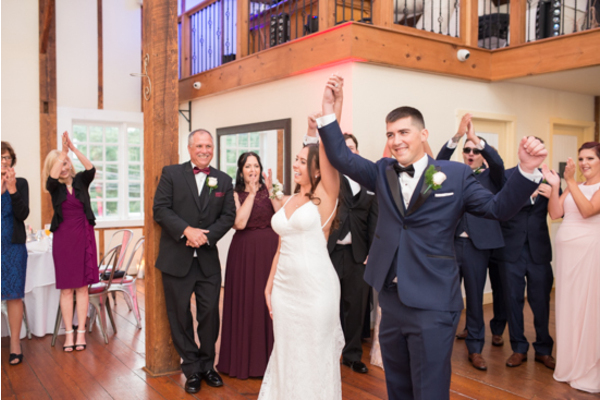 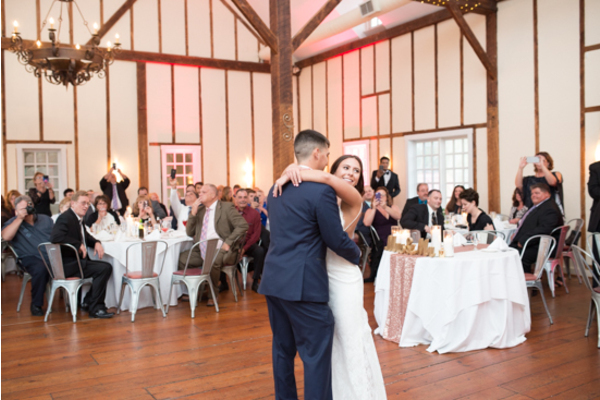 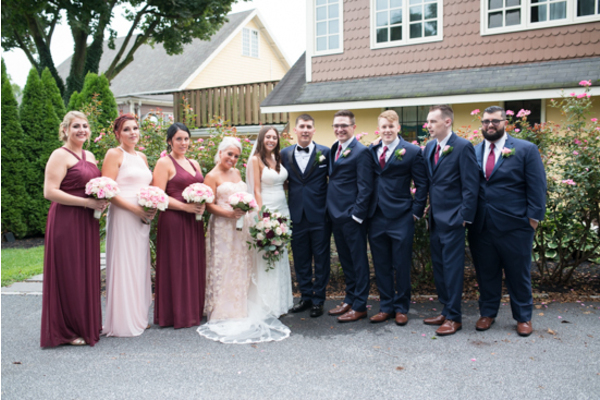 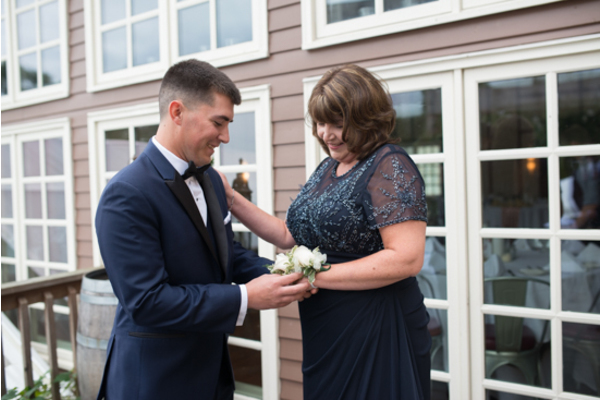 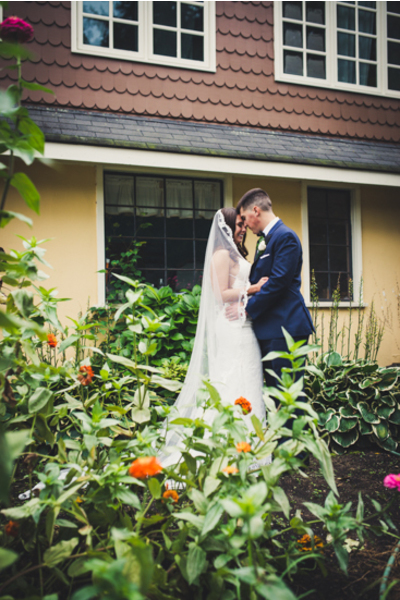 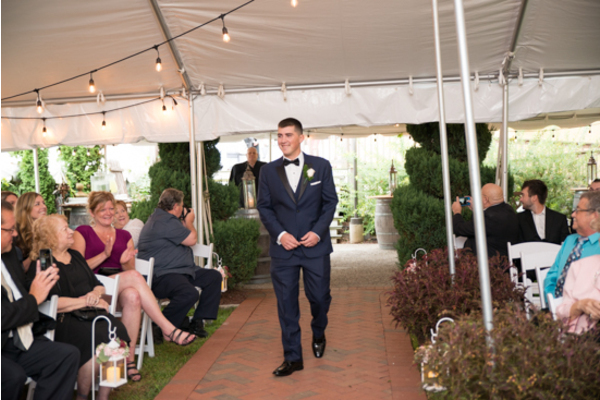 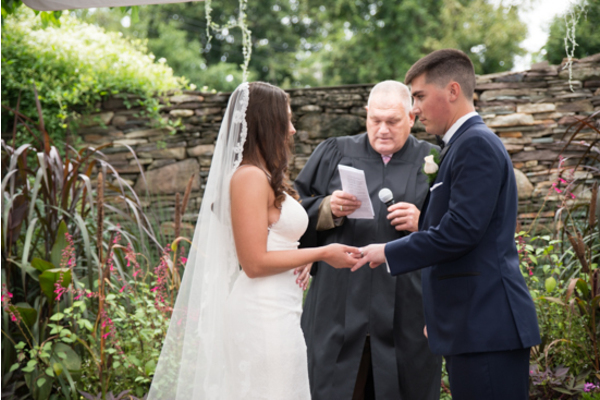 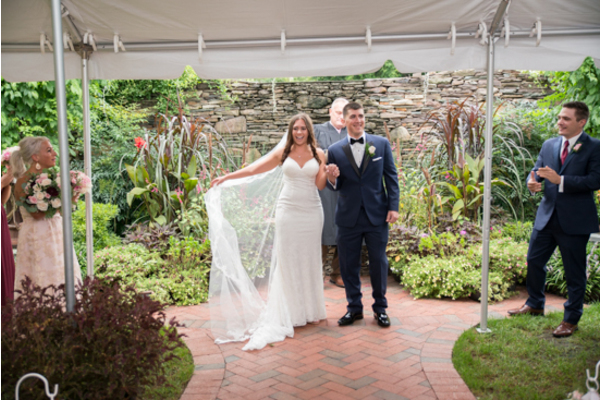 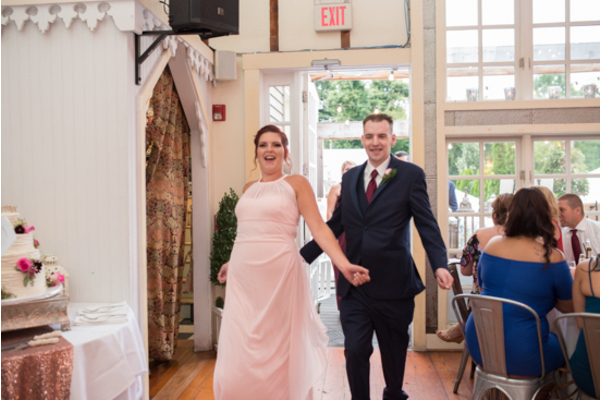 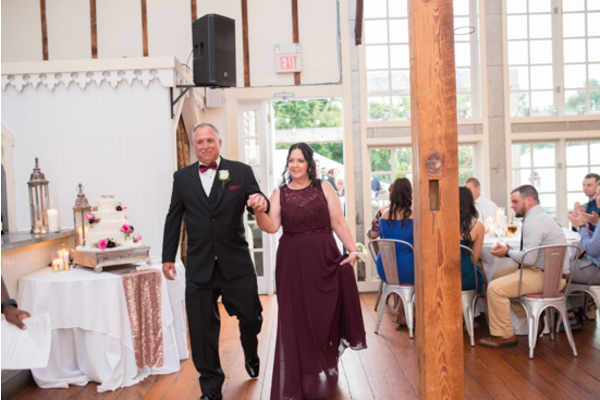 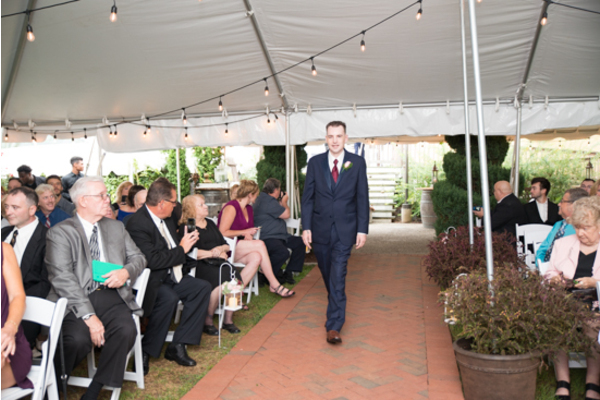 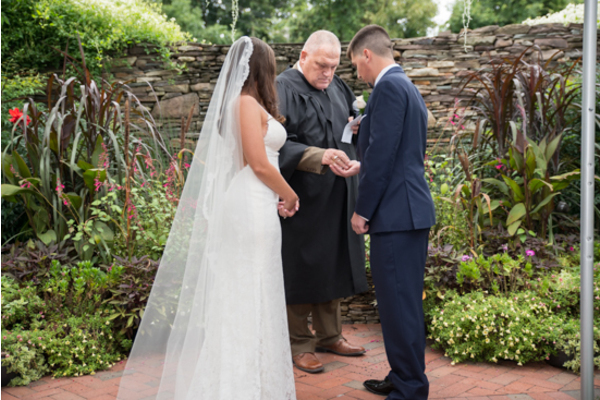 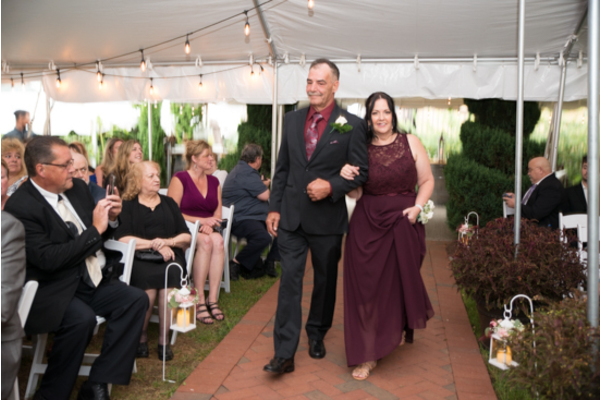 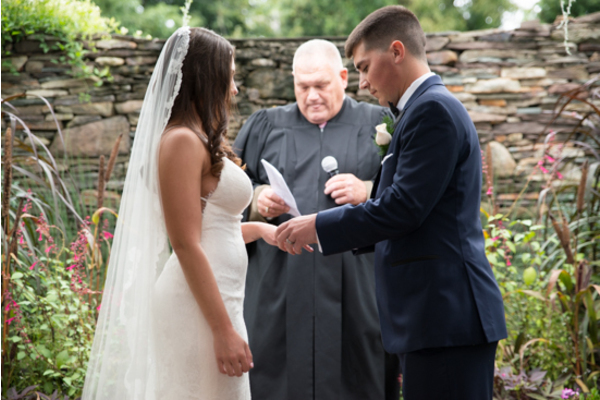 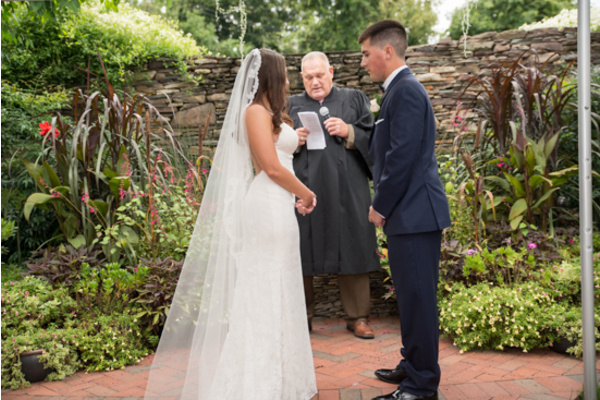 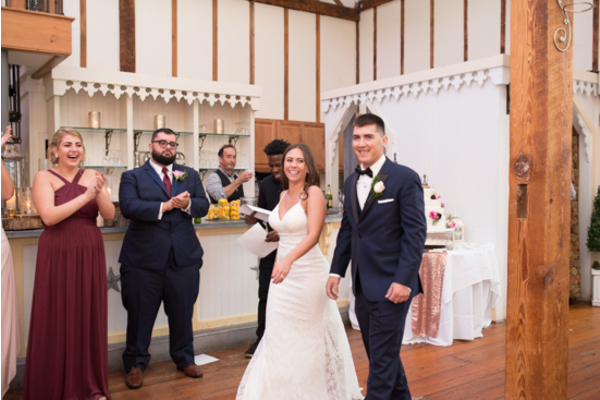 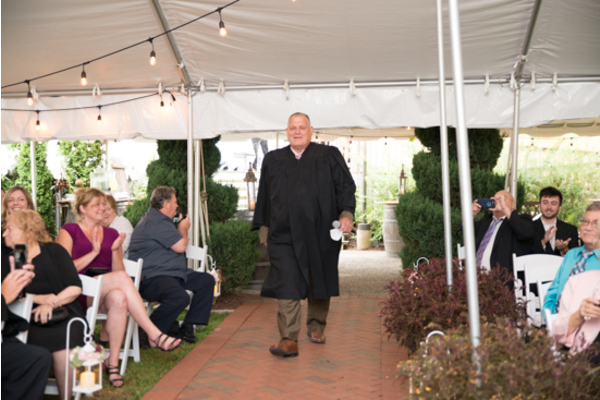 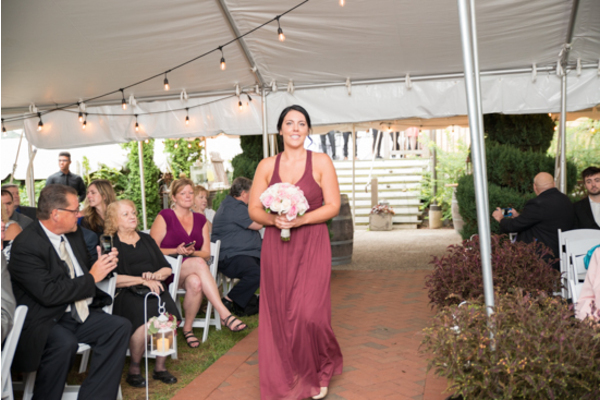 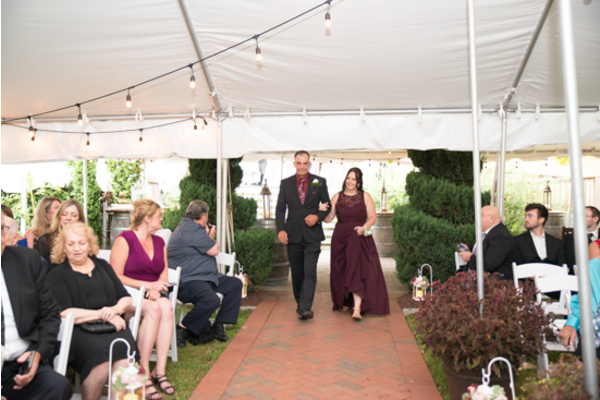 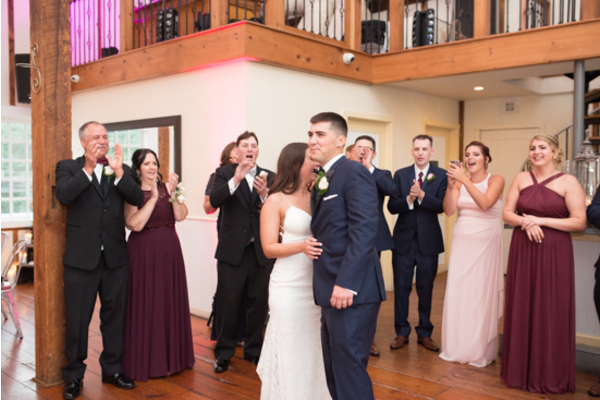 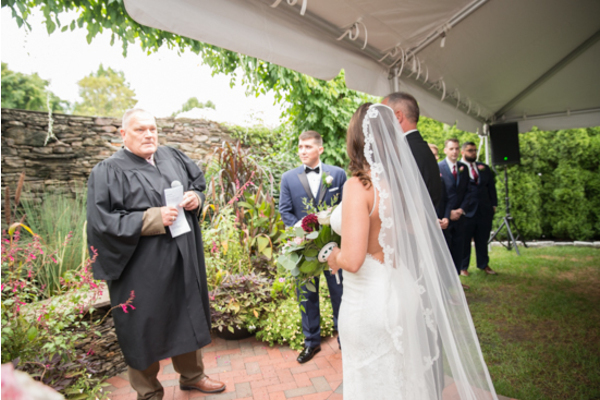 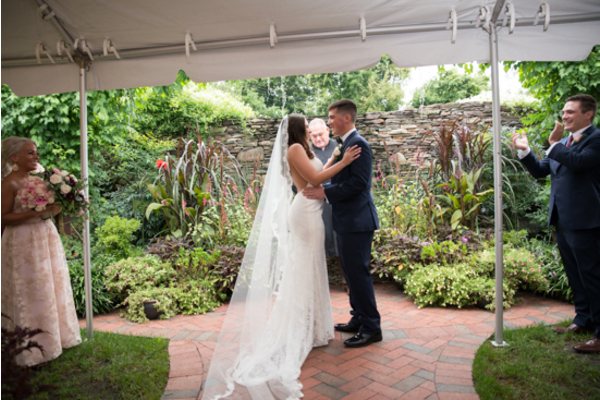 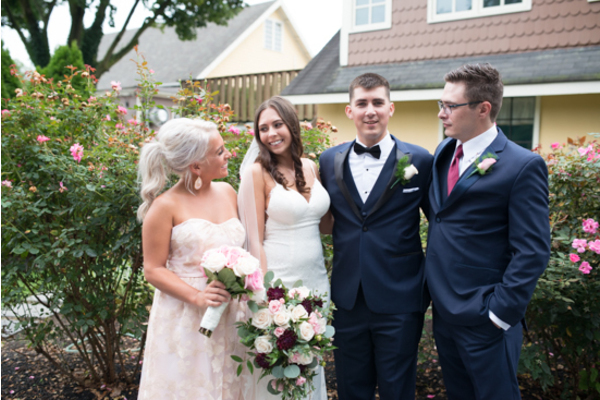 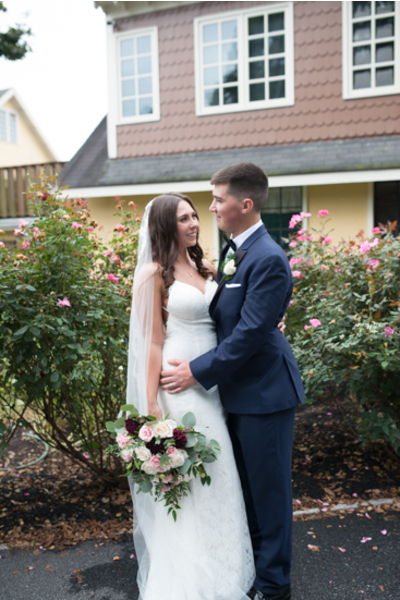 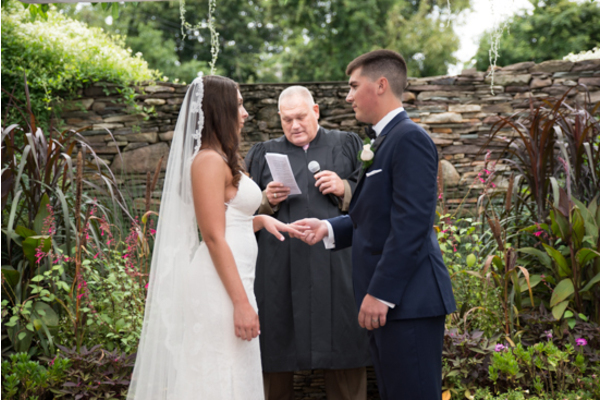 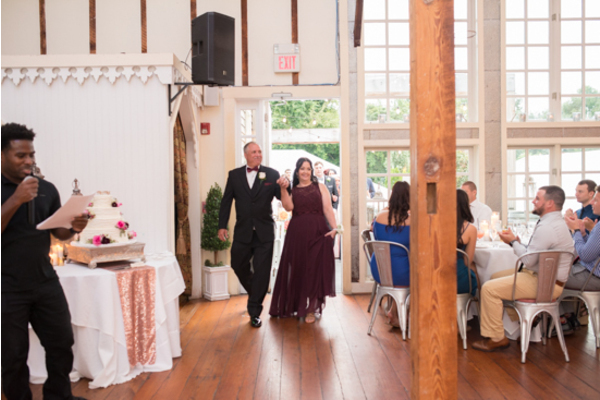 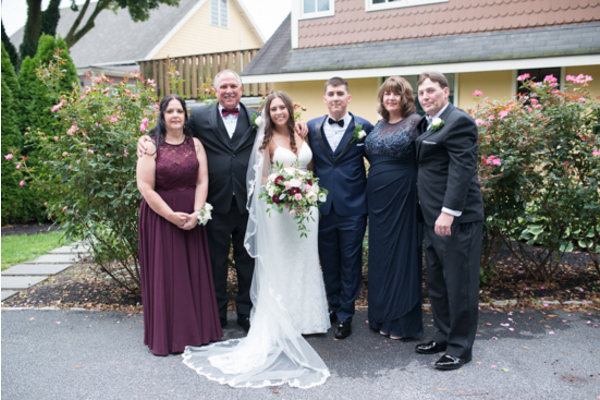 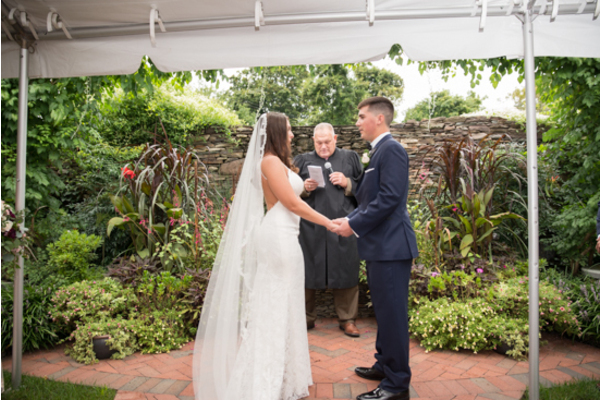 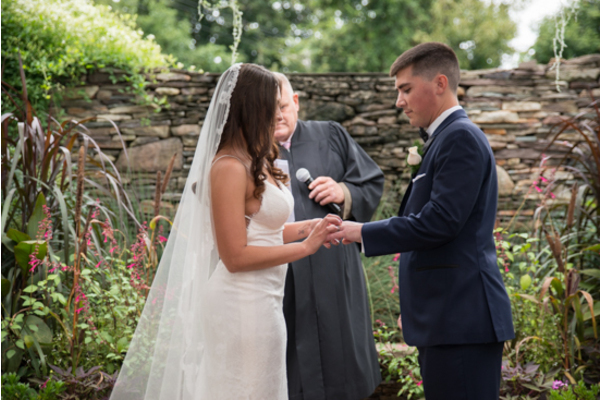 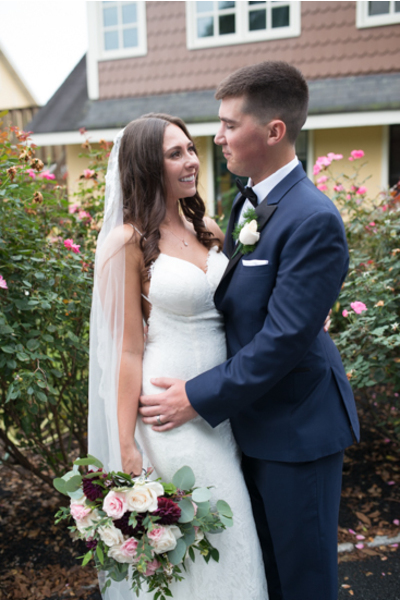 They tied the knot at The Gables at Chadds Ford in Pennsylvania on September 8th, 2018. 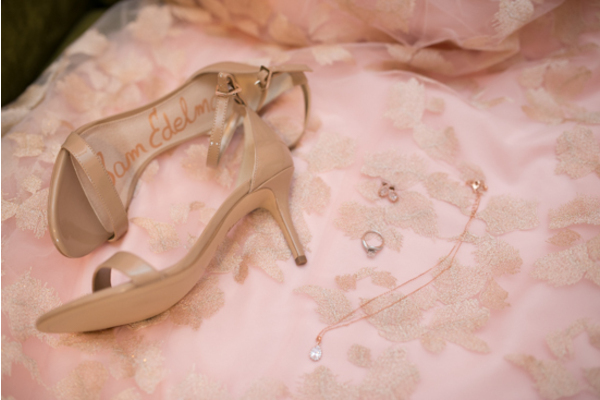 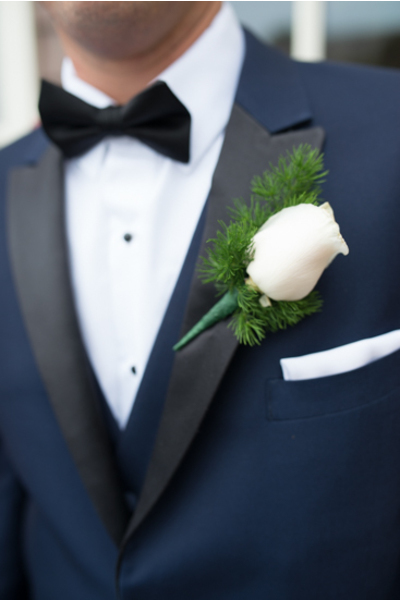 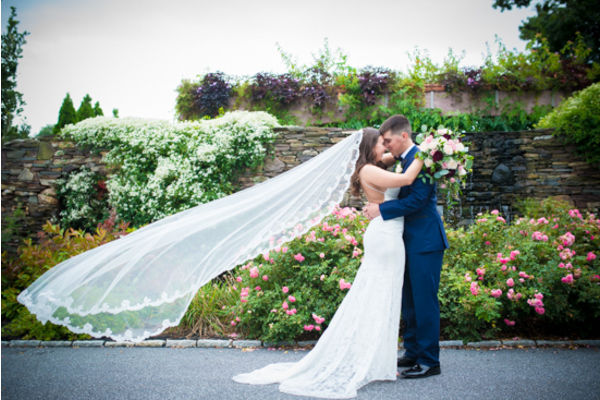 Every detail of their special day was spectacular! 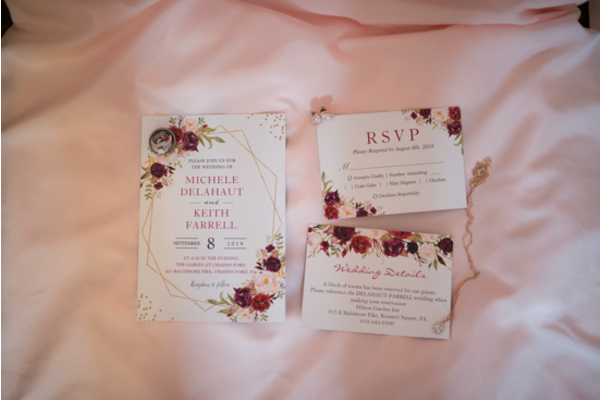 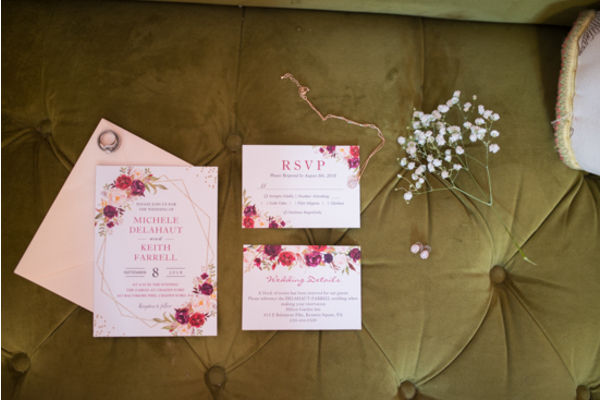 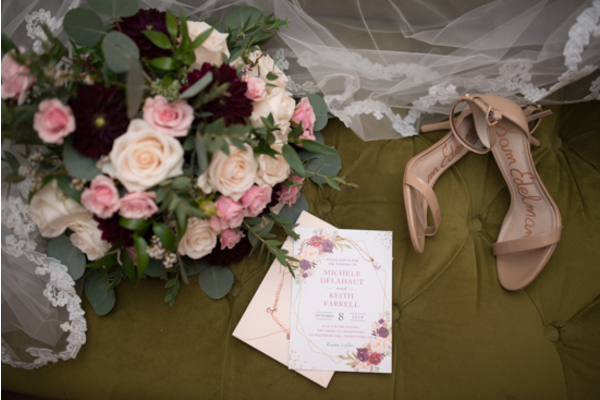 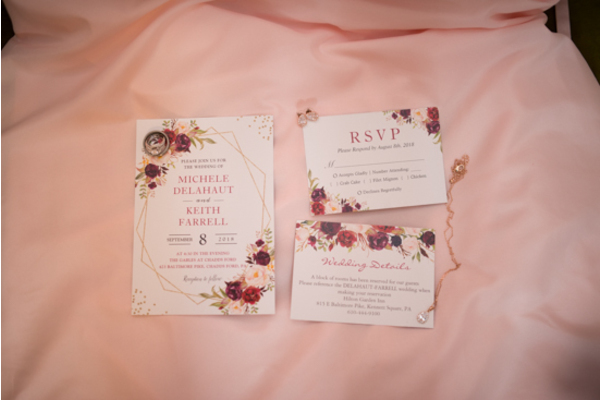 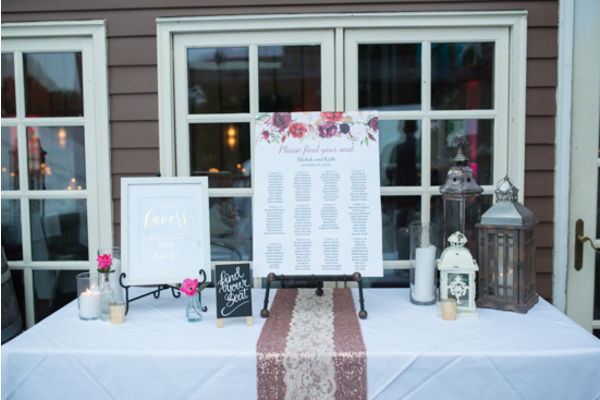 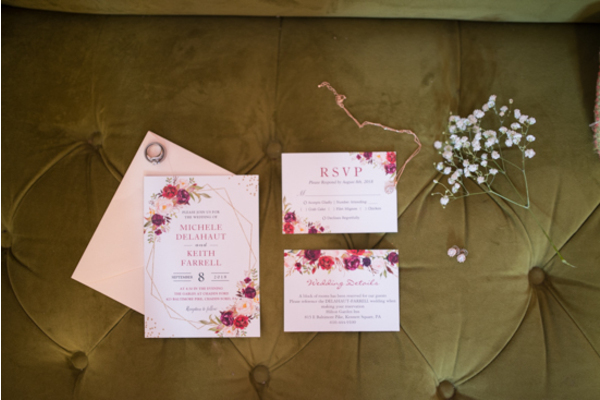 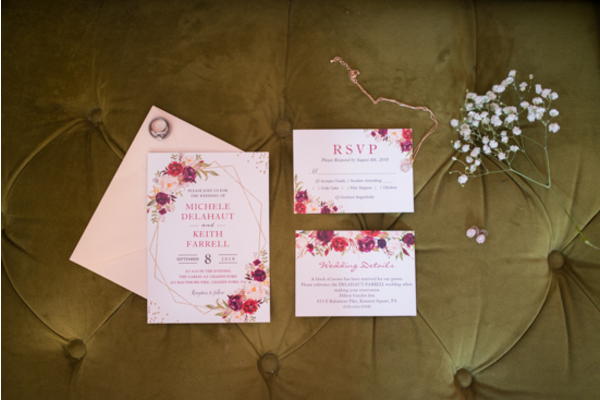 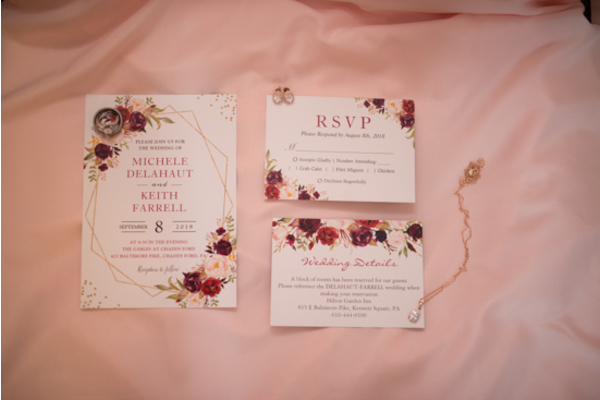 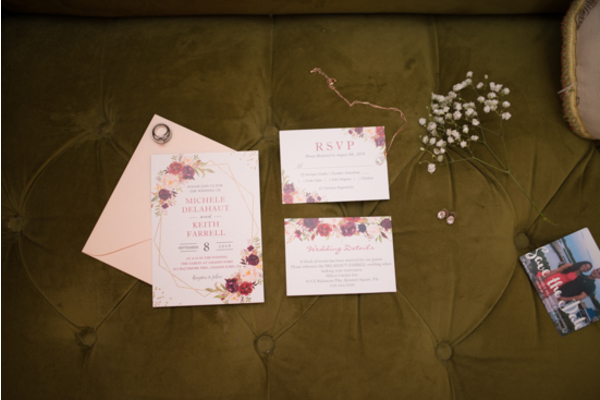 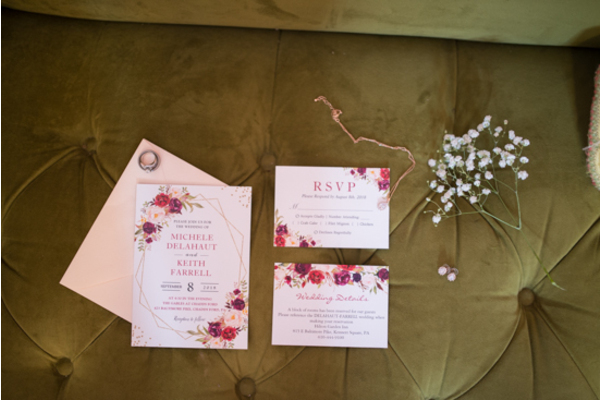 Months before the big day, guests received save the dates that were decorated with pale, pink roses and red and purple flowers. 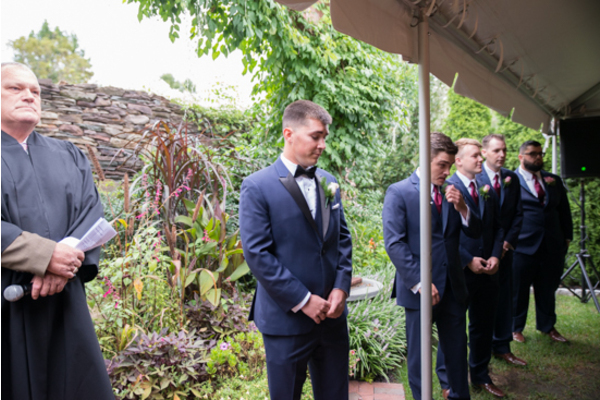 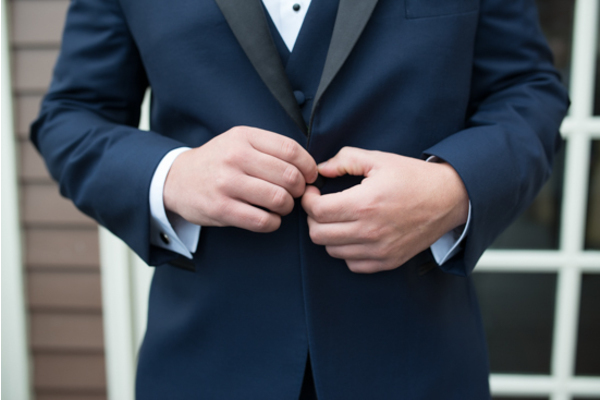 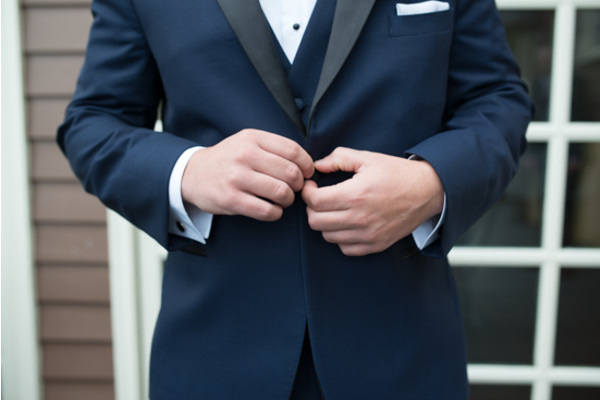 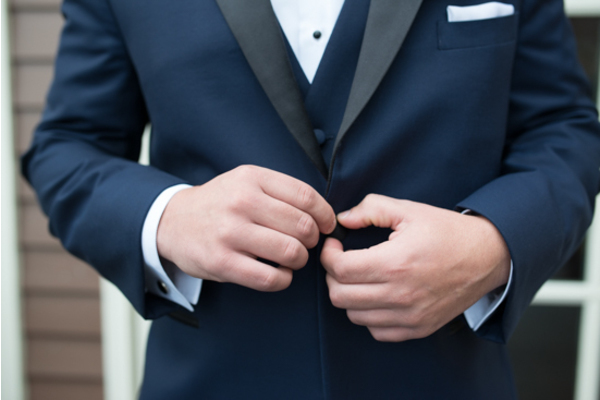 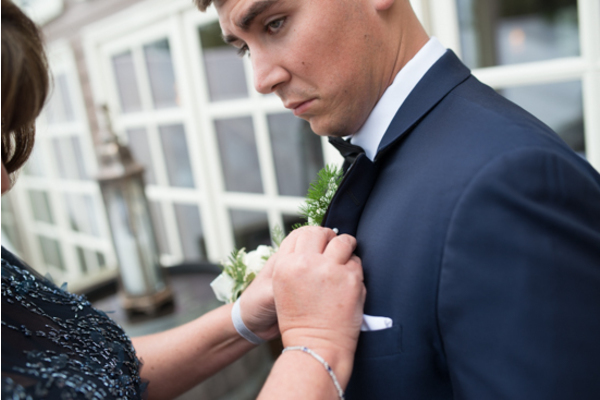 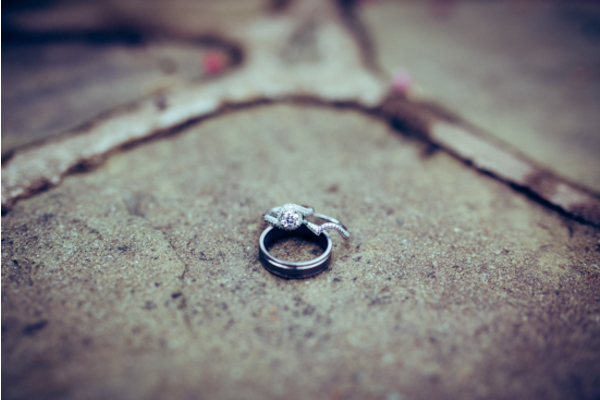 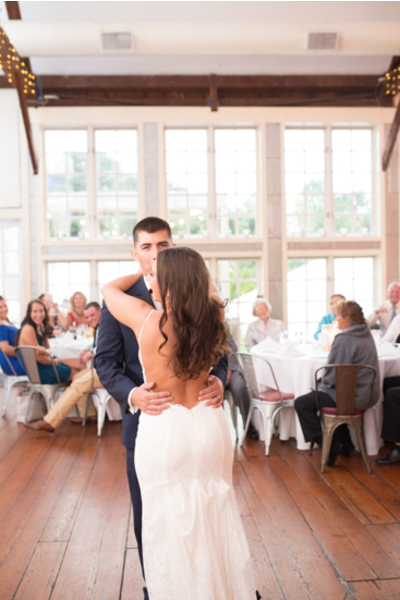 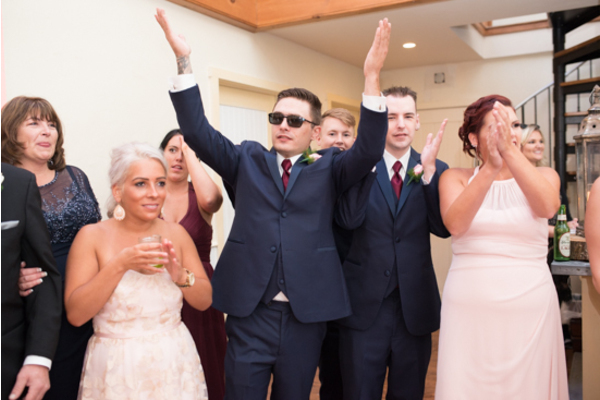 This gave their loved ones a sneak peak to what the wedding day would entail. 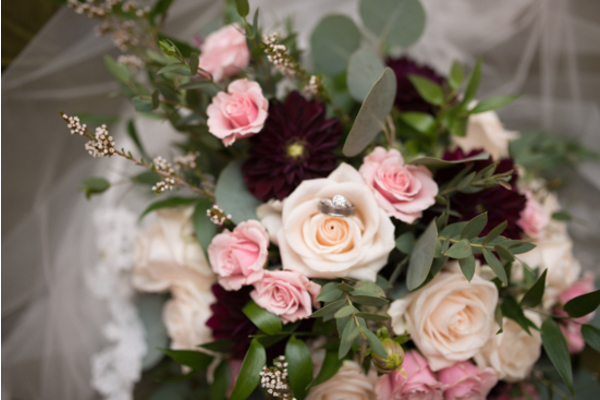 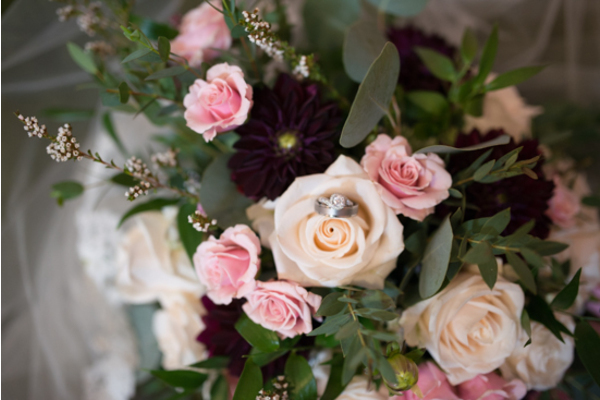 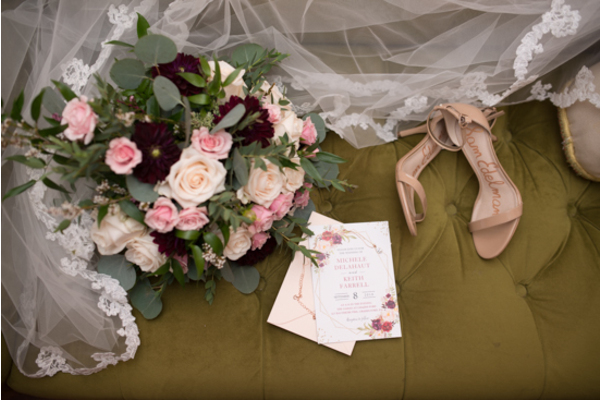 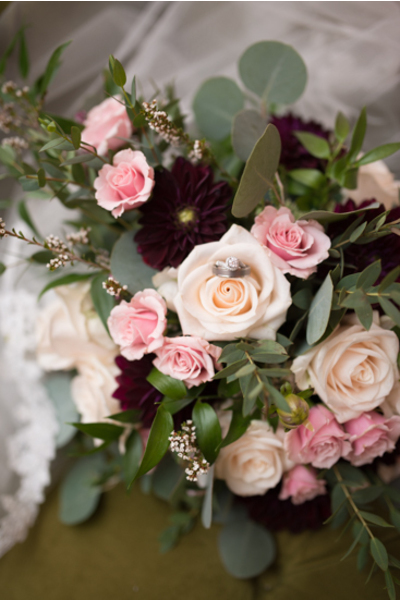 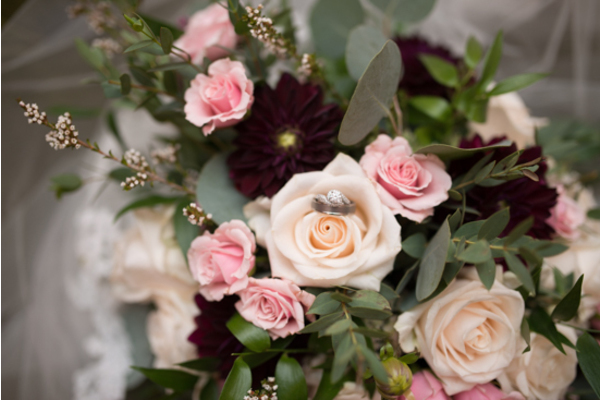 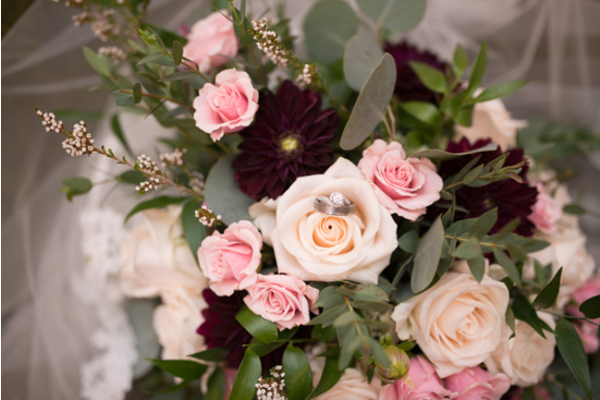 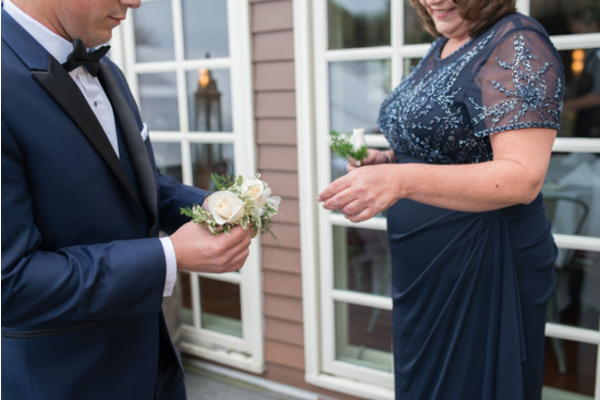 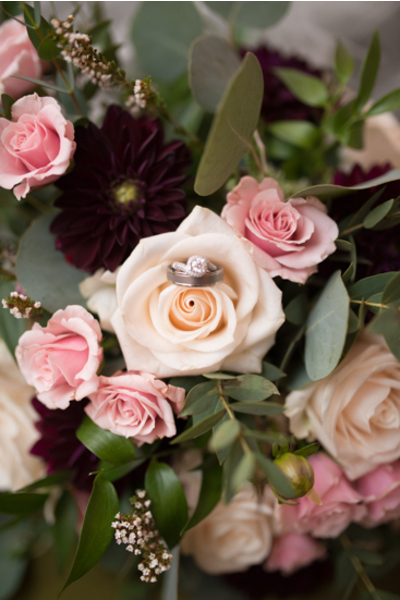 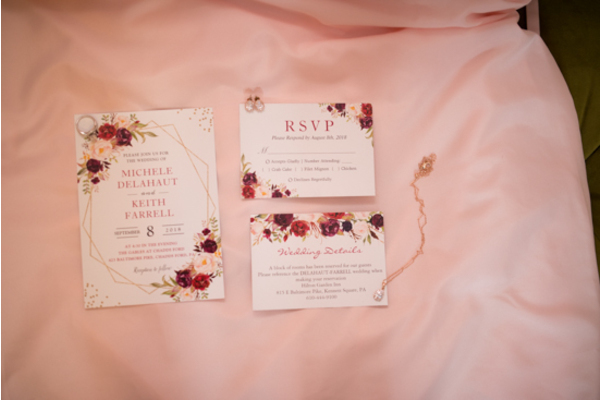 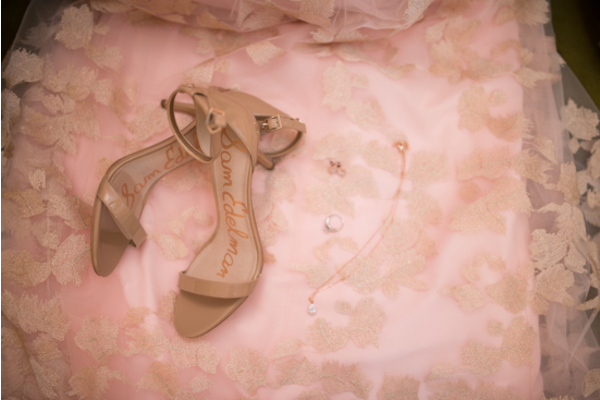 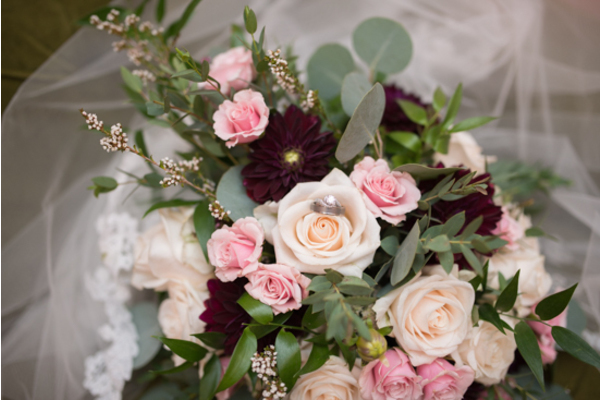 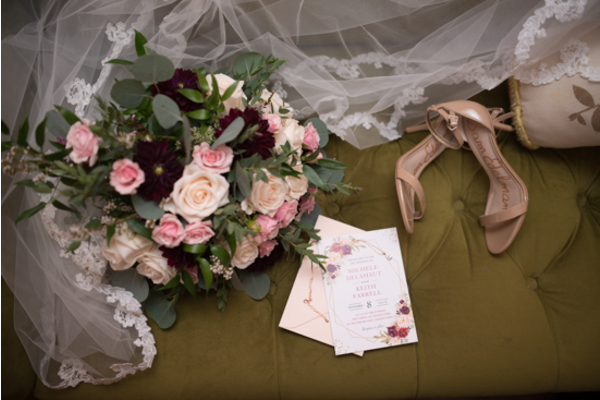 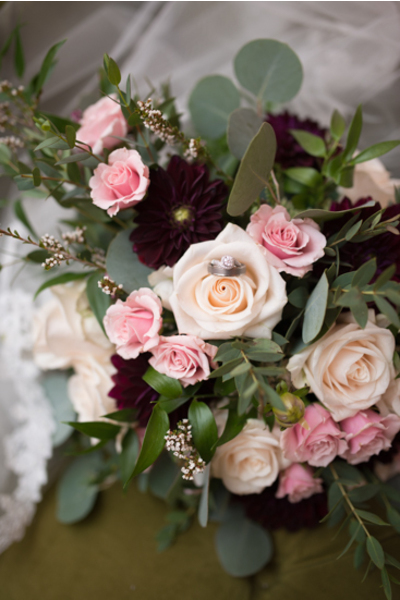 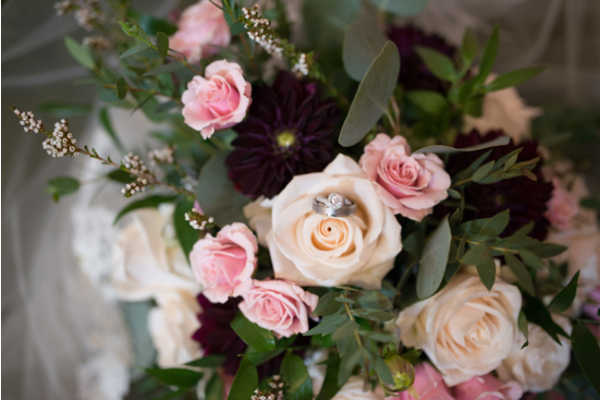 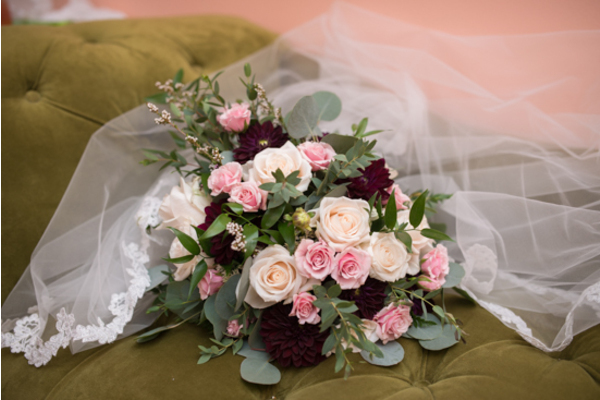 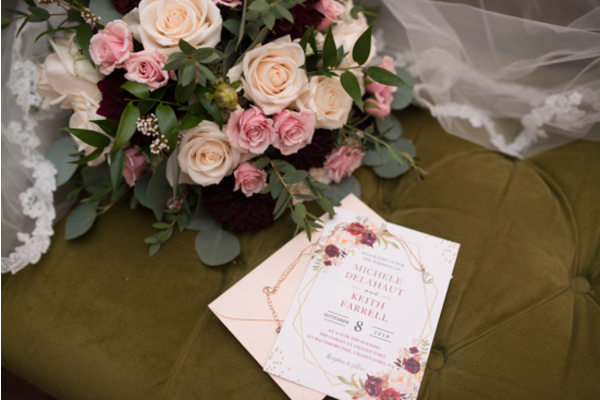 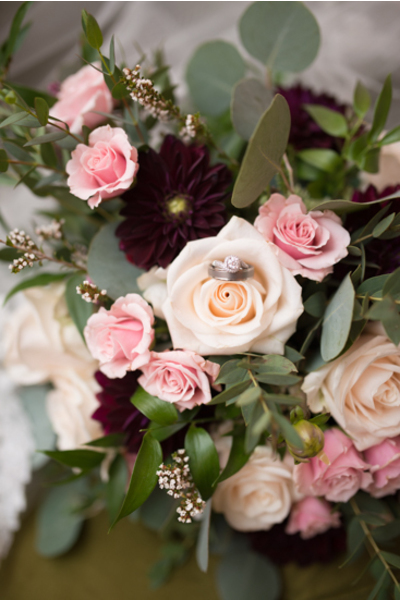 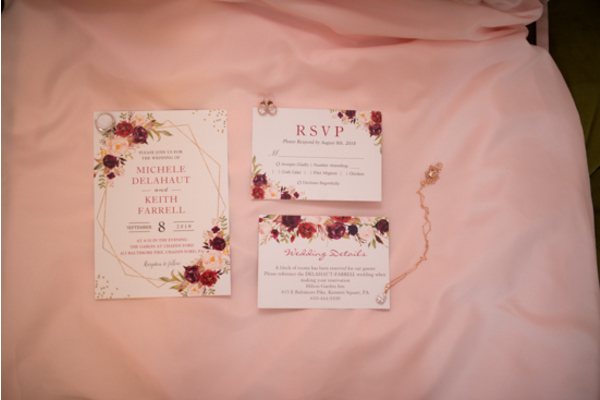 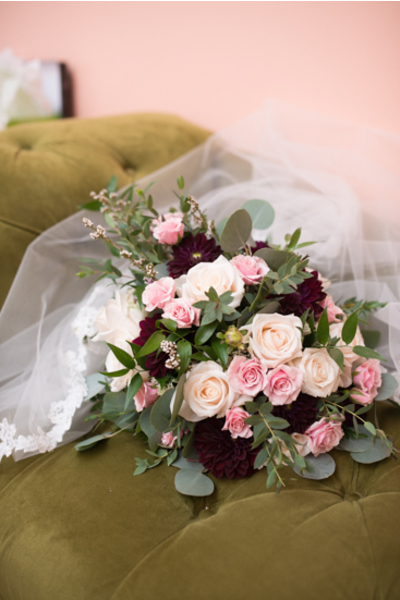 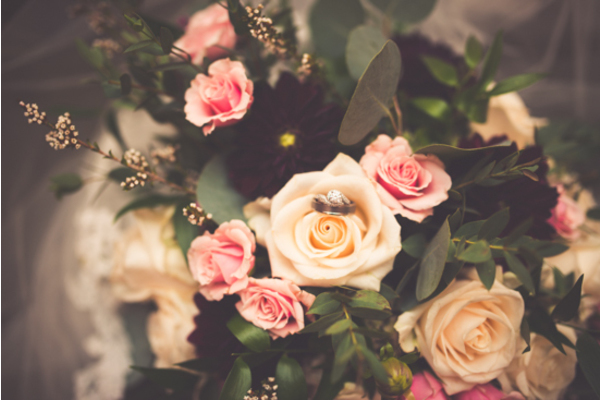 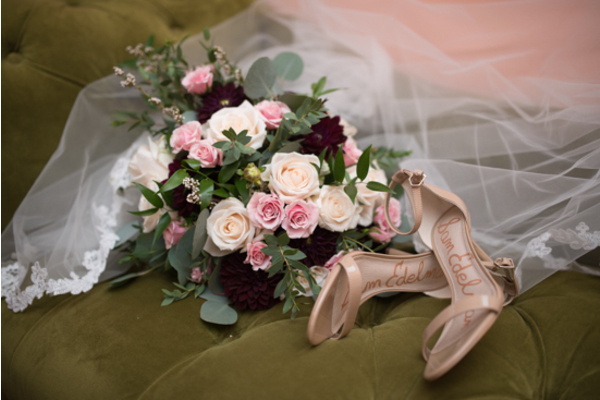 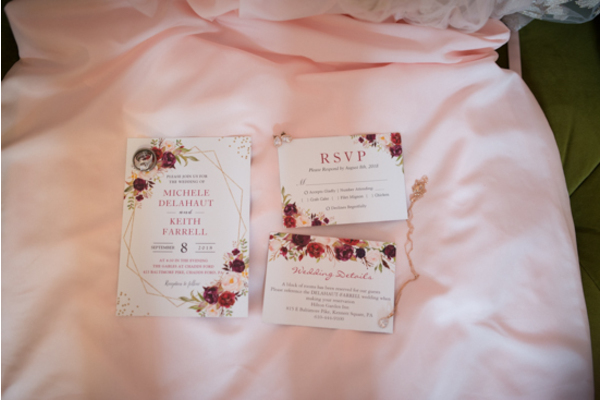 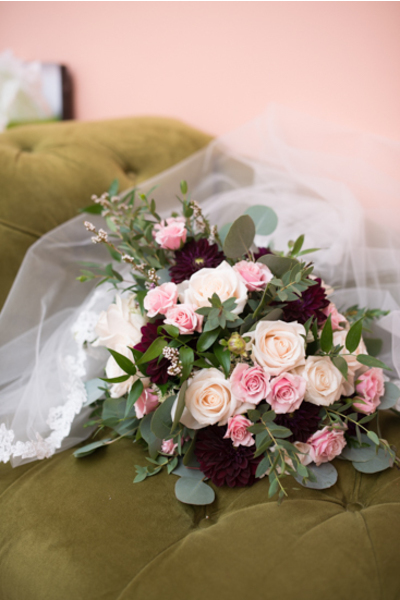 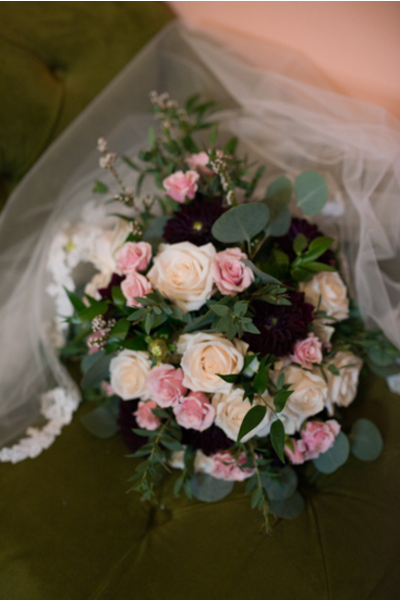 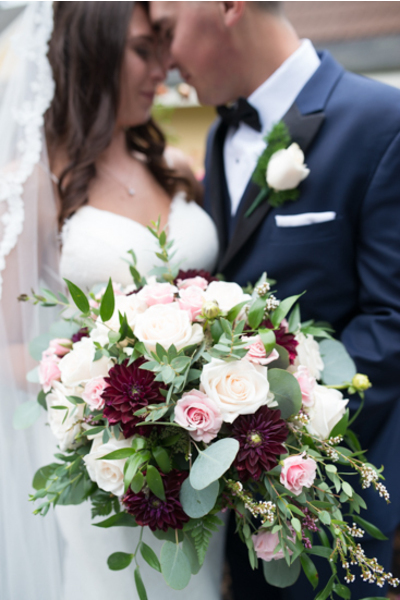 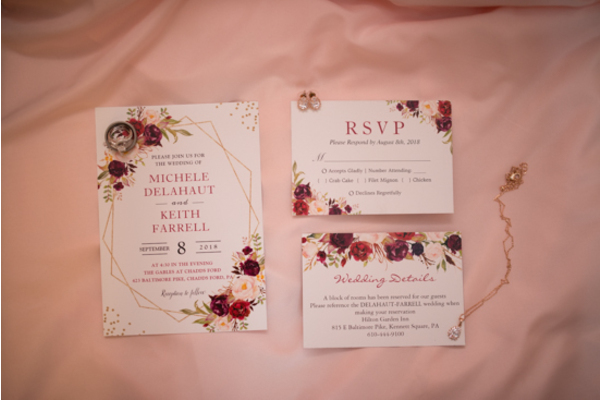 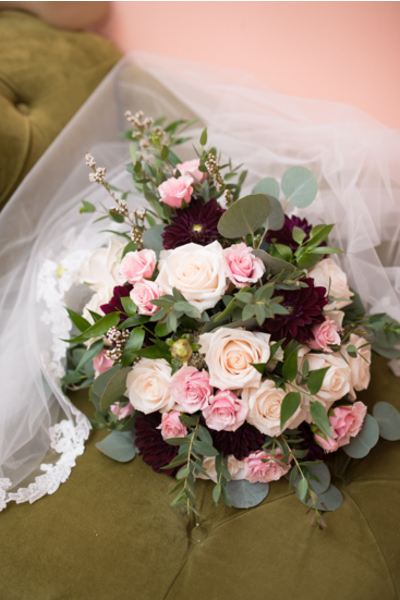 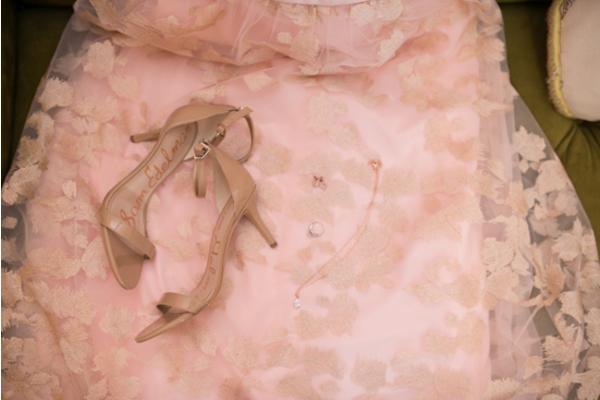 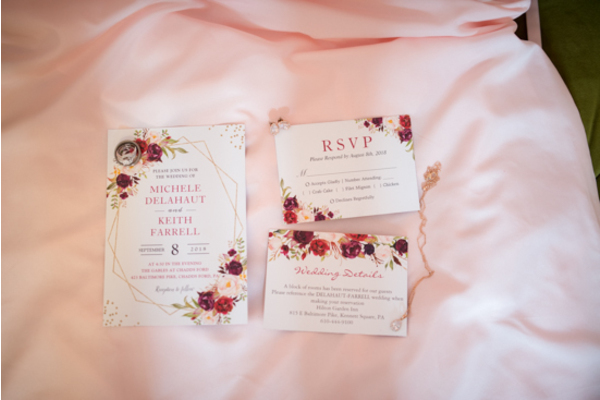 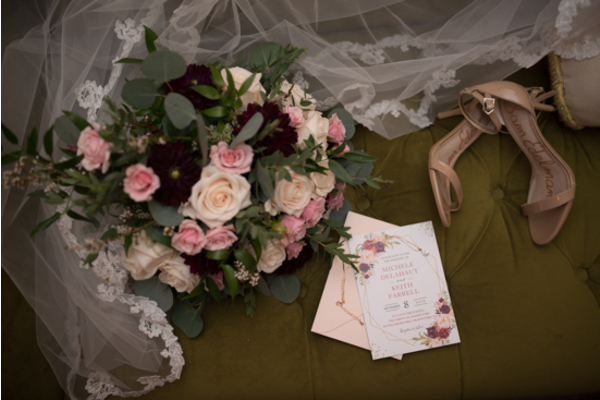 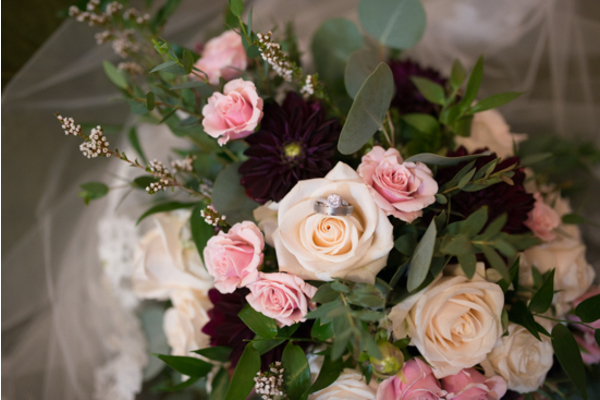 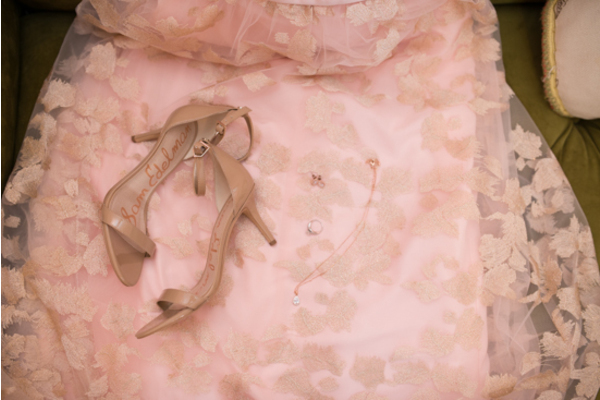 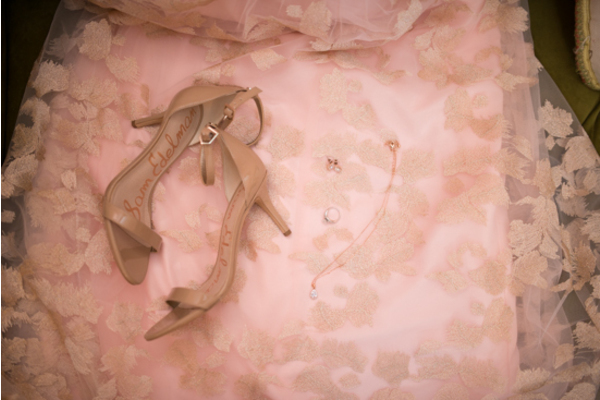 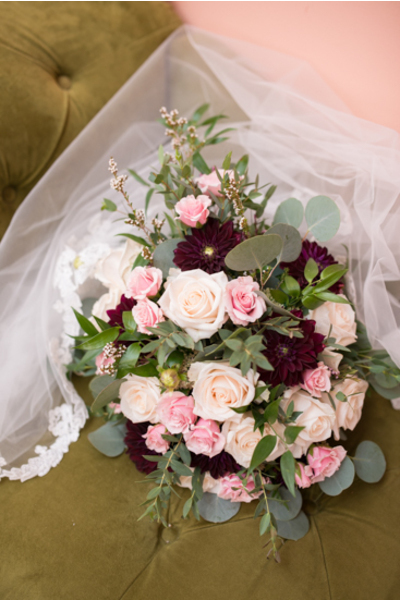 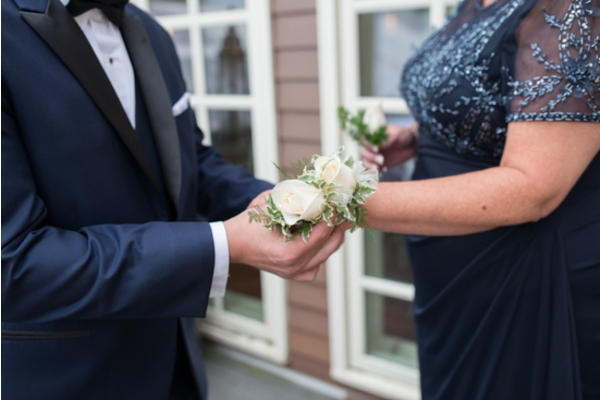 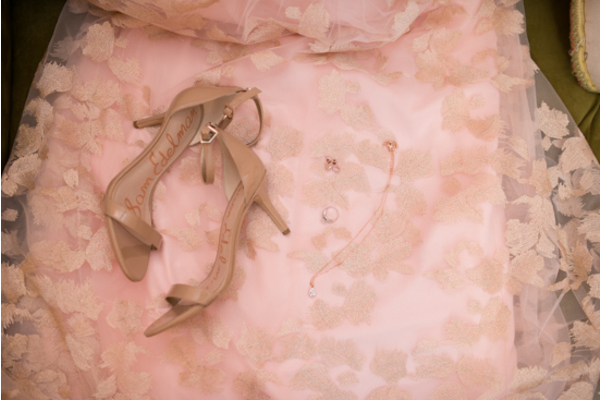 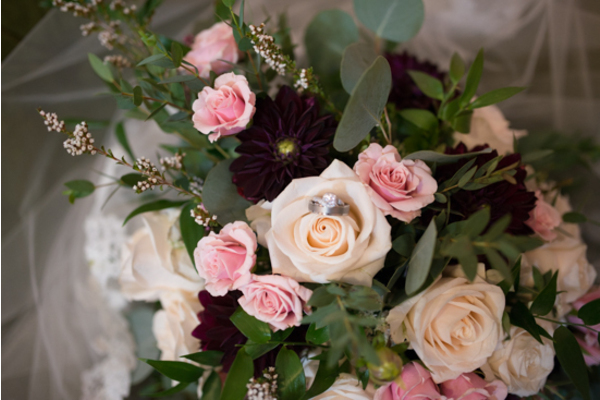 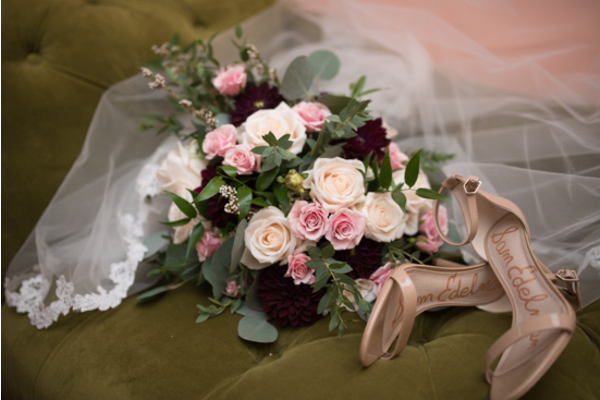 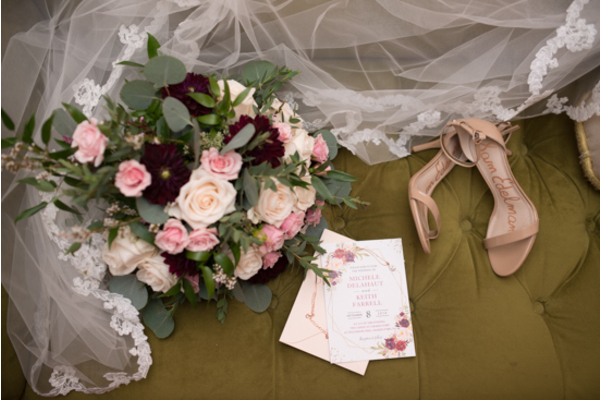 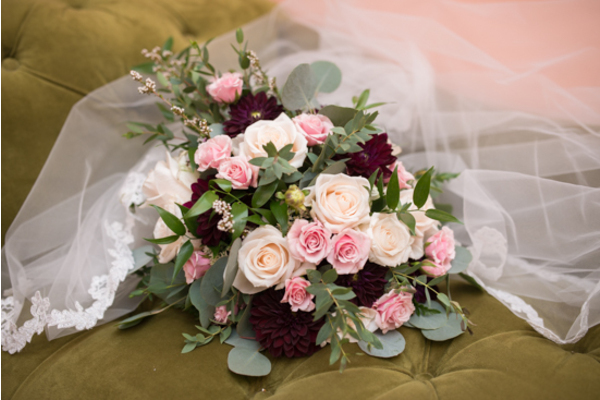 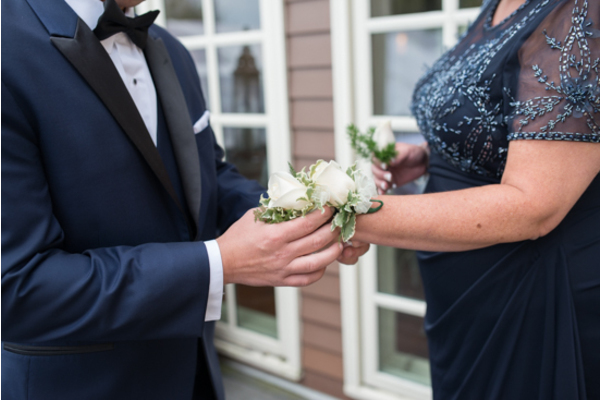 Michele’s bouquet was an exact replica of the save the dates, stunning! 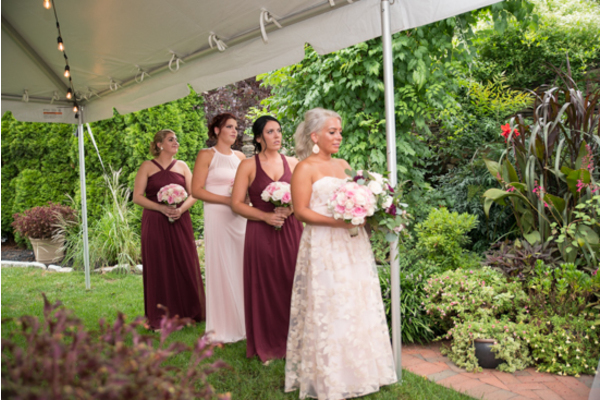 She began her morning with her bridesmaids getting her hair and makeup done to perfection. 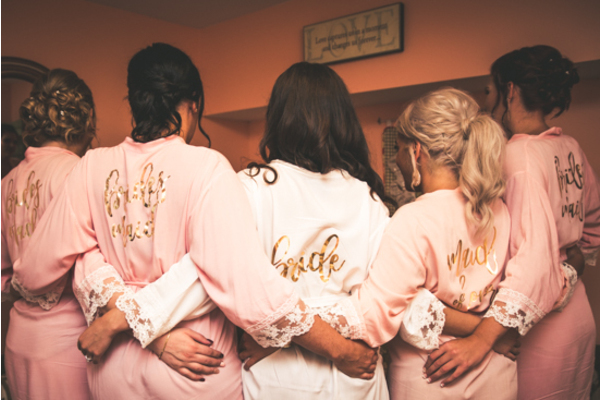 Our PA Wedding Photographer was with the girls in their matching pink robes as they cheered to the days festivities. Nearby, Keith was doing his own pre-wedding preparations as well! 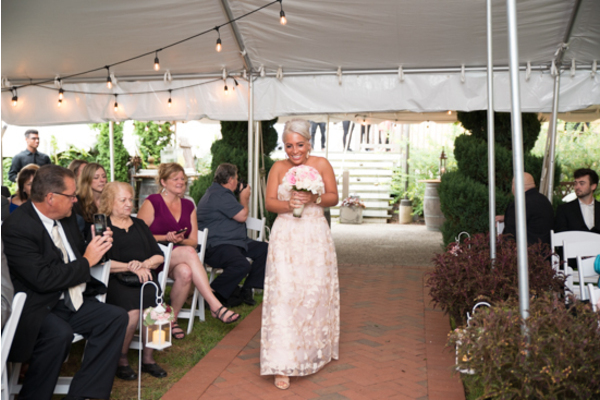 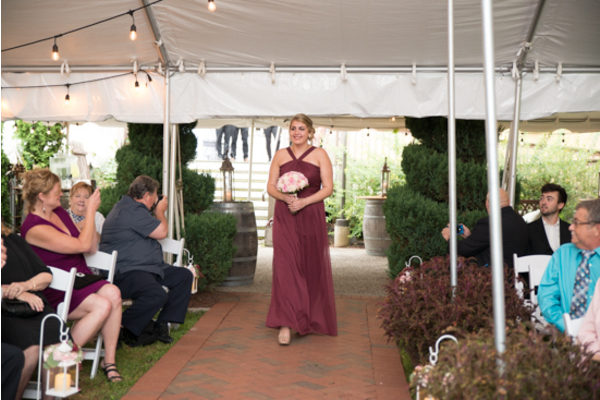 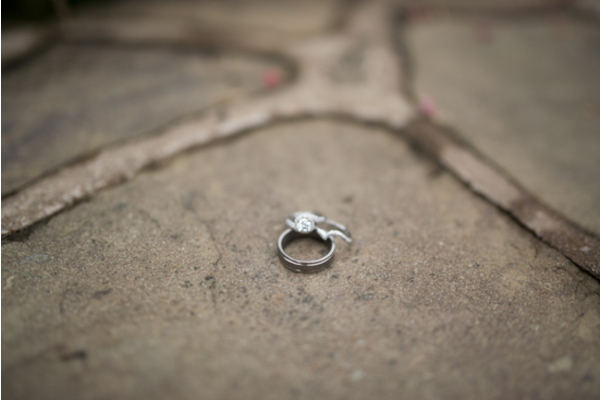 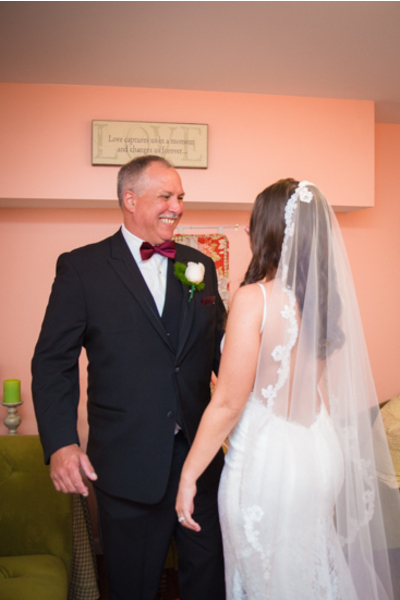 There is something so special about seeing your bride for the first time walking down the aisle. 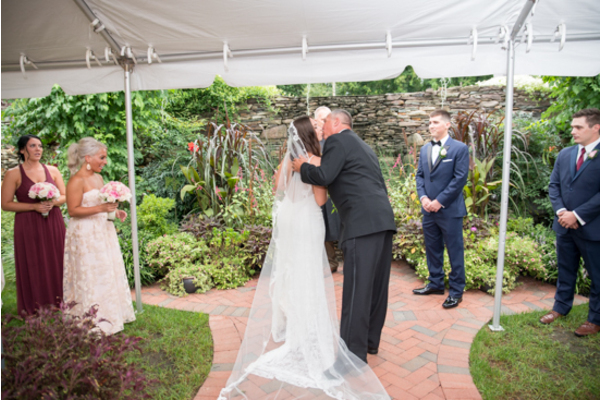 Keith’s sweet reaction just said it all! 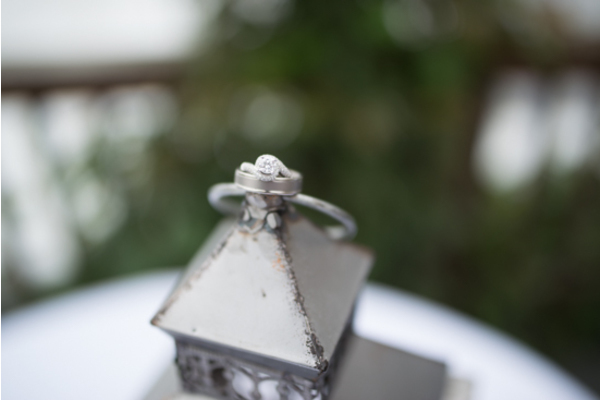 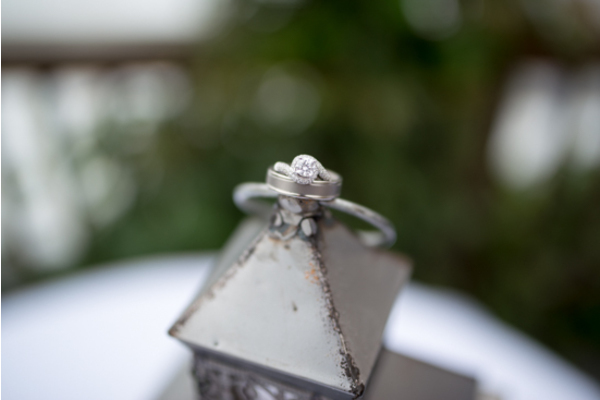 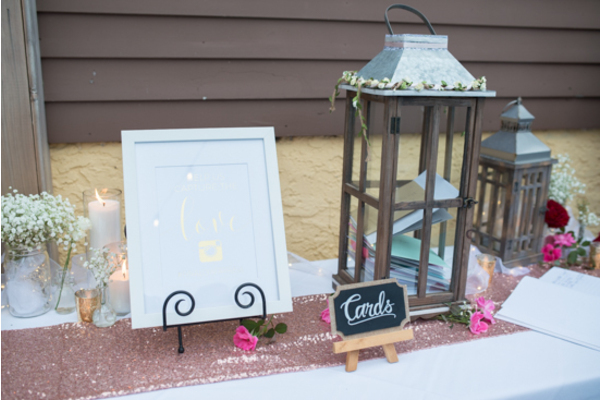 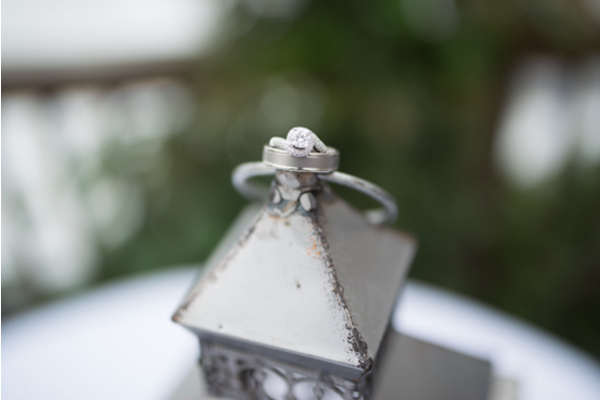 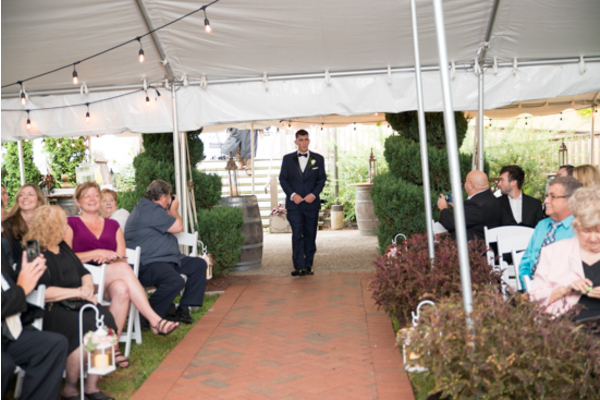 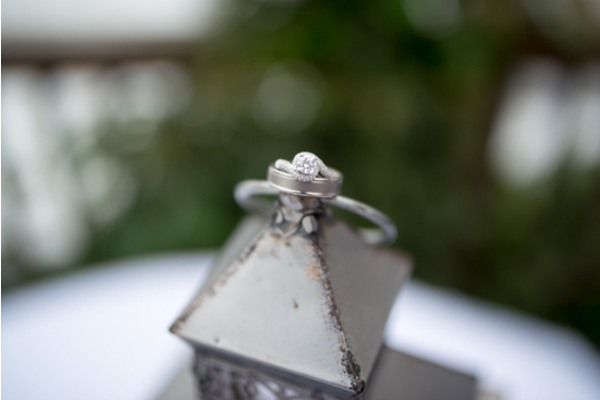 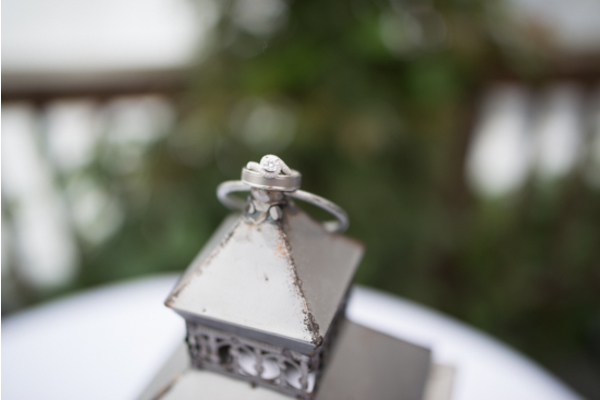 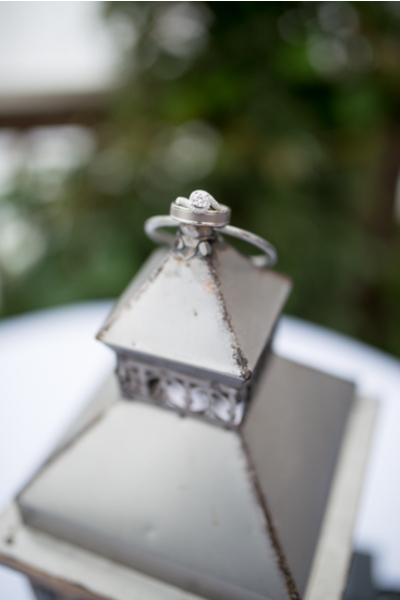 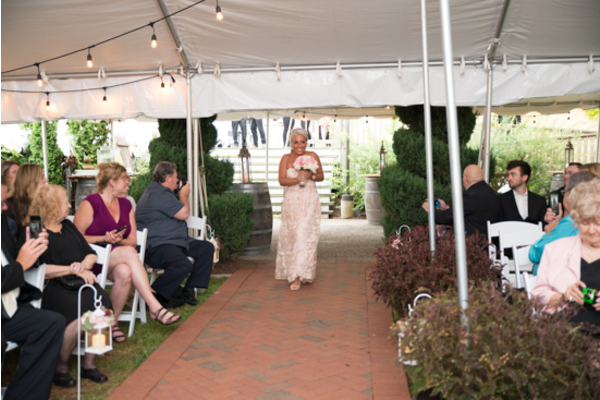 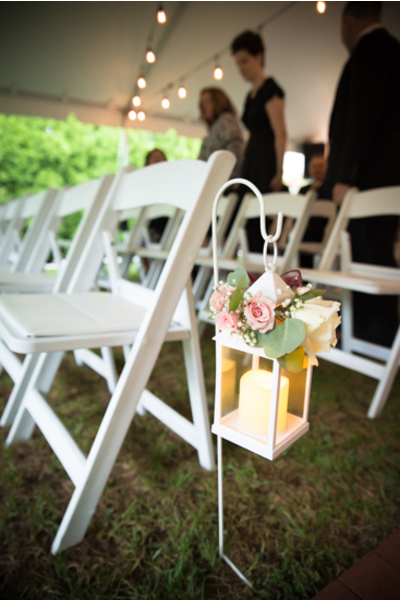 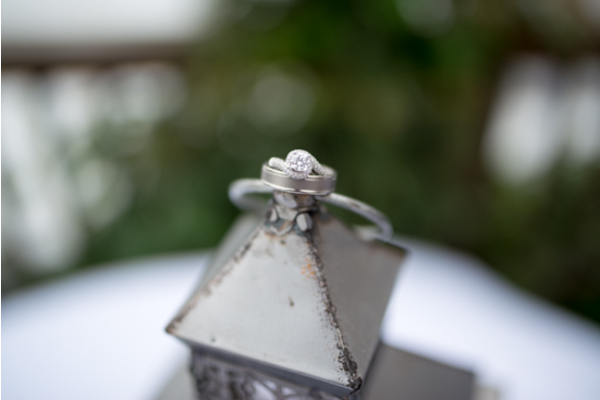 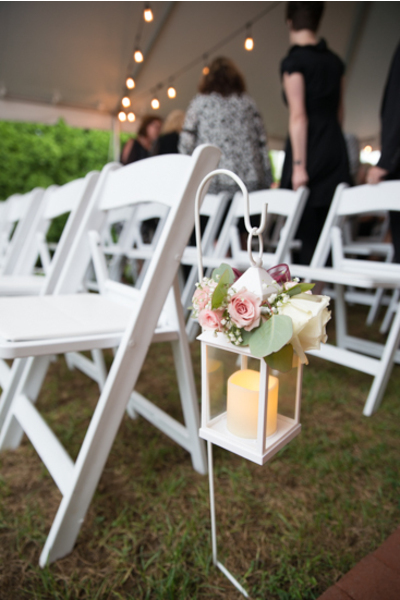 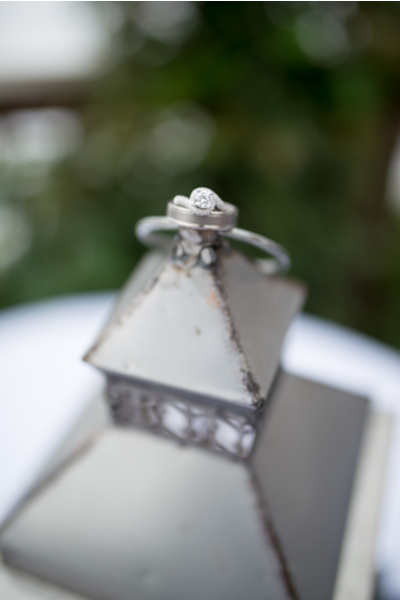 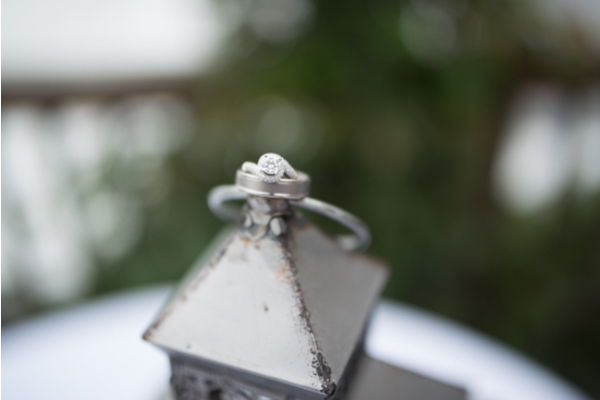 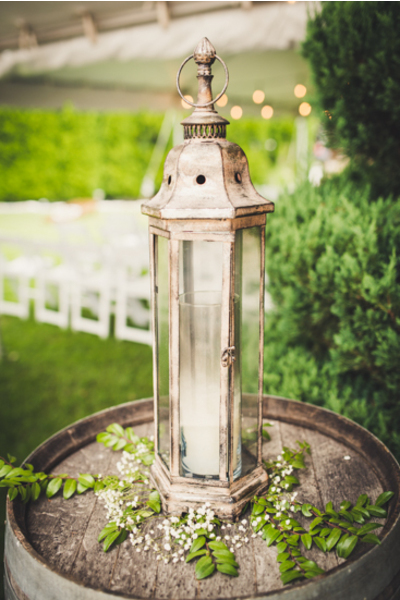 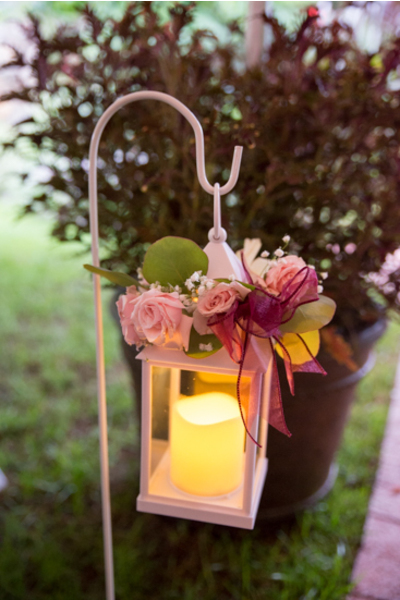 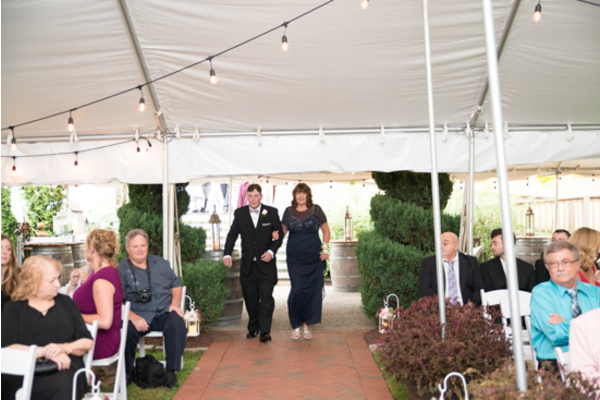 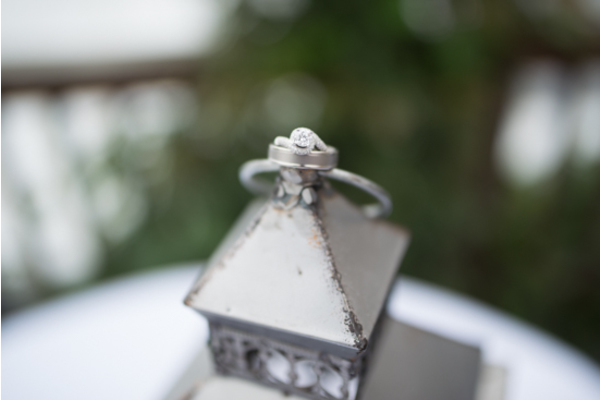 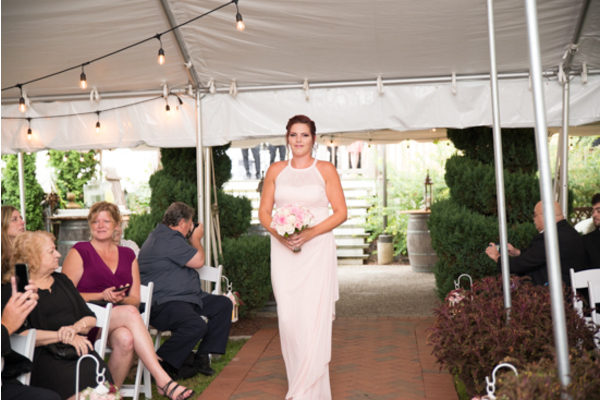 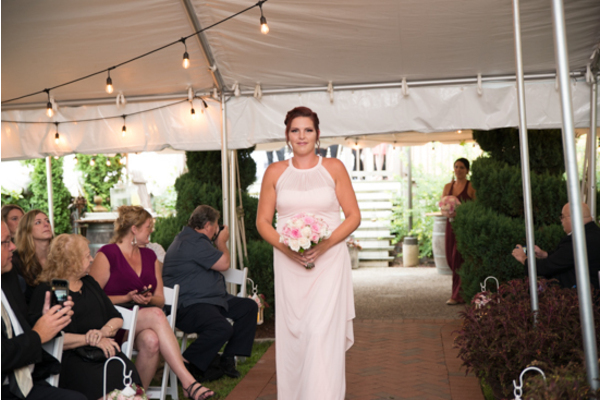 The ceremony took place outside and was decorated with lush greenery and candle lit lanterns. 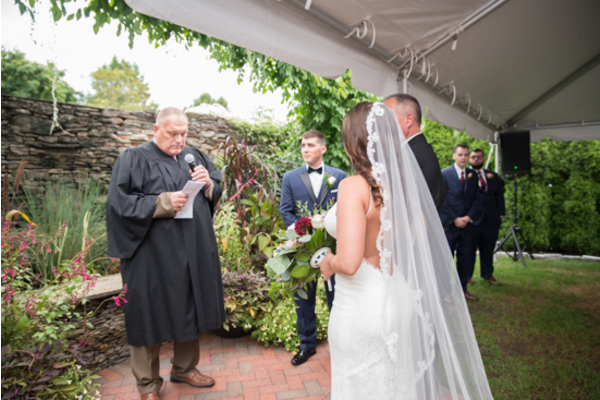 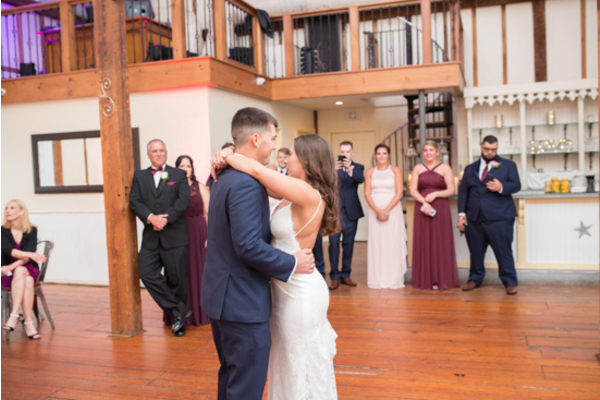 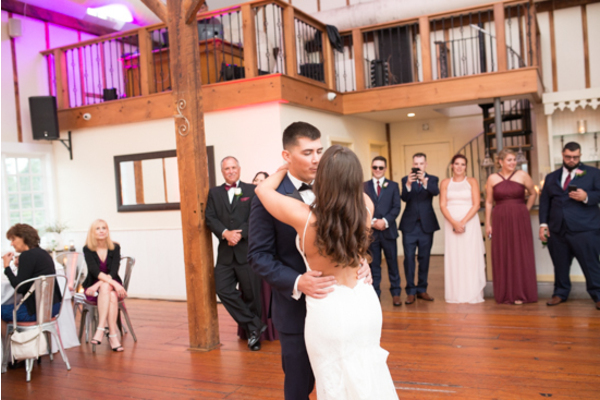 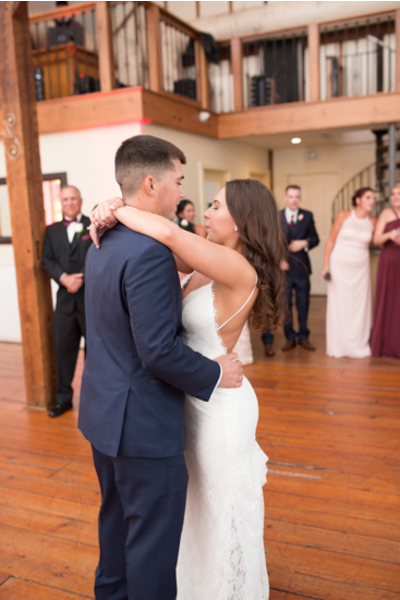 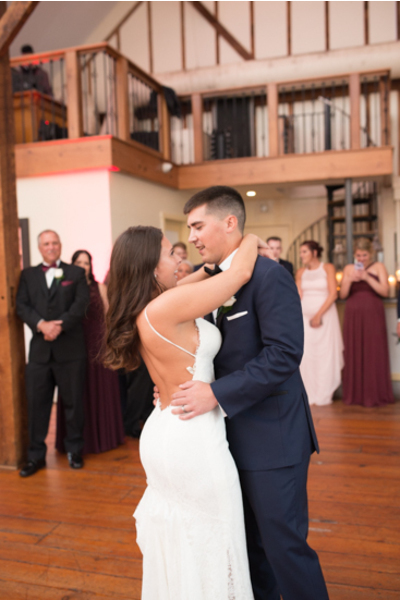 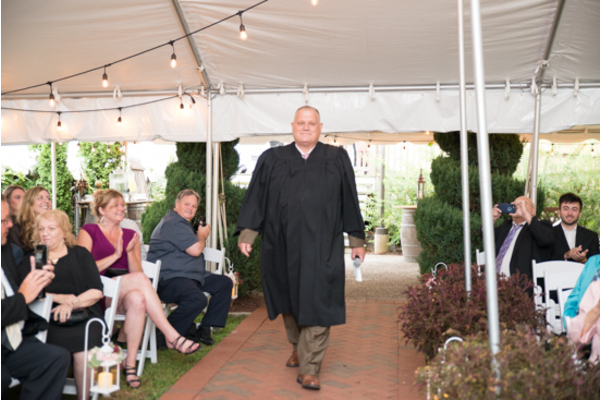 Our PA Wedding Photographer was there as the bride and groom read their vows and said “I Do.” Keith kissed his bride and they went hand-in-hand back down the aisle! 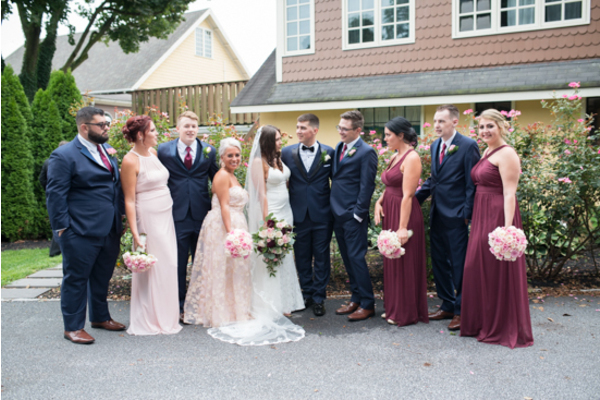 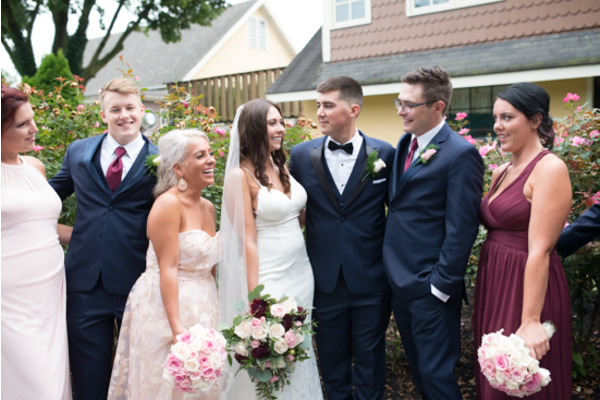 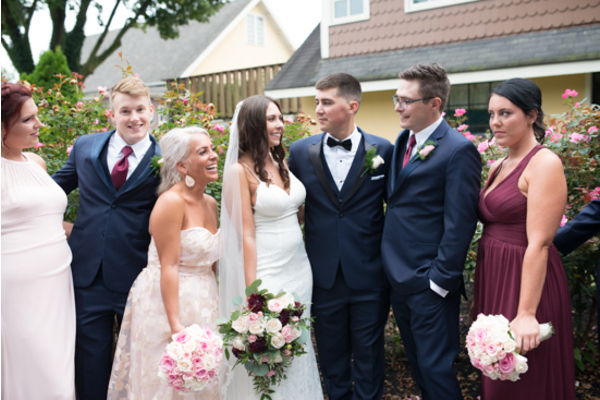 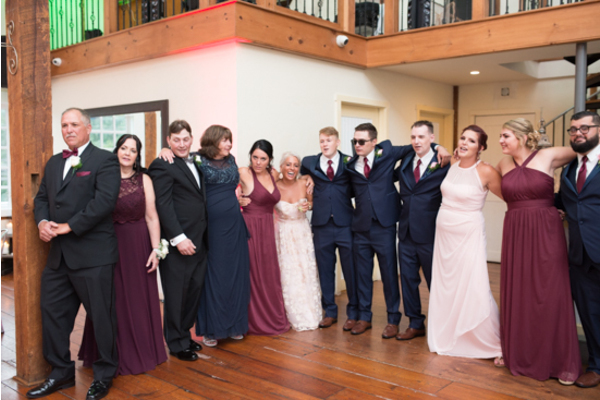 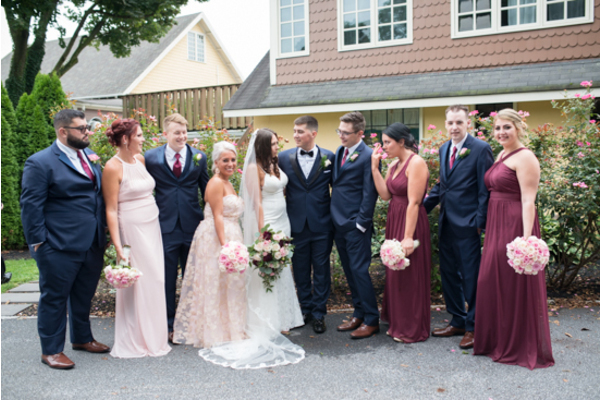 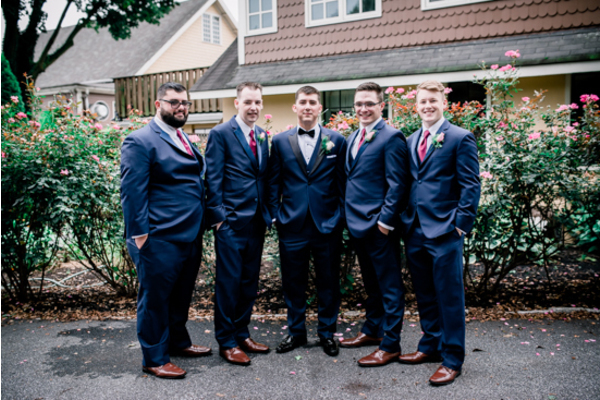 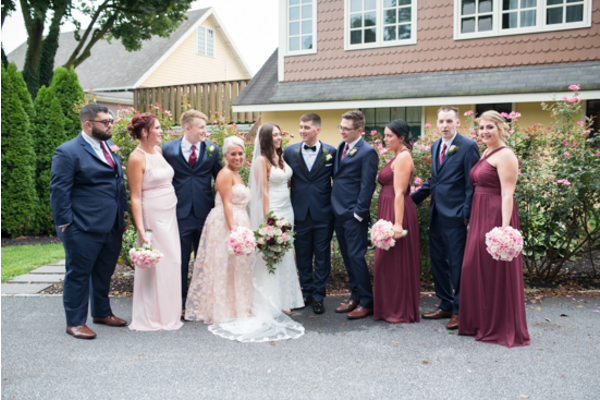 The bridal party dressed in pink, marsala, and navy blue joined the newlyweds for some photos before heading to the reception. 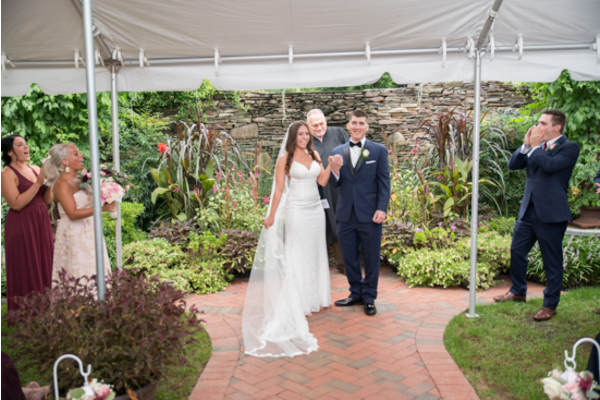 The venue grounds made for the most amazing background for the couple’s romantic pictures together. 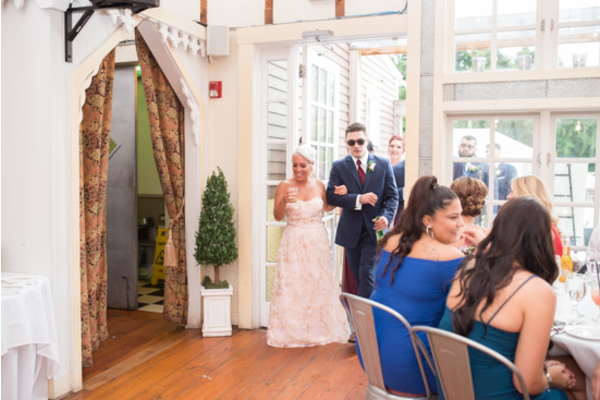 Inside, they kicked off the party right away with some dancing! 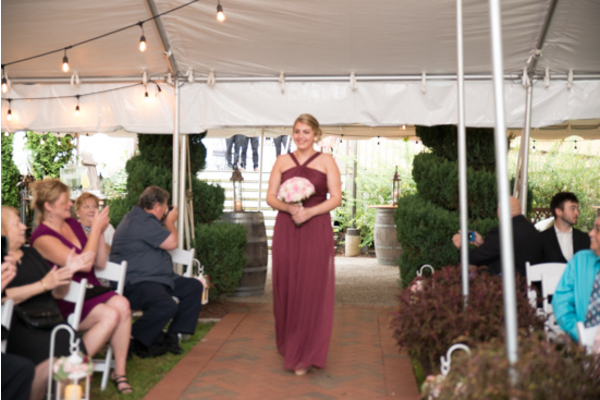 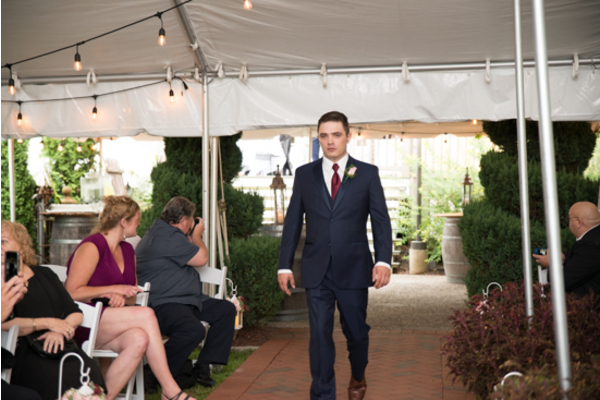 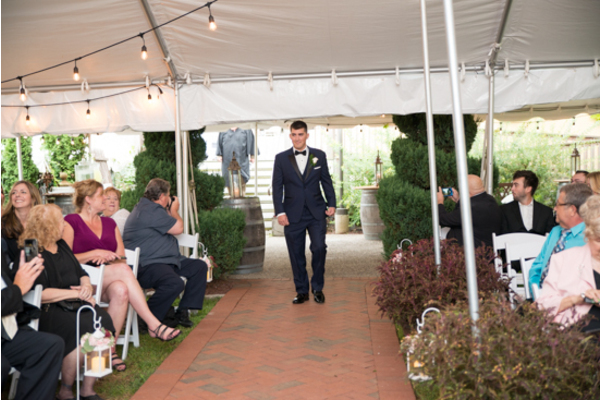 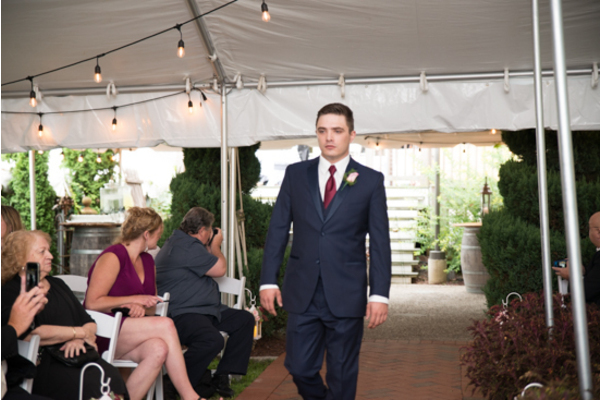 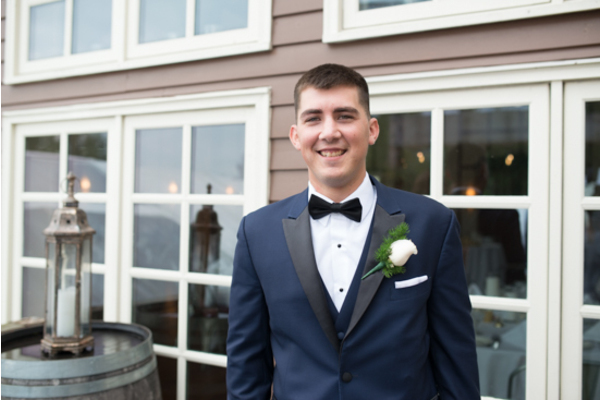 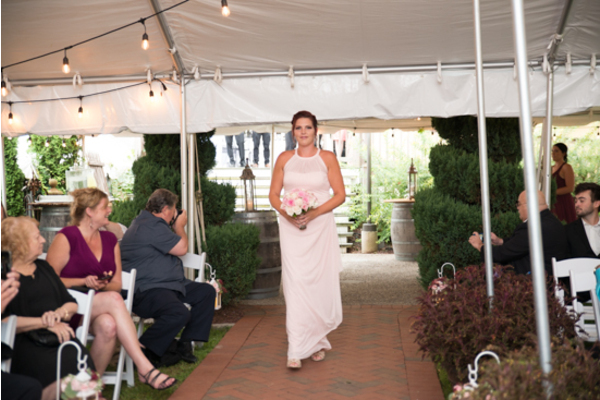 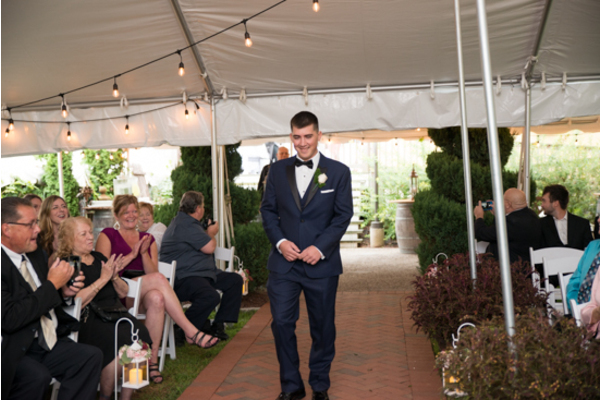 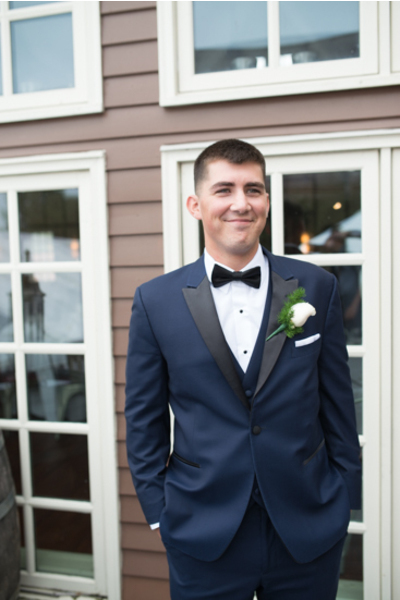 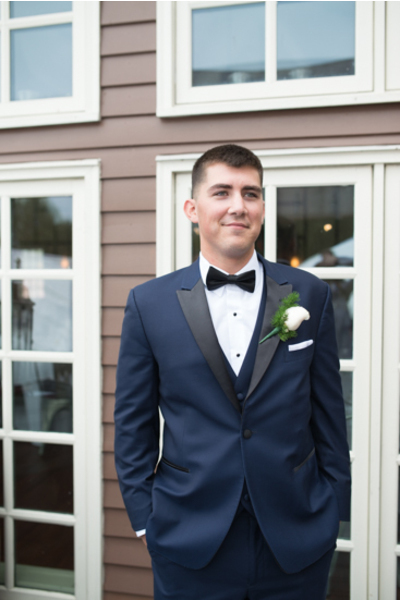 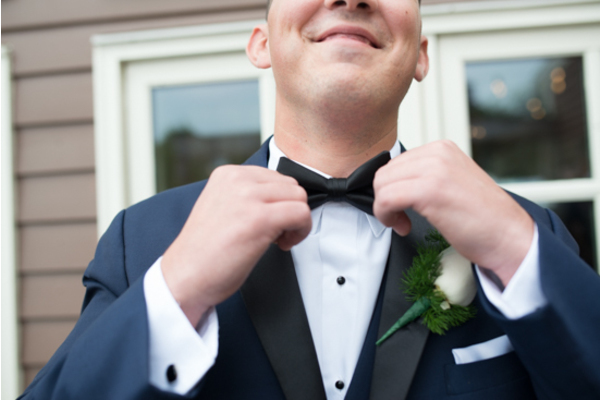 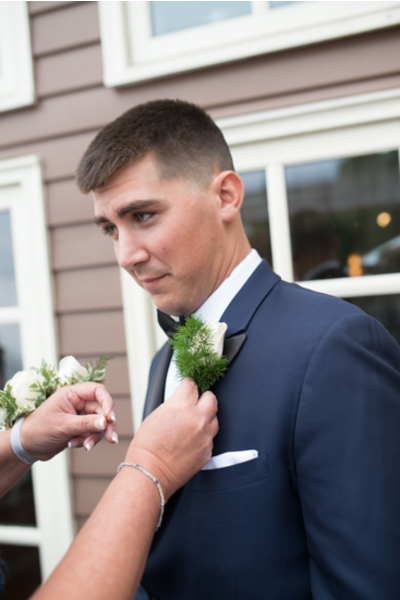 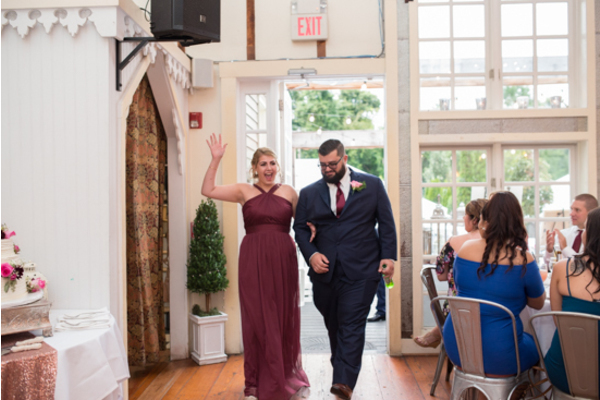 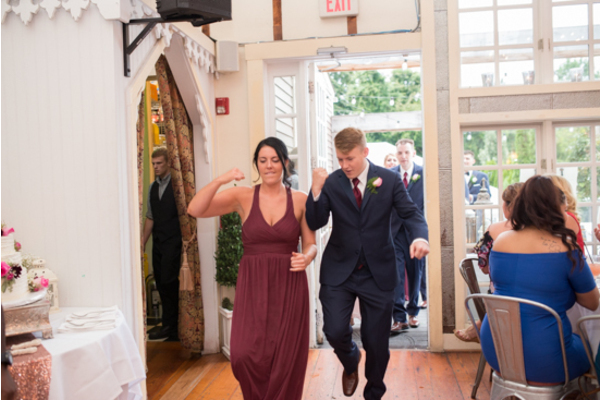 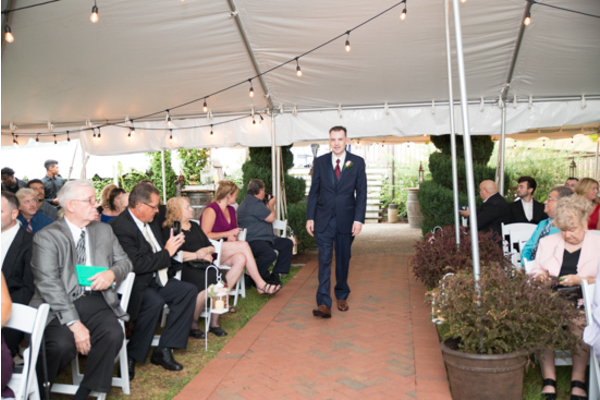 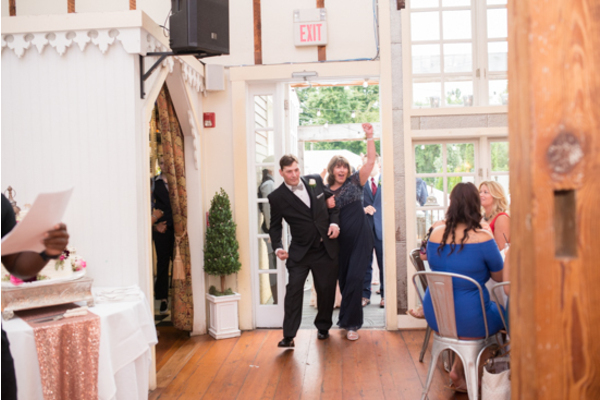 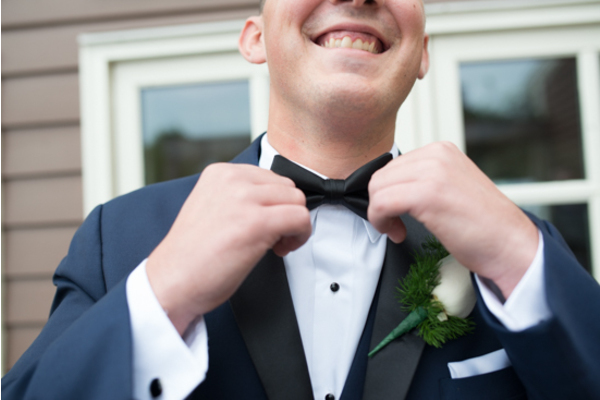 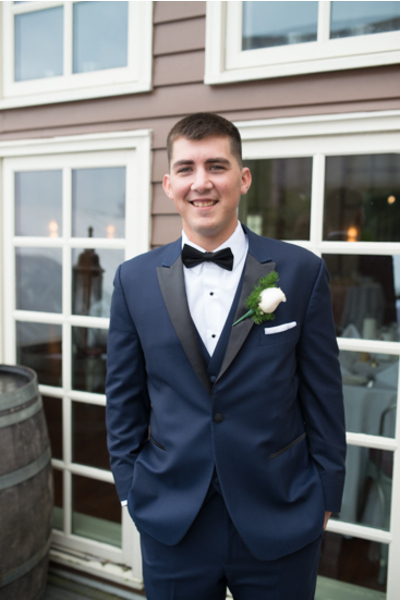 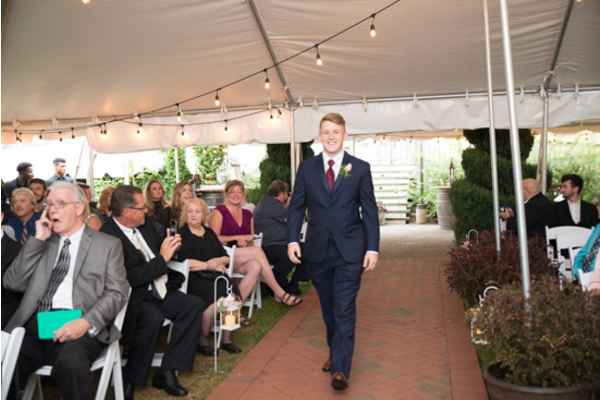 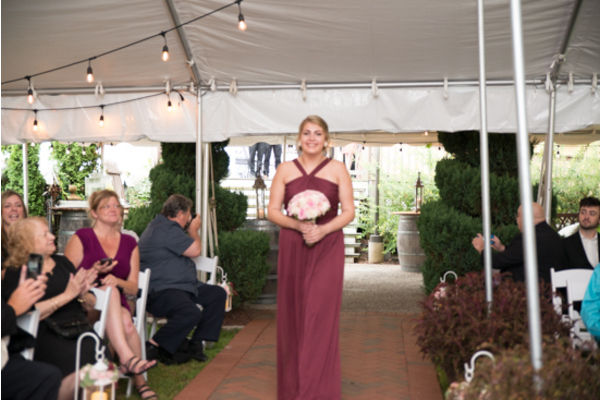 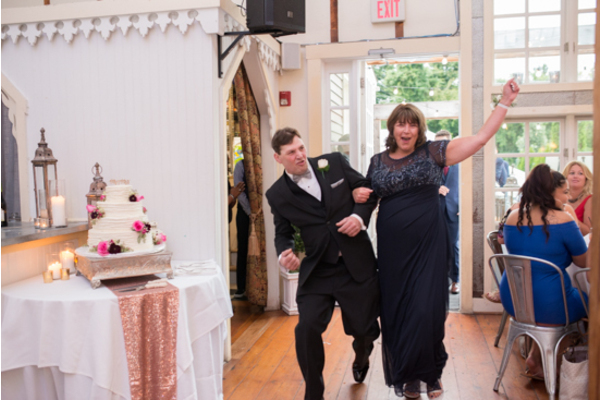 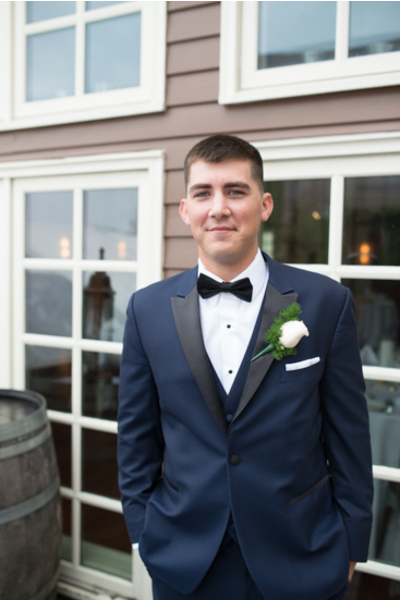 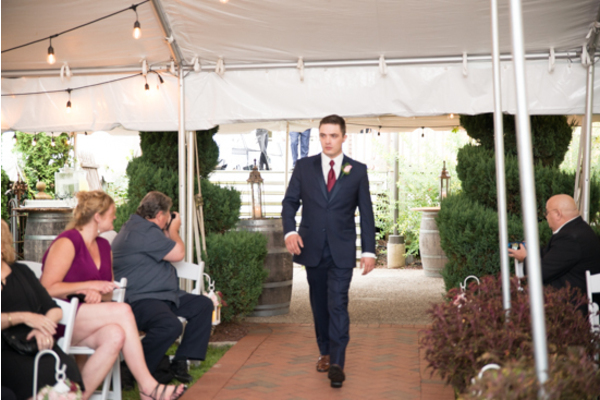 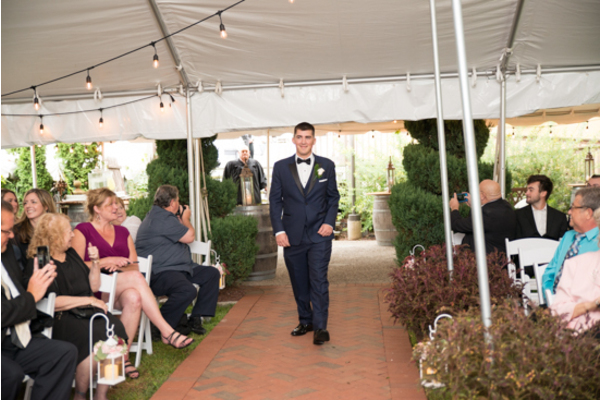 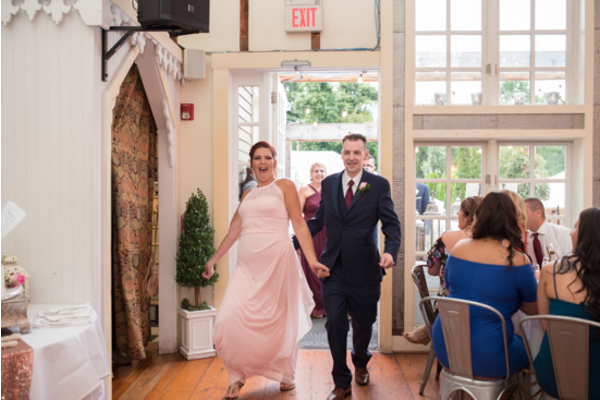 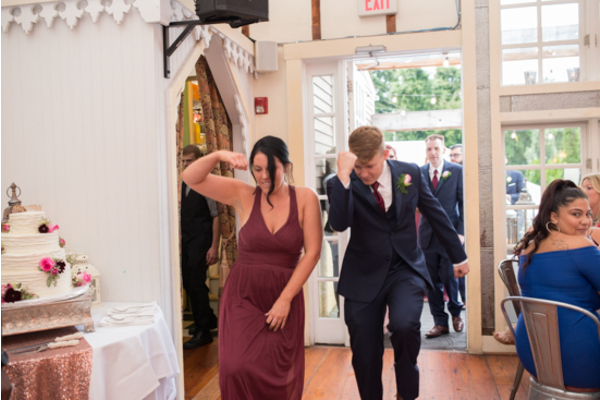 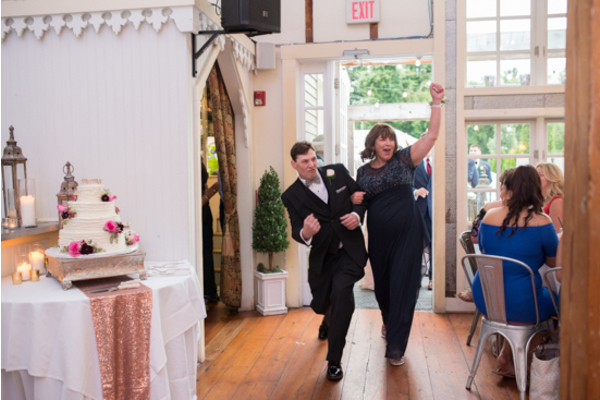 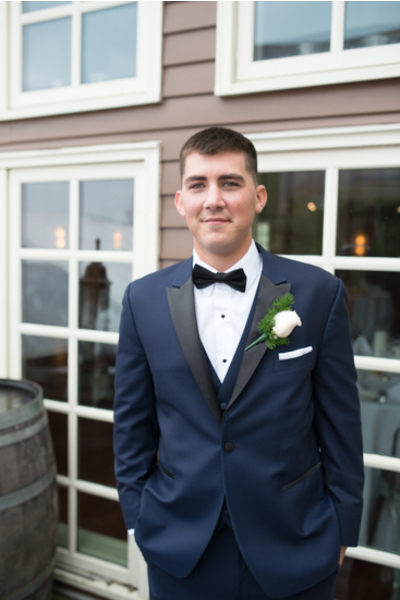 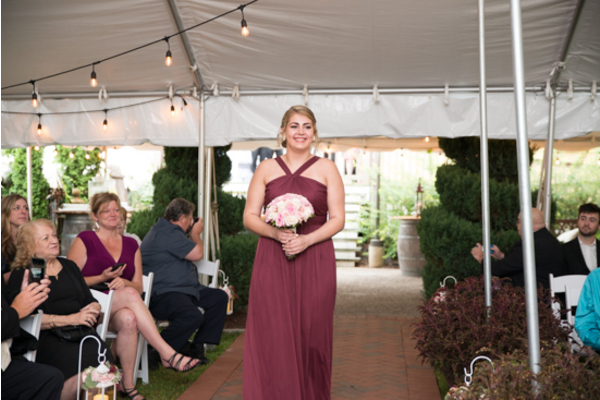 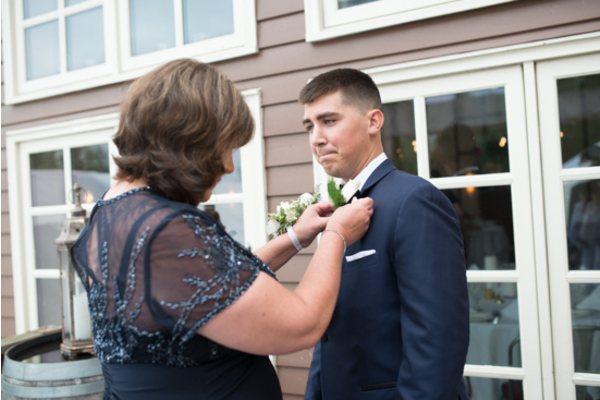 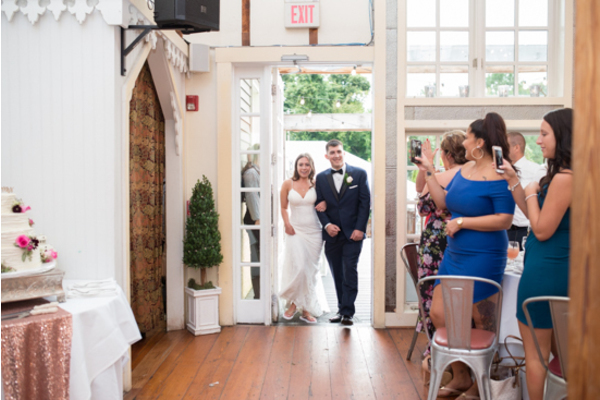 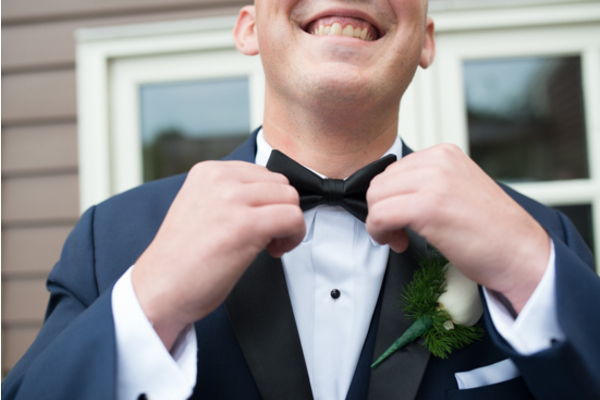 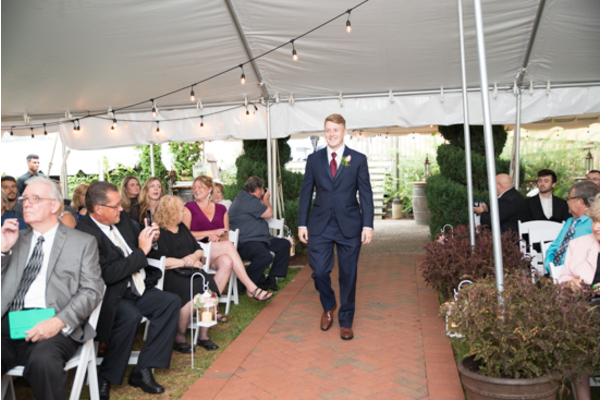 Our PA Wedding Photographer was there for it all! 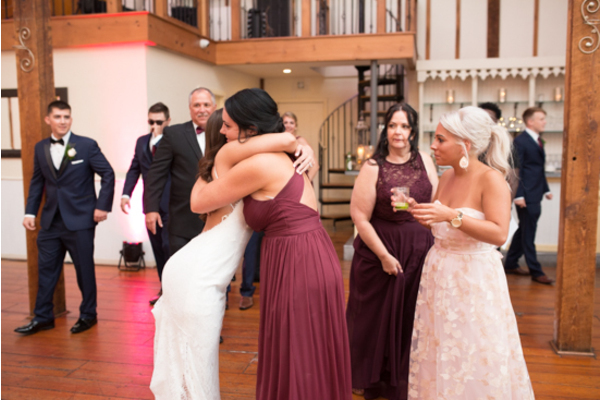 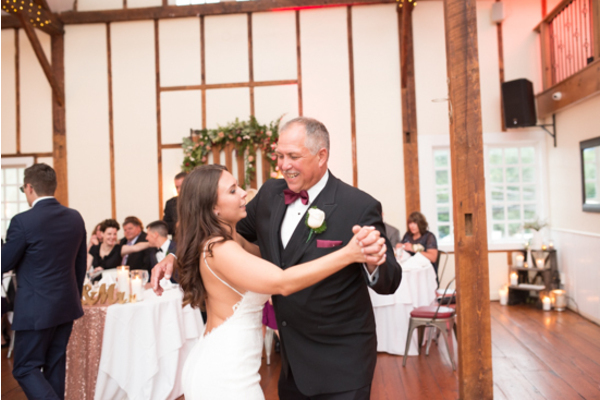 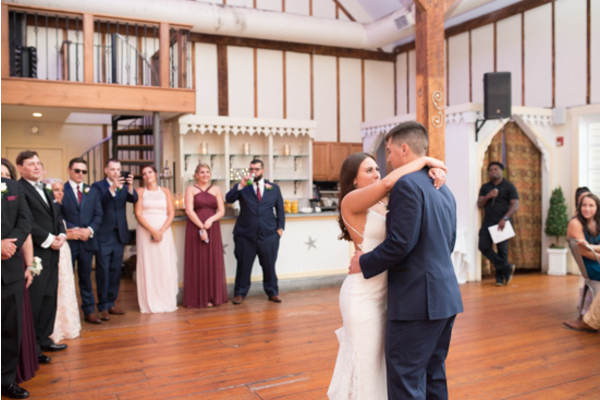 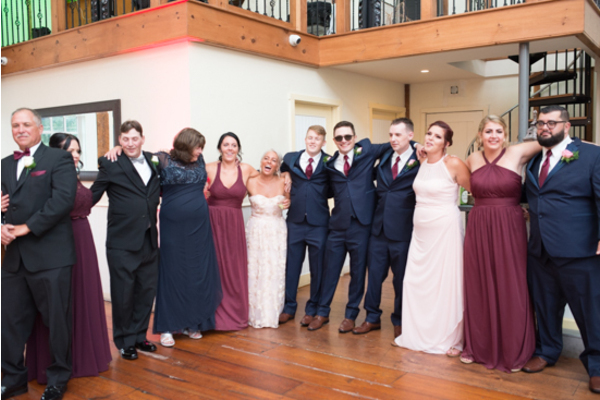 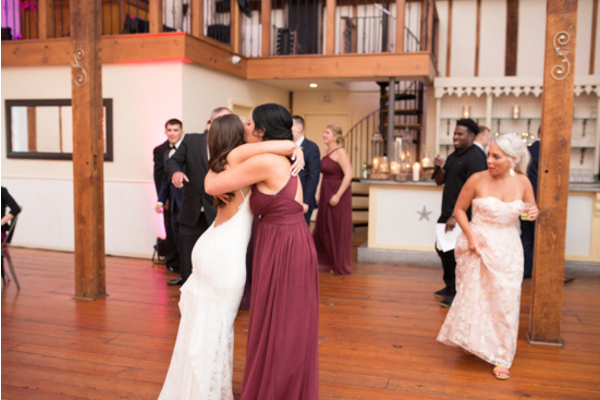 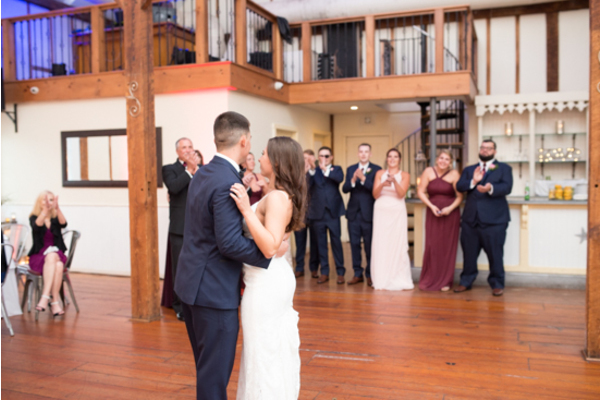 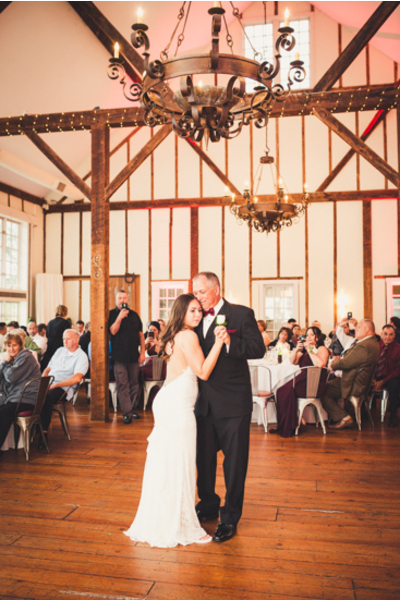 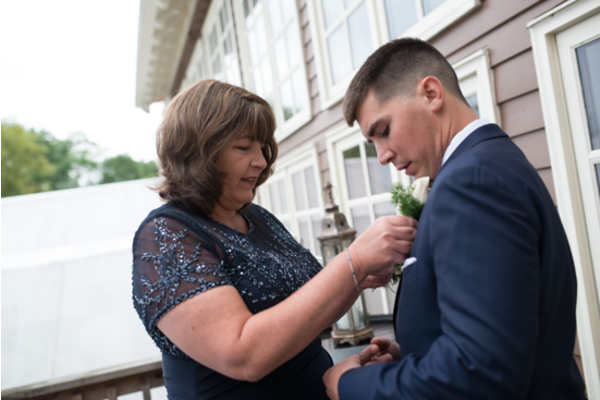 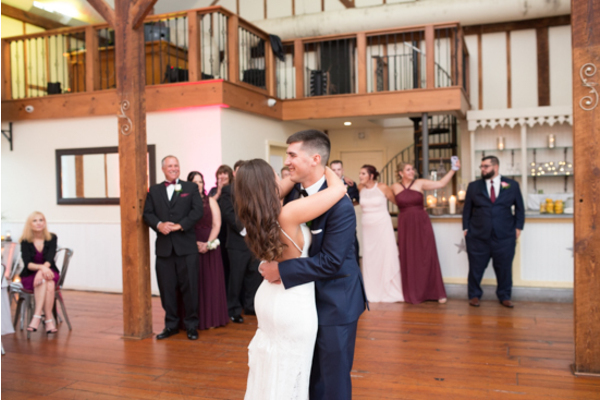 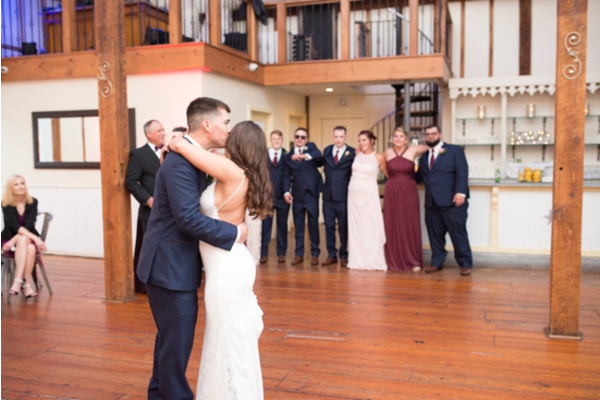 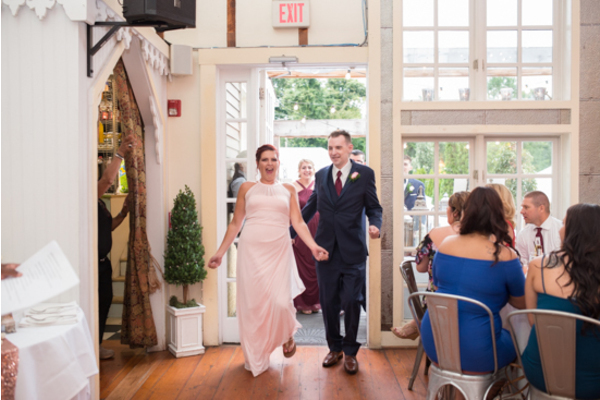 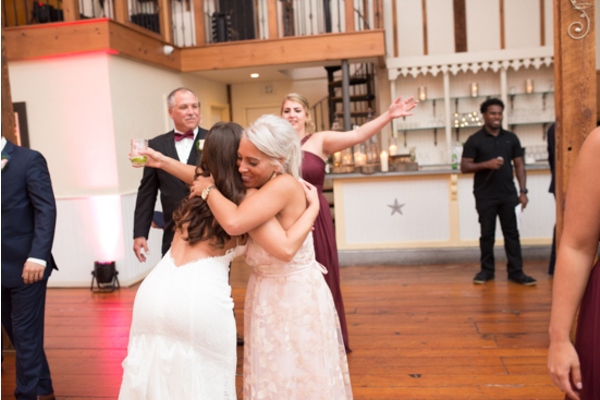 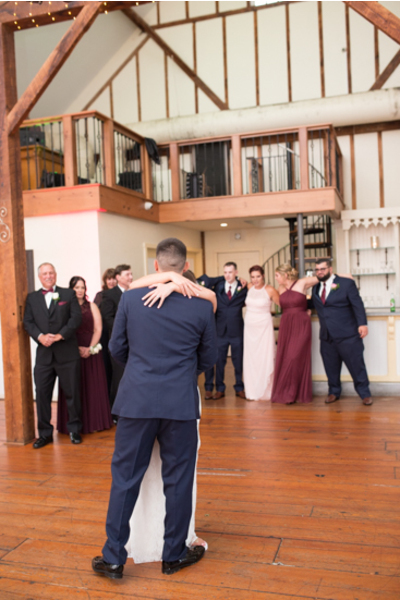 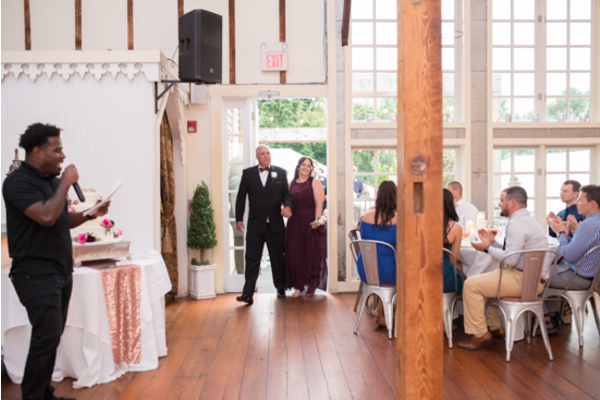 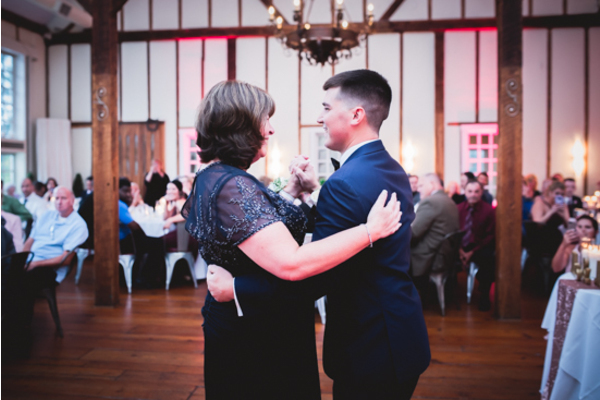 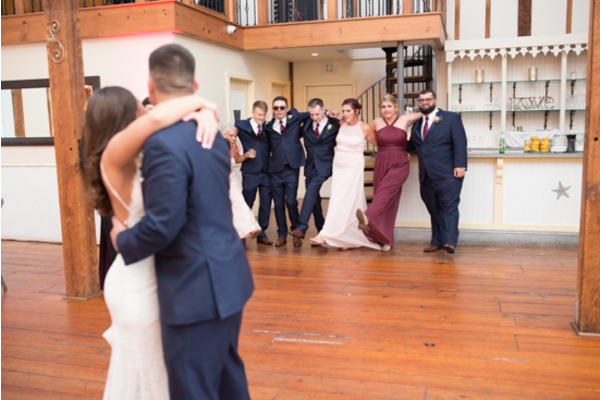 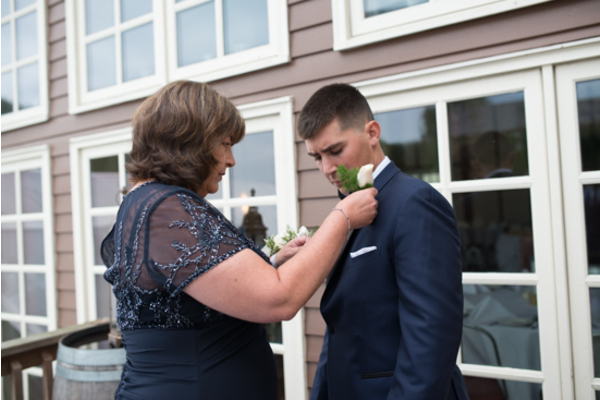 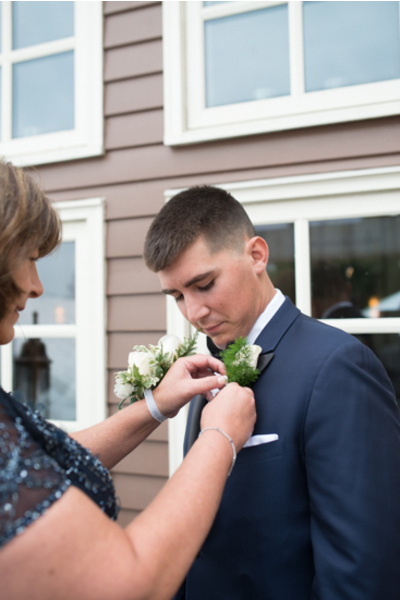 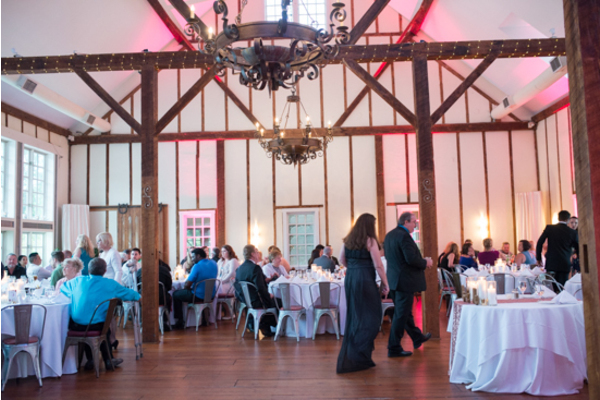 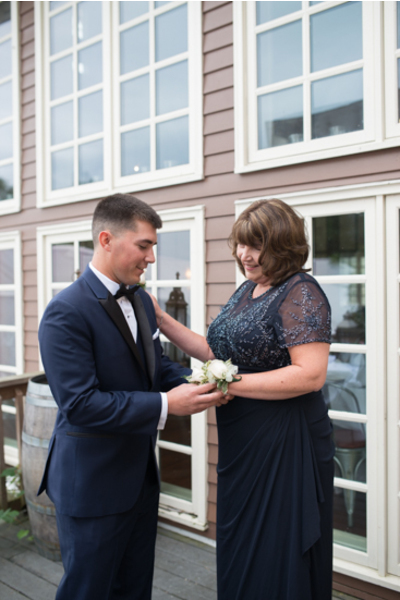 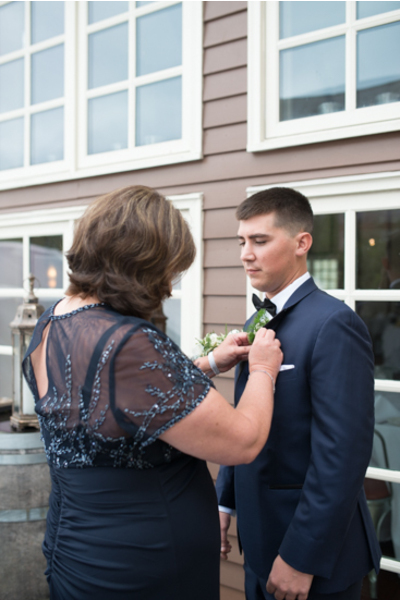 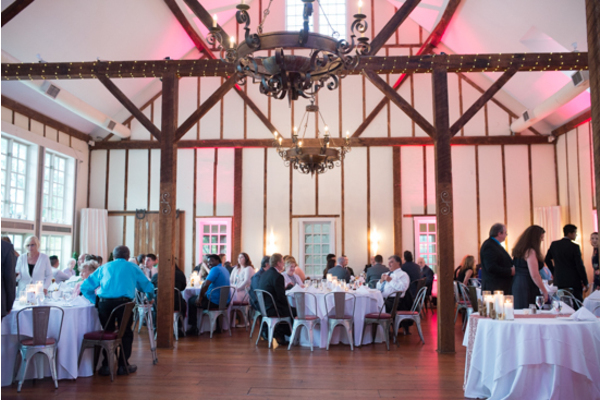 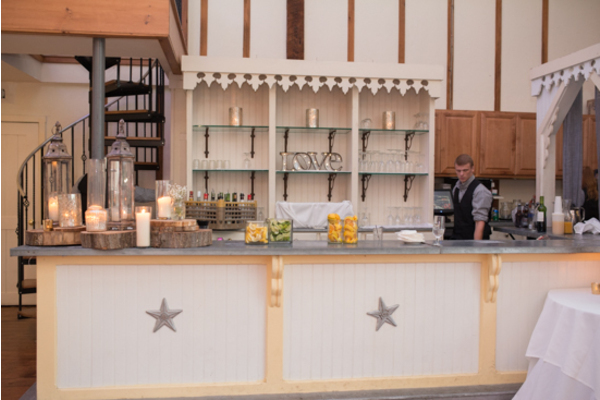 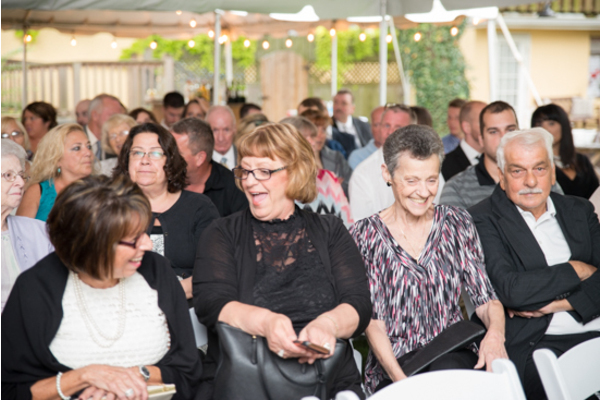 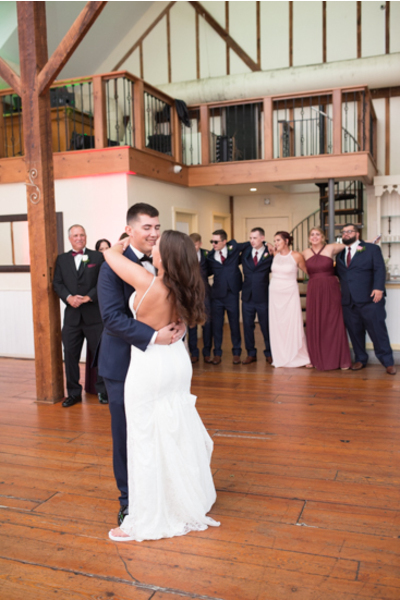 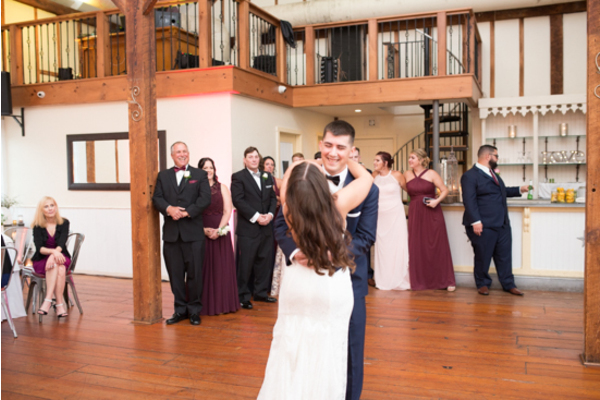 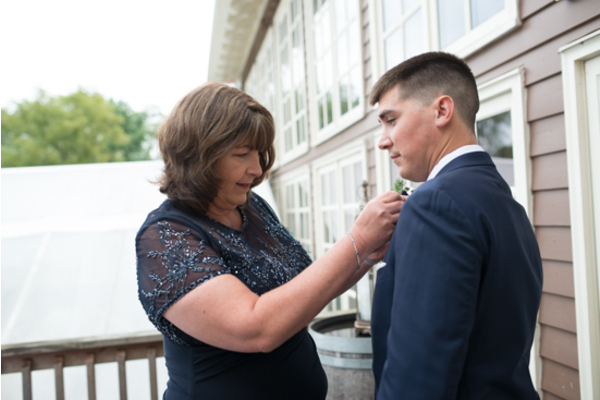 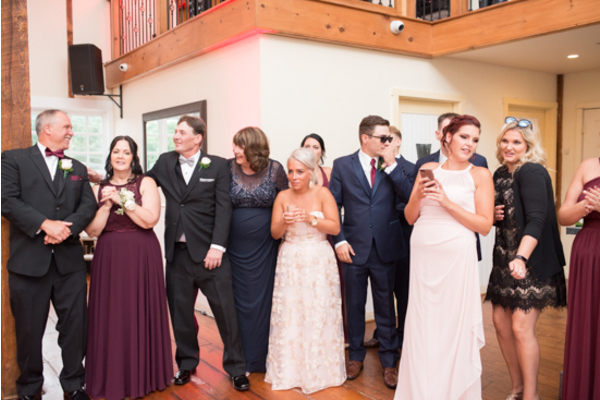 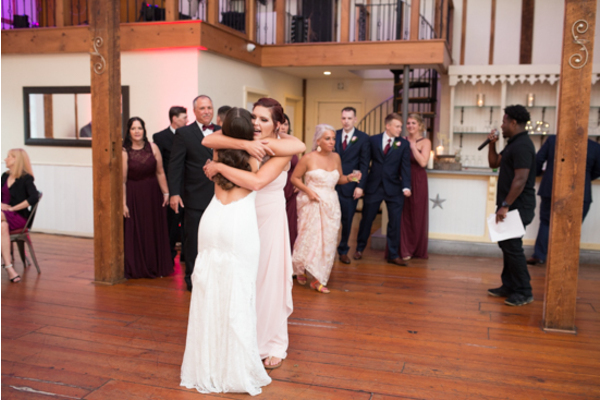 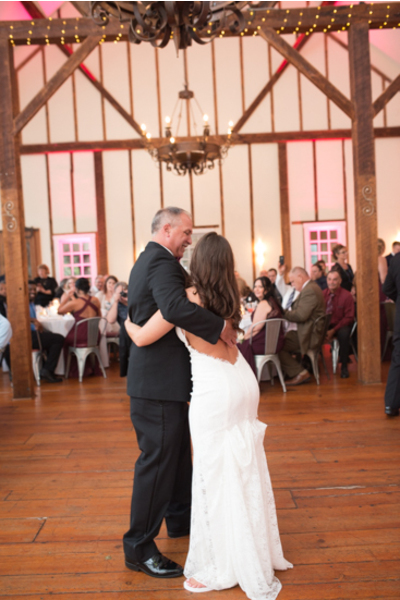 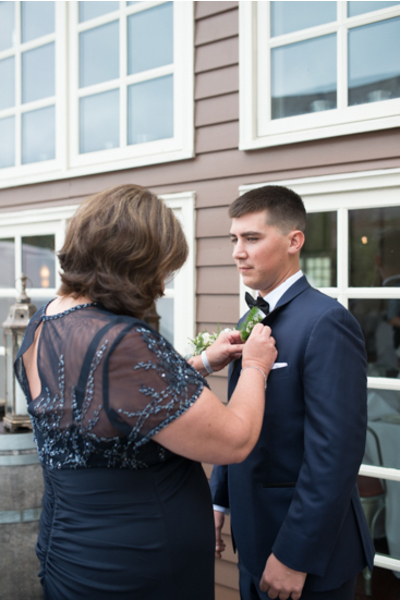 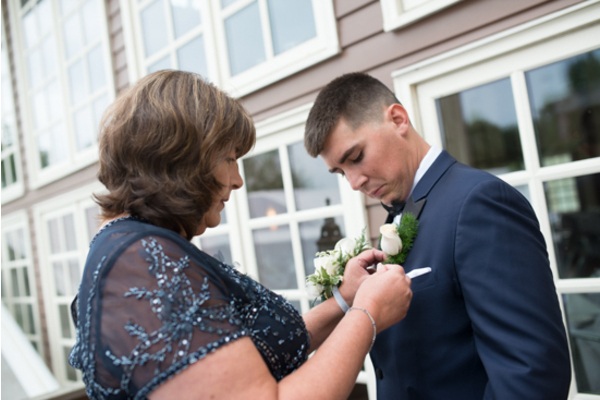 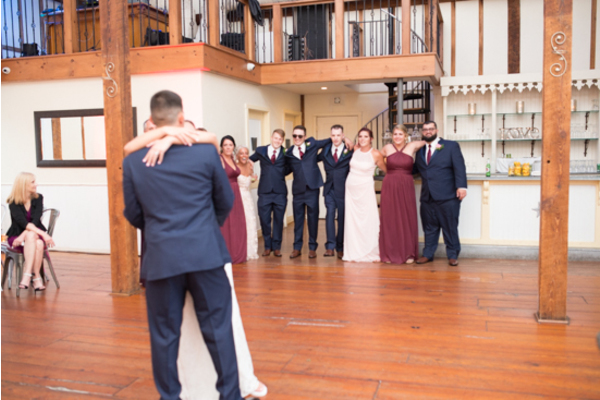 Friends and family had the night of their lives inside the barn during Michele and Keith’s wedding day. 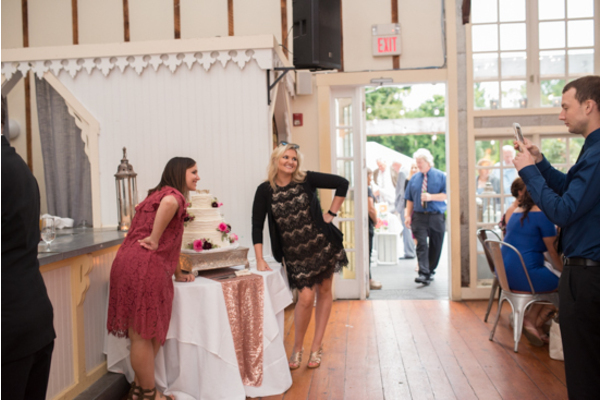 Soon it was every’s favorite time of the night, cake! 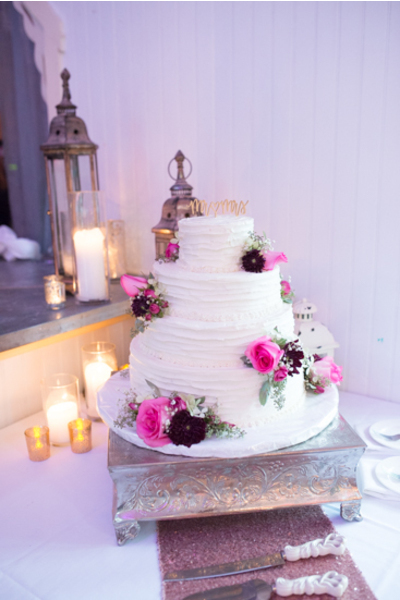 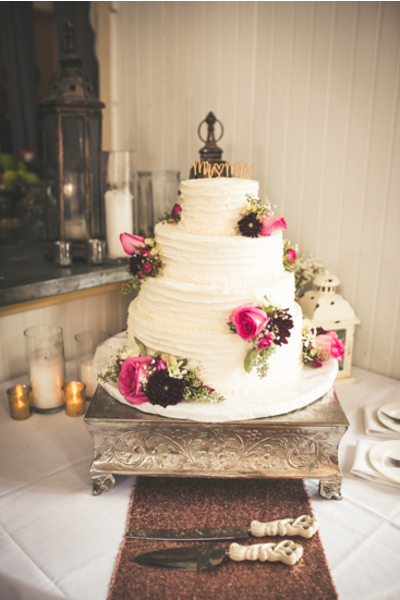 Four tiers of white with a topping that said “Mr. 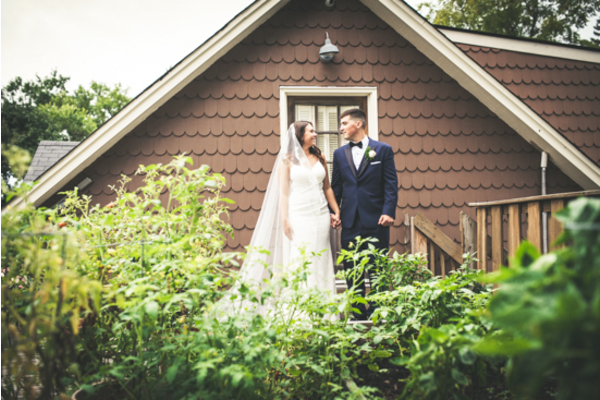 & Mrs” was the perfect, rustic addition. 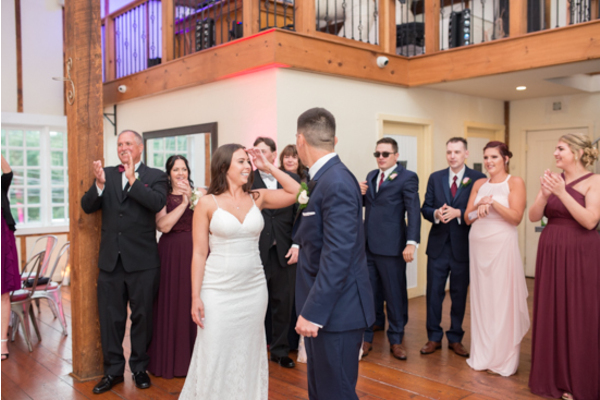 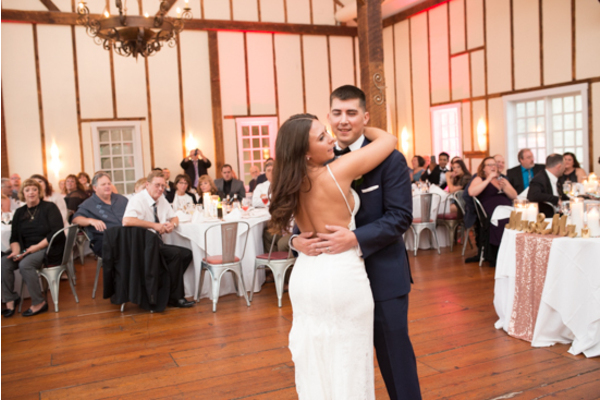 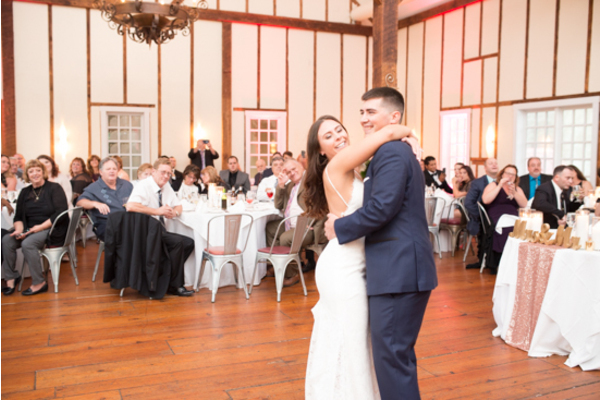 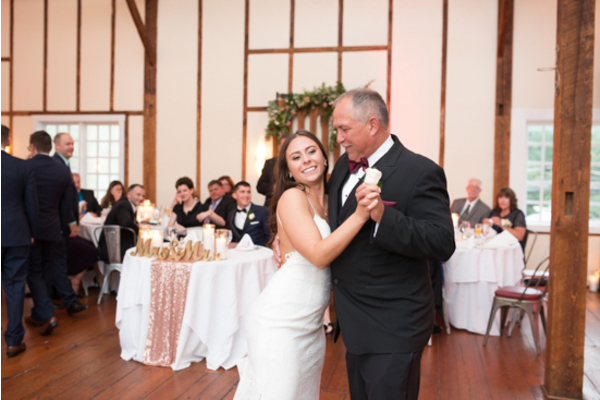 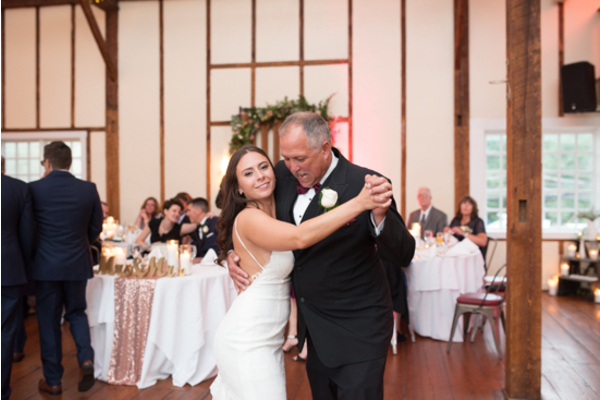 Guests laughed and danced the night away as the celebrated the newlyweds. 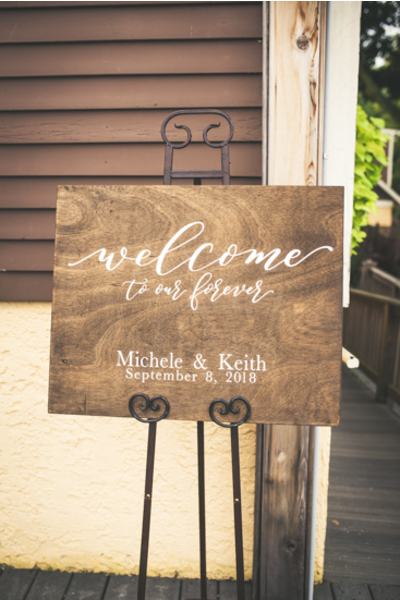 Congratulations, again, to Michele and Keith! 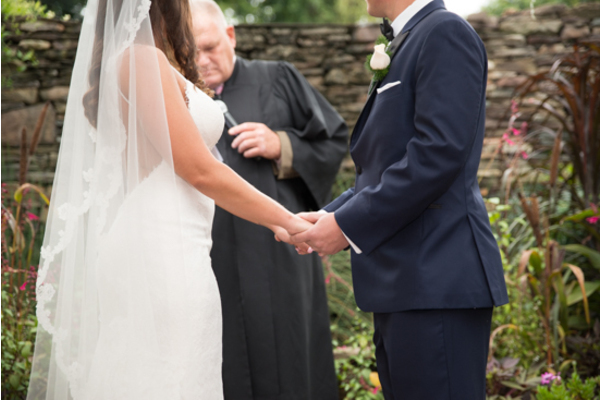 What a joy it was to be a part of your day, we wish you forever happiness!